This catalog is also available as a PDF file. 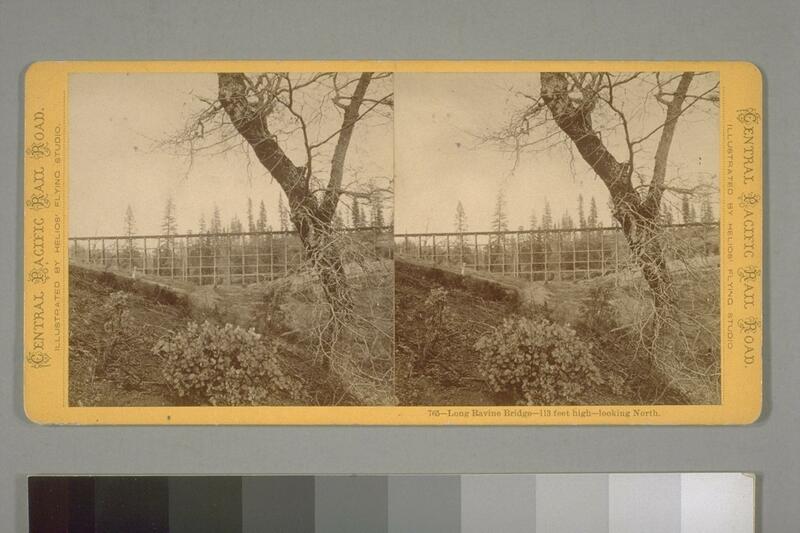 027 Muybridge: Charles Crocker Residence, San Francisco. 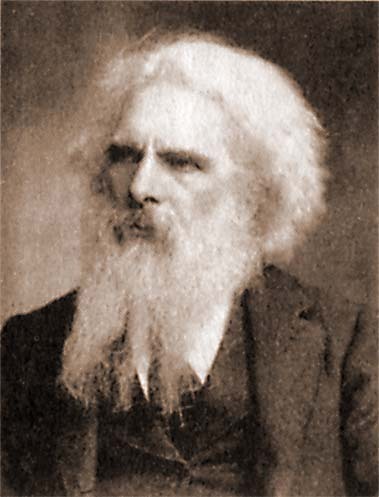 028 Muybridge: -, San Francisco. 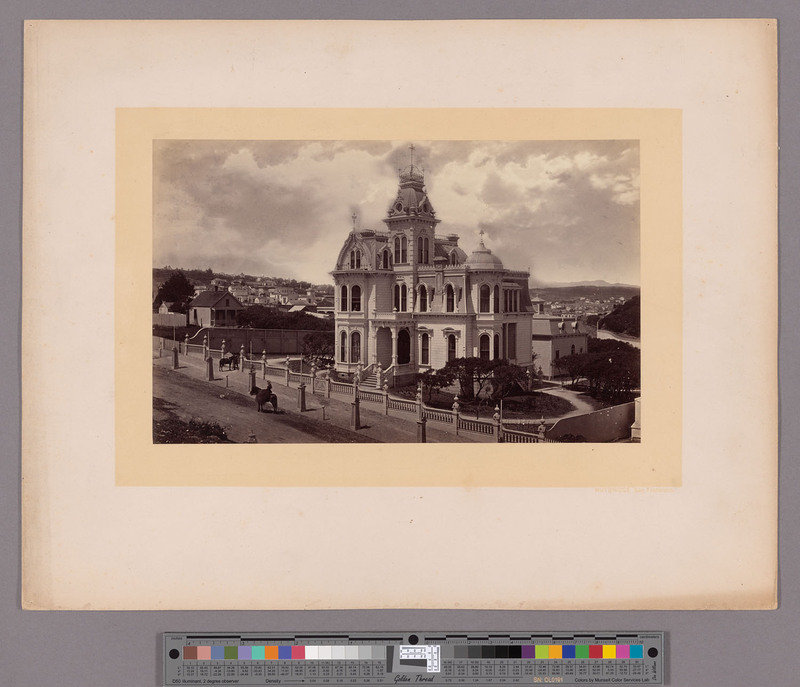 036 Muybridge: -Front Elevation- S.C.Bugbee & Son - Architects - [San Francisco]. 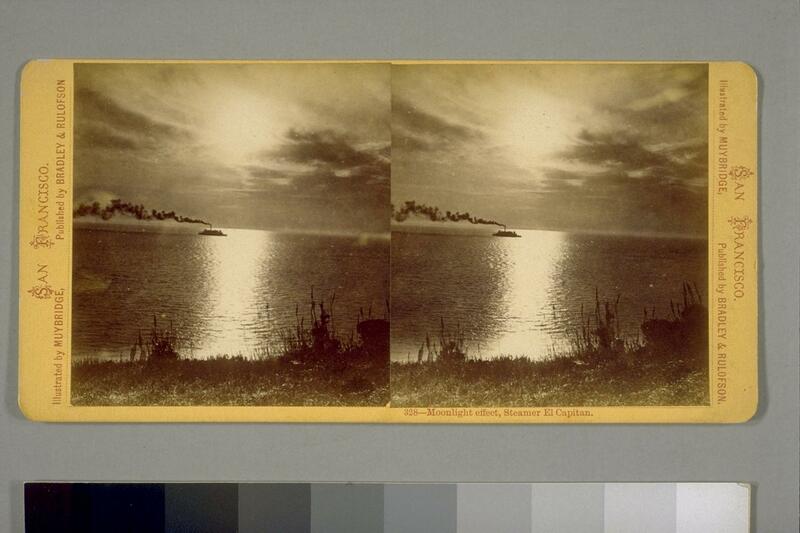 328 Muybridge: Moonlight effect, Steamer El Capitan. 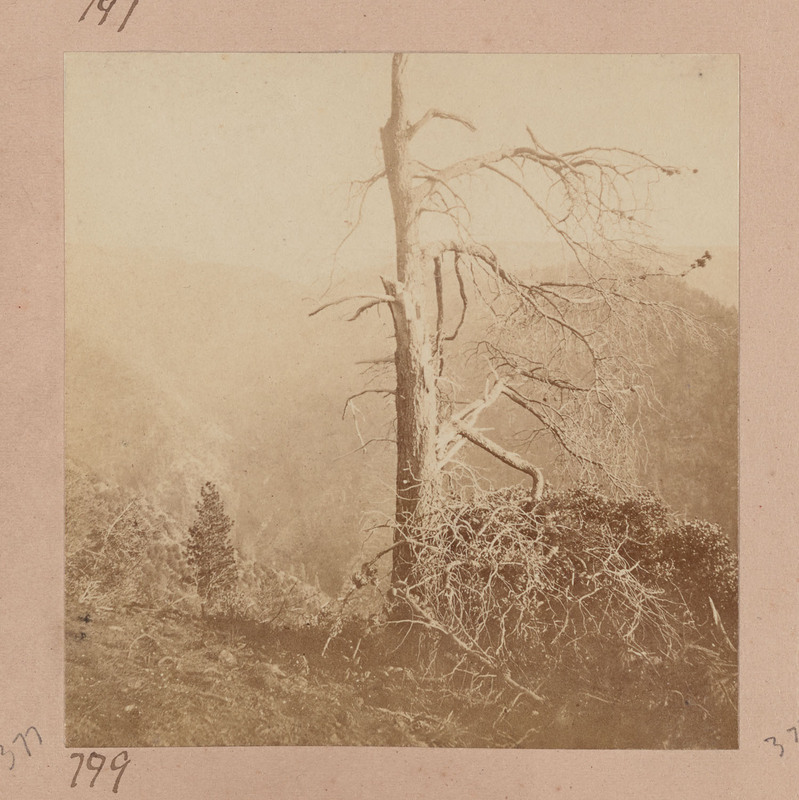 CATALOG ofPhotographic Views Illustrating The Yosemite, Mammoth Trees, Geyser Springs, and other remarkable and Interesting Scenery of the Far West, By MUYBRIDGE.Published by BRADLEY & RULOFSON, Gallery of Portrait and Landscape Photographic Art, 429 Montgomery Street, San Francisco, California. 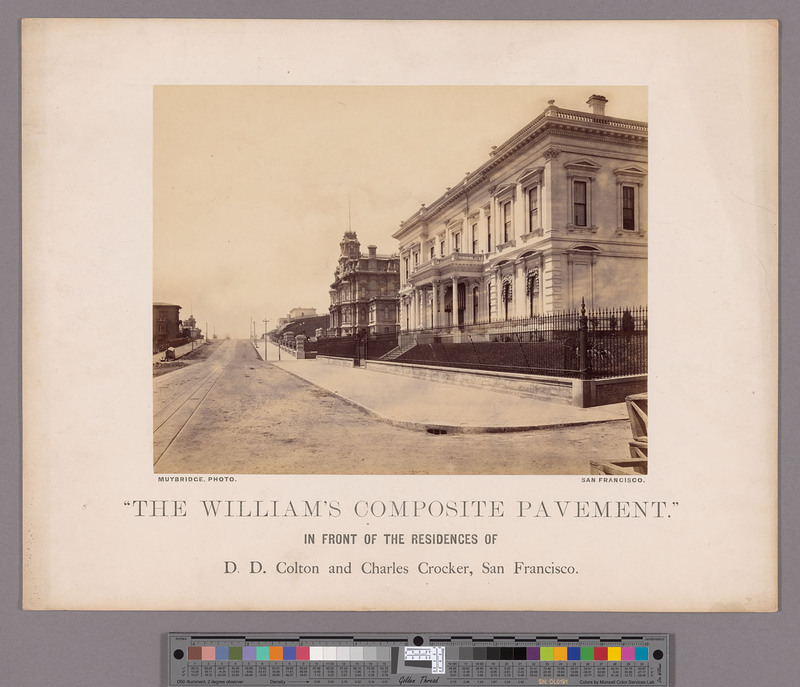 Francis & Valentine, Printers, 517 Clay St., S. F., [June] 1873. This road extends from San Francisco to Ogden, a distance of 881 miles, and crosses the Sierra Nevada mountains at an elevation of 7,042 feet above sea level. 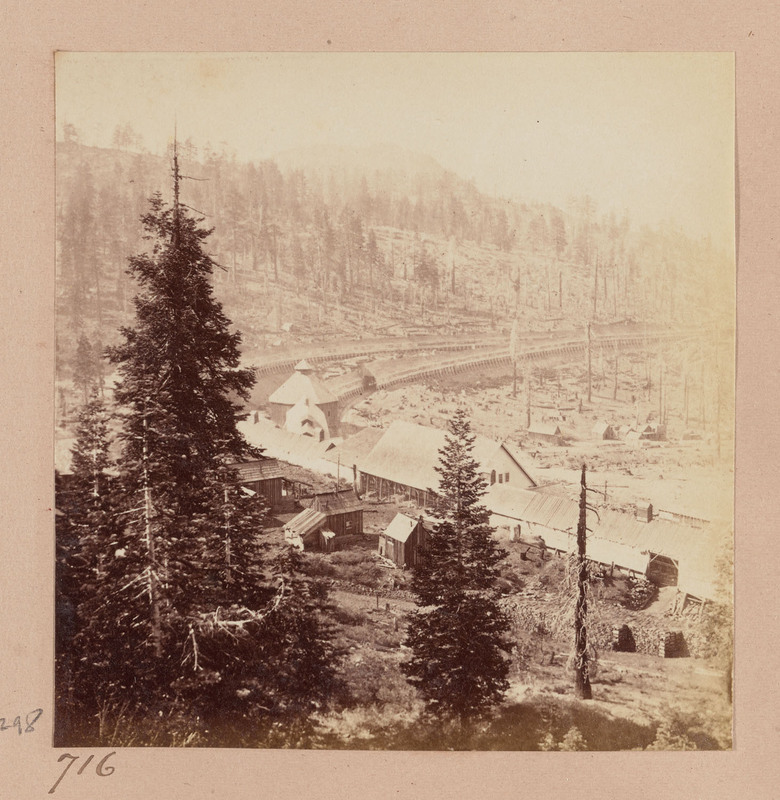 At Humboldt Palisades, on the banks of the Truckee, in the neighborhood of the Summit, Trianyon Point and Cape Horn, view of surpassing grandour abound; and in the immediate vicinity of the line, at Lake Tahoe, and Soda Springs are some of the finest mountain views in the world." 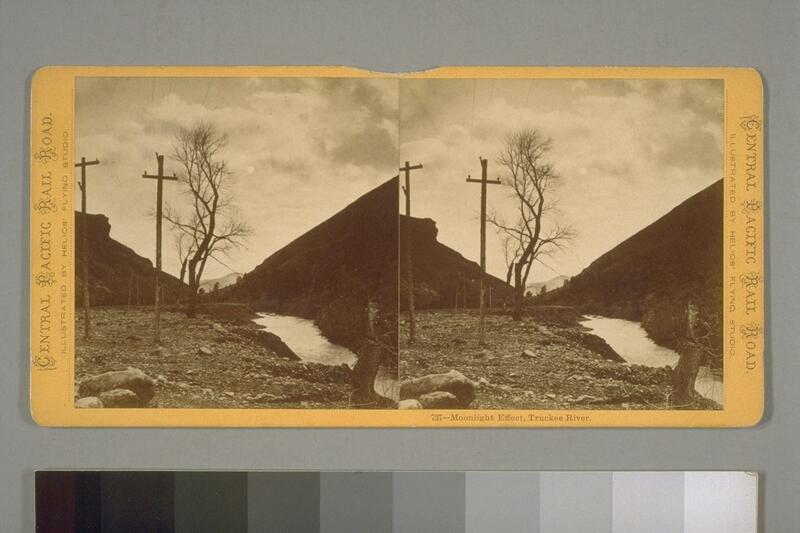 688 Muybridge: Snow Sheds, Western Summit Sierra Nevada Mountains. 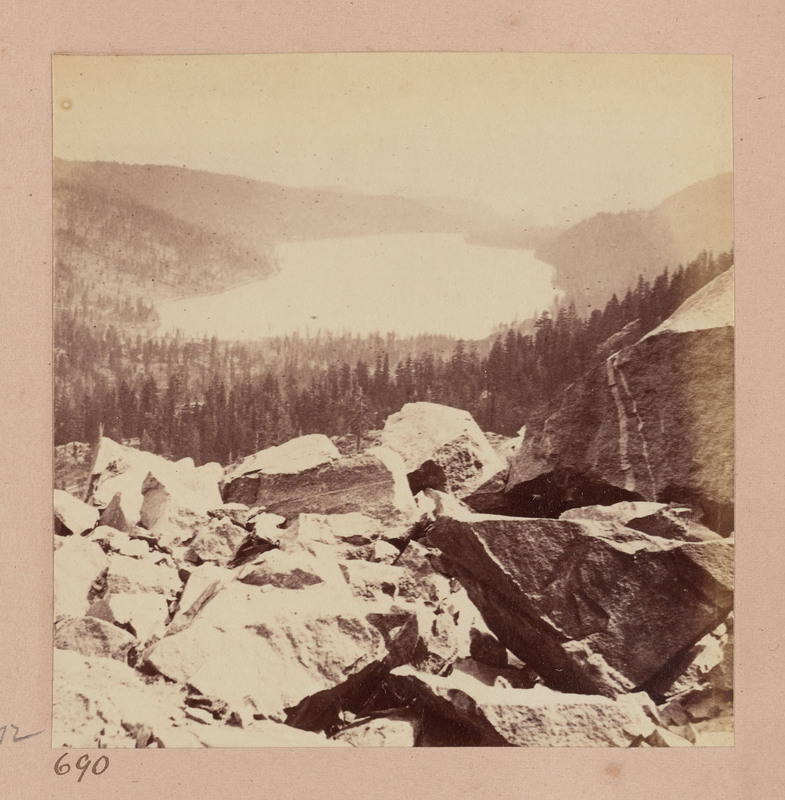 690 Muybridge: Lake Donner, from Western Summit Sierra Nevada Mountains, looking North. 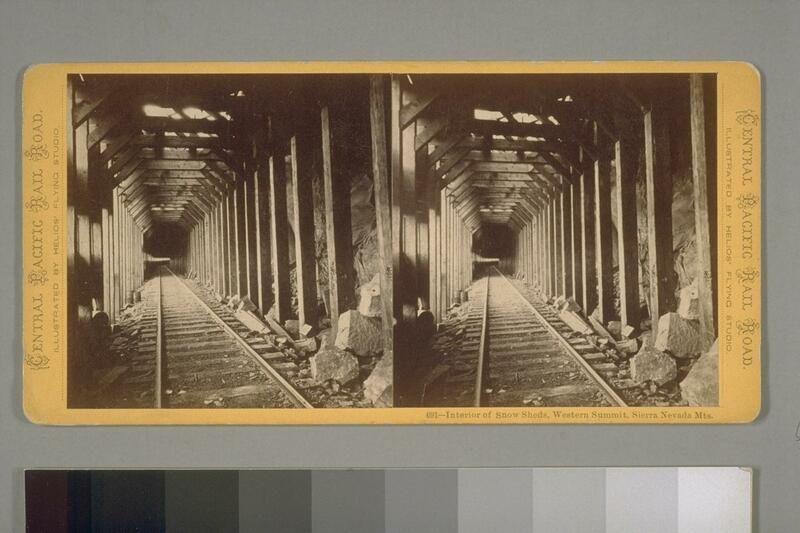 691 Muybridge: Interior of Snow Sheds, Western Summit Sierra Nevada Mountains. 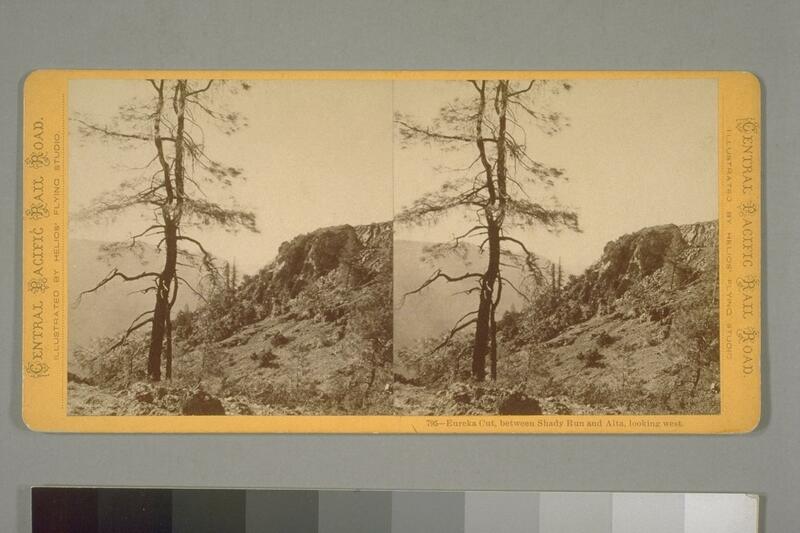 692 Muybridge: Lake Flora, (Crater of an extinct Volcano,) near Summit Valley, Sierra Nevada Mountains. 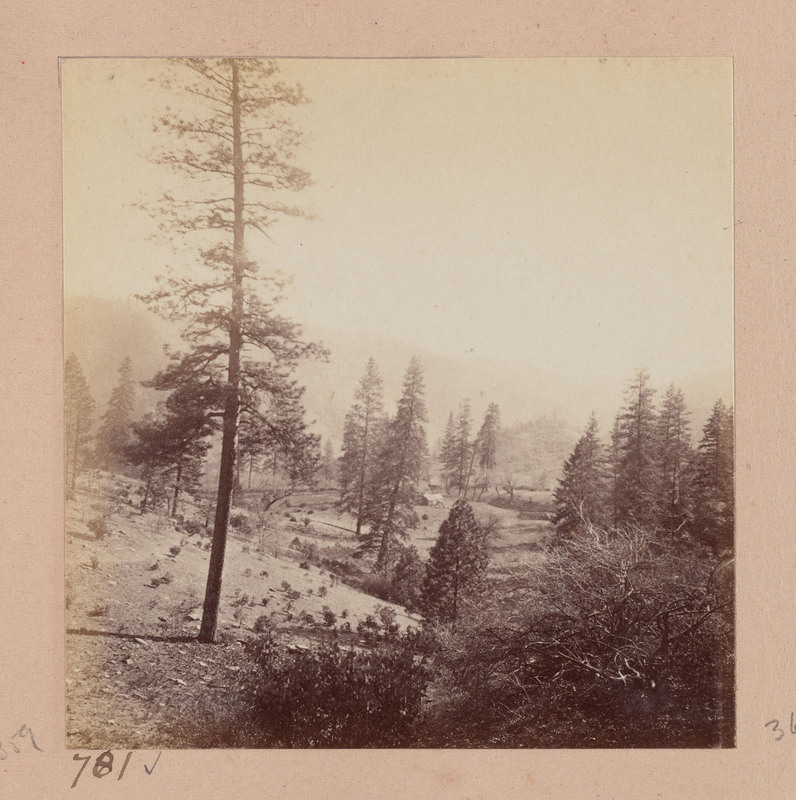 693 Muybridge: Mount Stanford, from Lake Flora, near Summit Valley, Sierra Nevada Mountains. 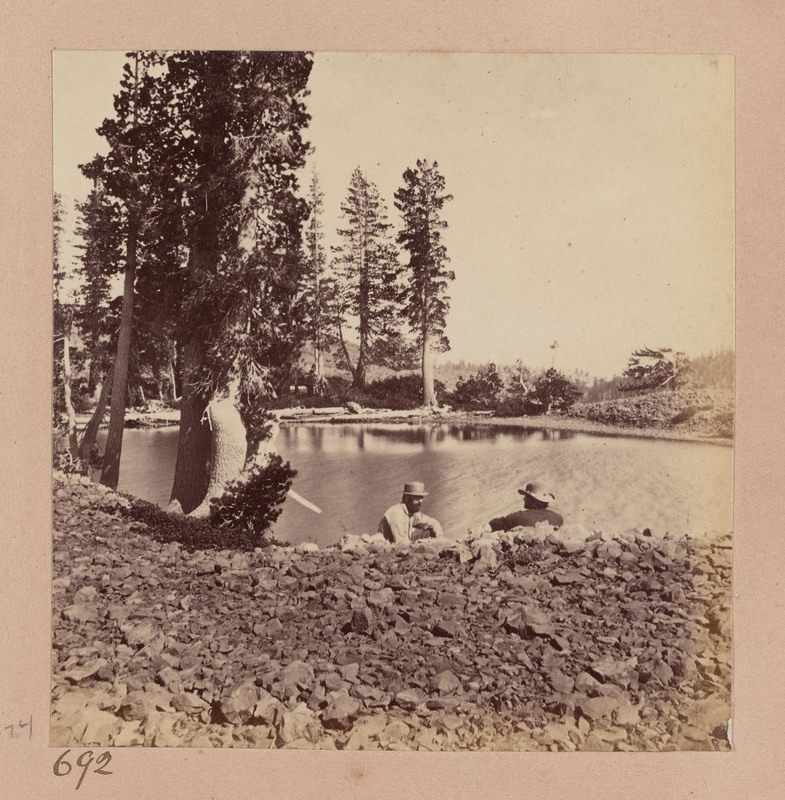 694 Muybridge: Lake Flora, (Crater of an extinct Volcano,) near Summit Valley. Mount Stanford in the distance. Bancroft Library lists title as: "Lake Flora, (crater of an extinct volcano), near Western Summit, Sierra Nevada Mountains, Mt. 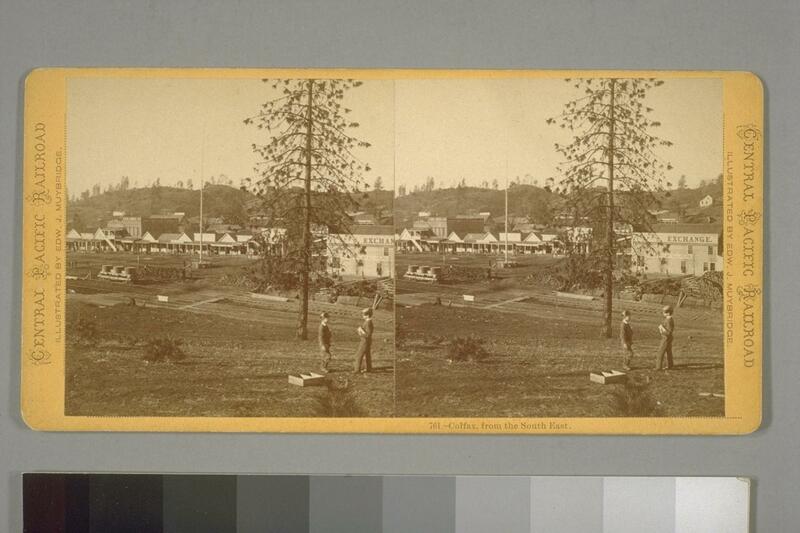 Stanford in the distance, looking south." 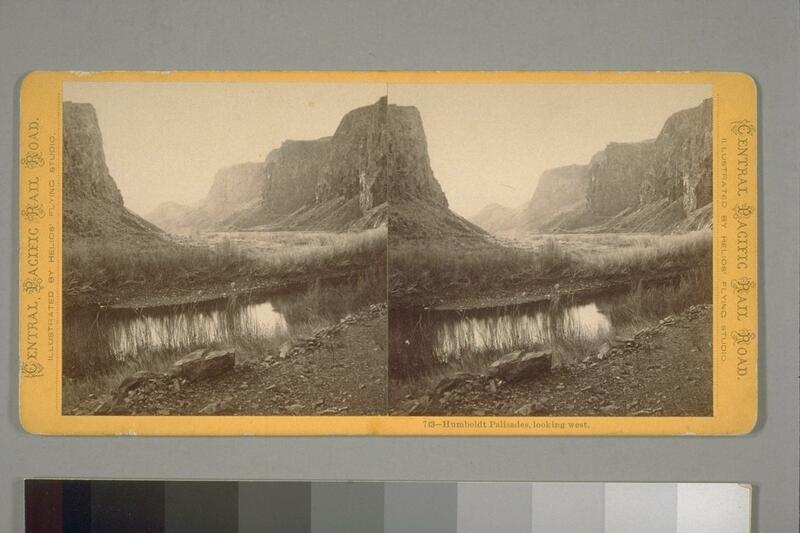 695 Muybridge: Lake Flora, (Crater of an extinct Volcano,) near Summit Valley. Mount Crocker in the distance, looking South. 696 Muybridge: Mount Crocker, looking South from Lake Flora, (Crater of an extinct Volcano,) near Summit Valley. 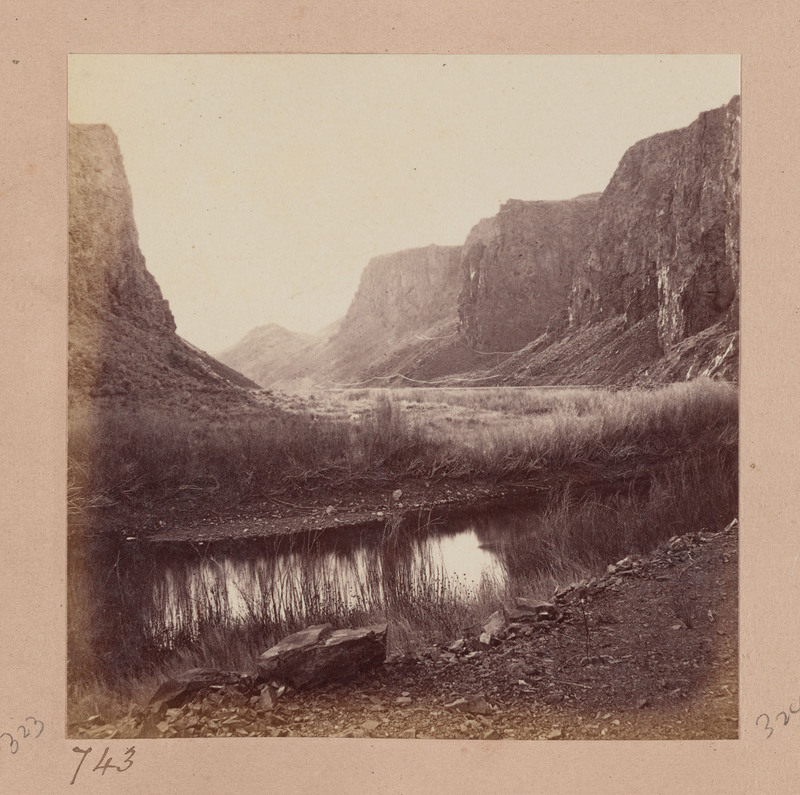 697 Muybridge: Lake Flora, (Crater of an extinct Volcano,) near Summit Valley. Mount Crocker in the distance. 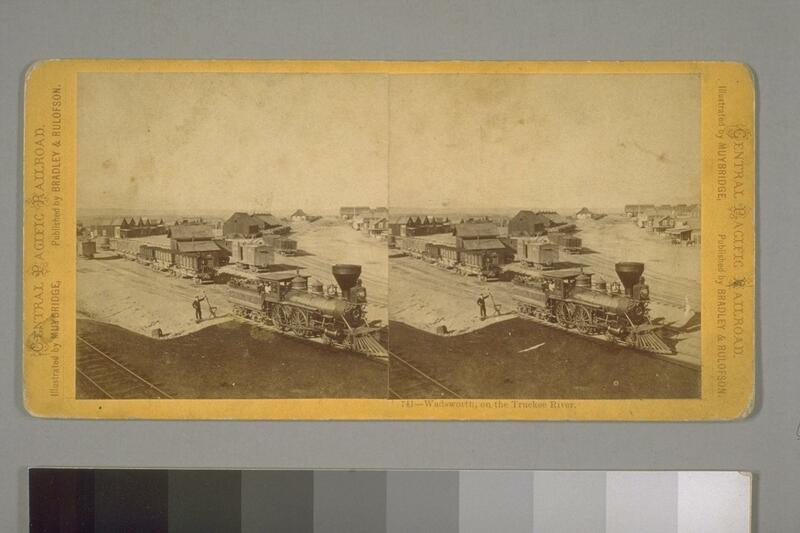 698 Muybridge: The Railroad from Lake Flora, looking West. 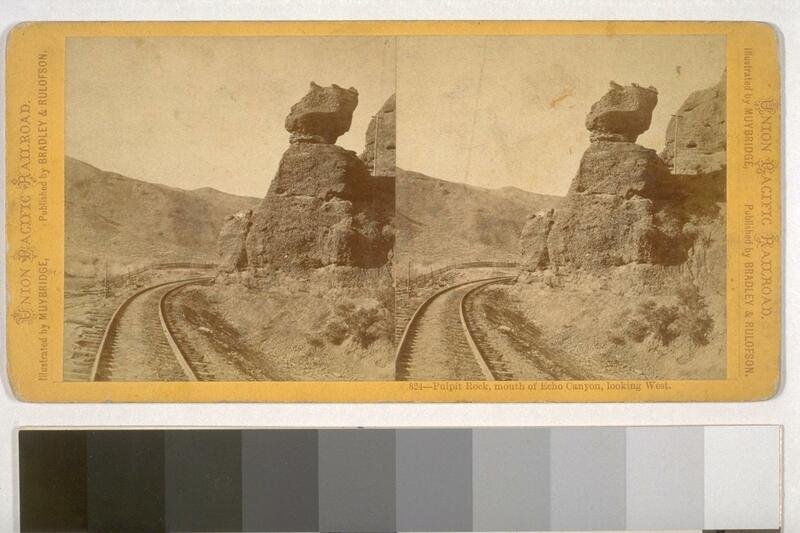 699 Muybridge: Rhinoceros Rock, Mount Volcano, Western Summit Sierra Nevada Mountains. 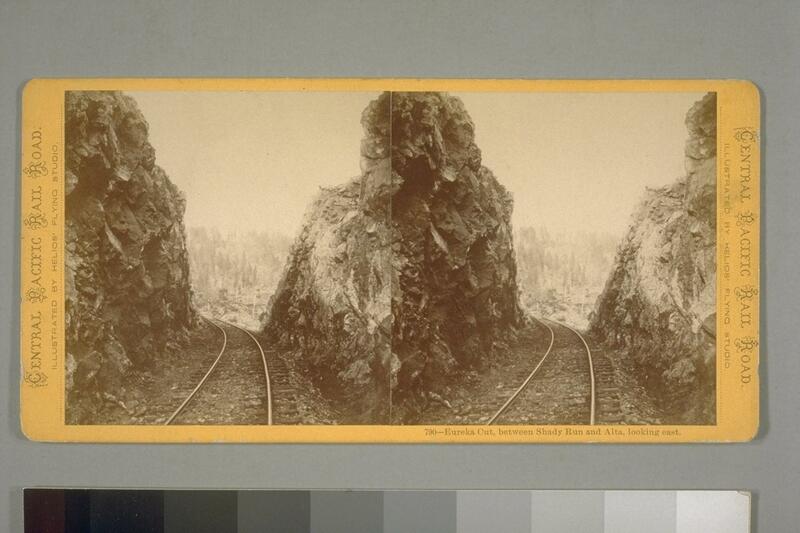 701 Muybridge: The Railroad from Rhinoceros Rock, Mount Volcano. Western Summit Sierra Nevada Mountains. 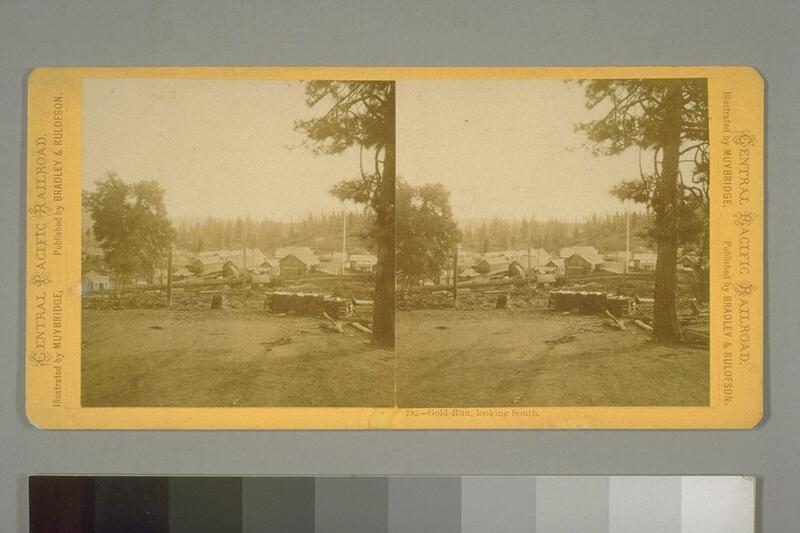 703 Muybridge: Palisade Lake, near Western Summit Sierra Nevada Mountains. 706 Muybridge: The Devil's Peak, from Palisade Lake, near Western Summit Sierra Nevada Mountains. 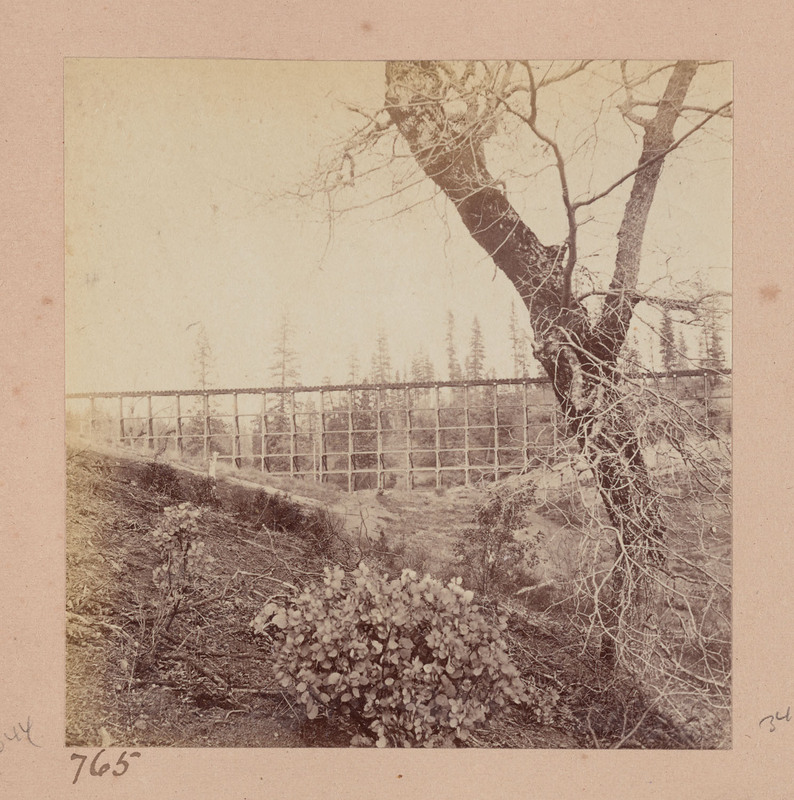 709 Muybridge: The shore of Lake Taho, near Taho City. Modern spelling is "Tahoe". 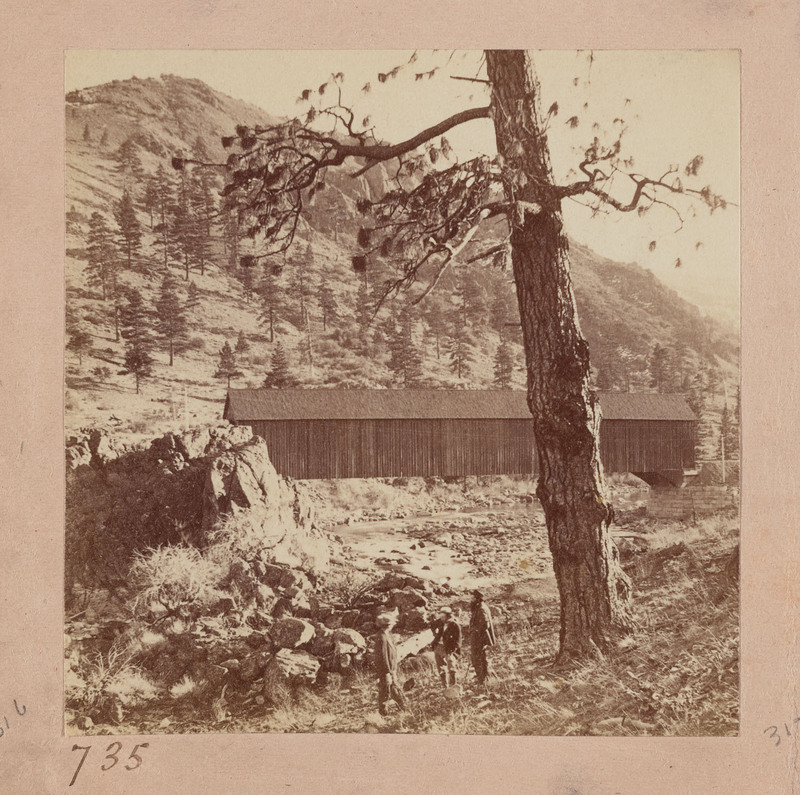 710 Muybridge: Taho House on the shore of Lake Taho. 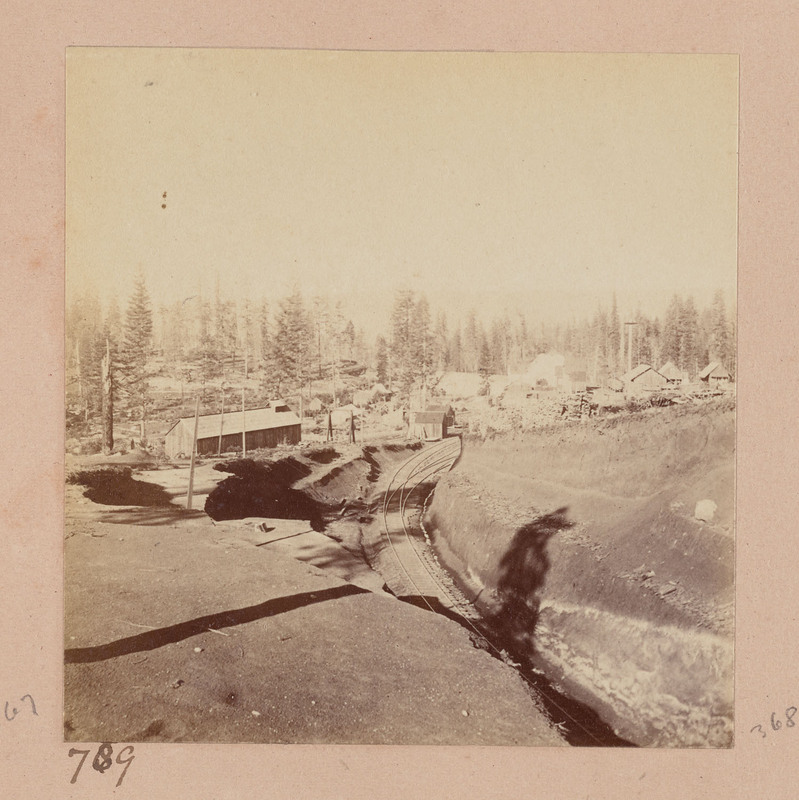 712 Muybridge: The shore of Lake Taho, near Taho City. 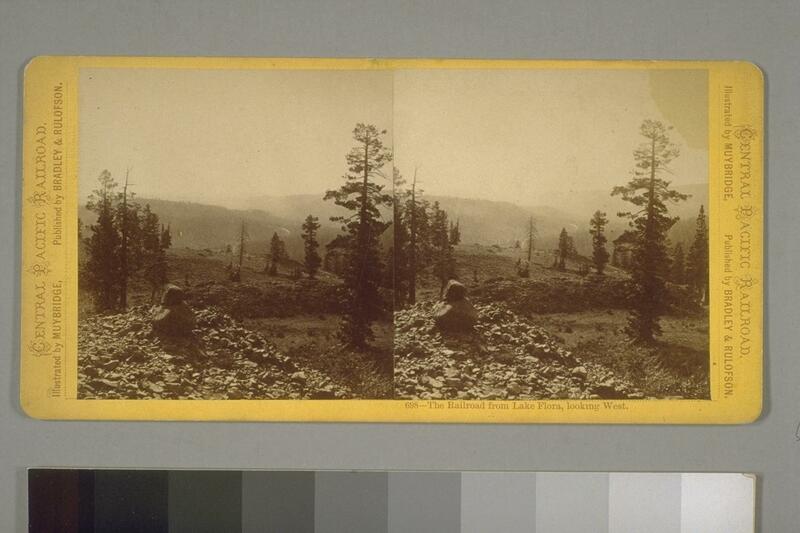 713 Muybridge: Lake Donner, Western Summit Sierra Nevada Mountains in the distance. 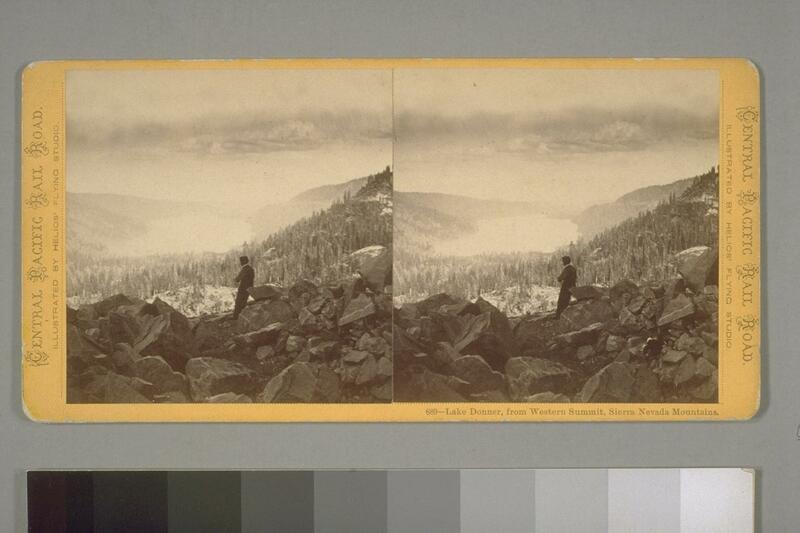 714 Muybridge: Lake Donner, Sierra Nevada Mountains, Mount Stanford in the distance. 715 Muybridge: Cisco, Red Mountain in the distance. 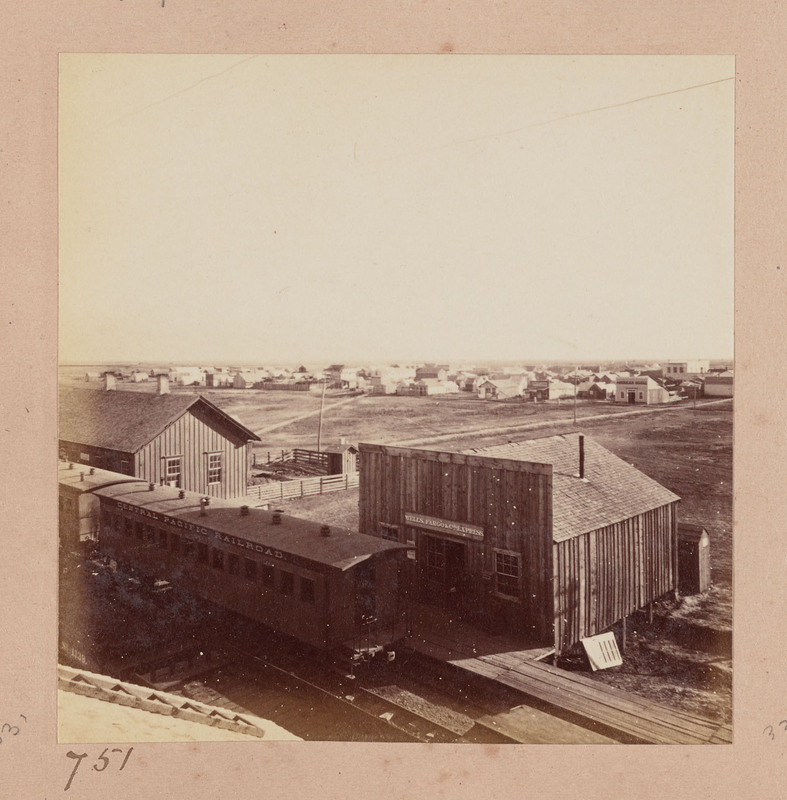 716 Muybridge: Snow Sheds at Cisco, from the East. 717 Muybridge: Snow Sheds at Cisco, from the West. 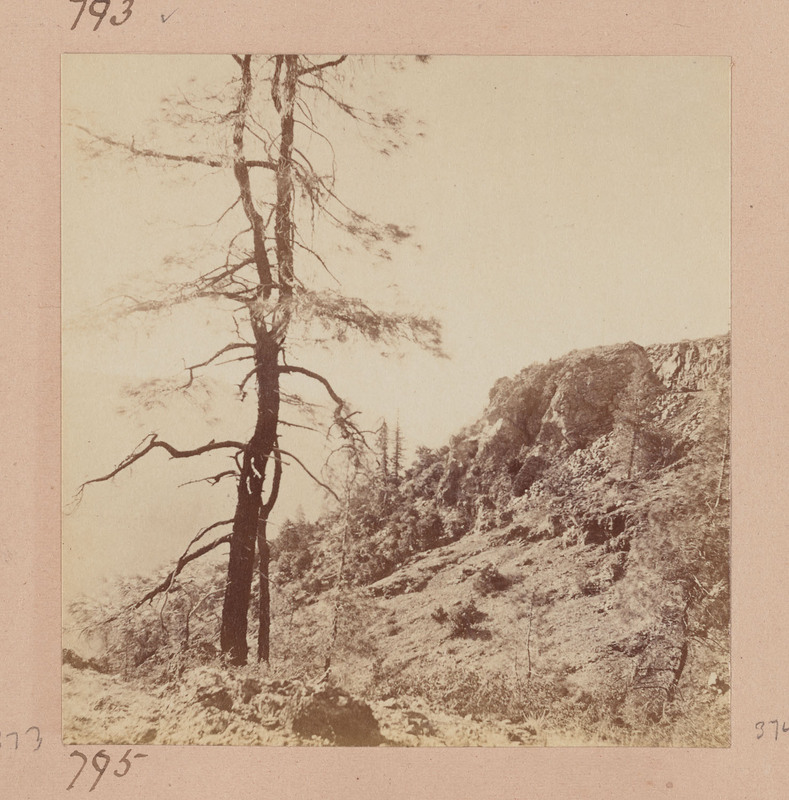 718 Muybridge: Snow Sheds at Emigrant Gap, from the East. 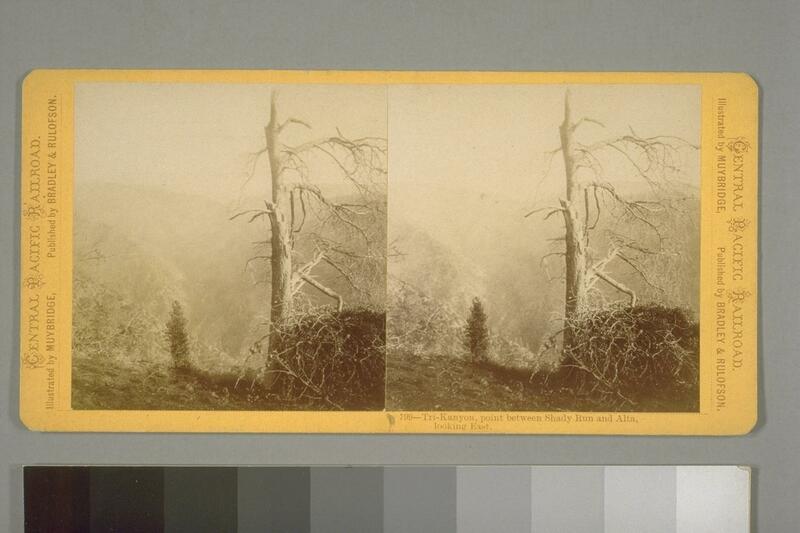 721 Muybridge: Snow Sheds at Emigrant Gap, looking West. 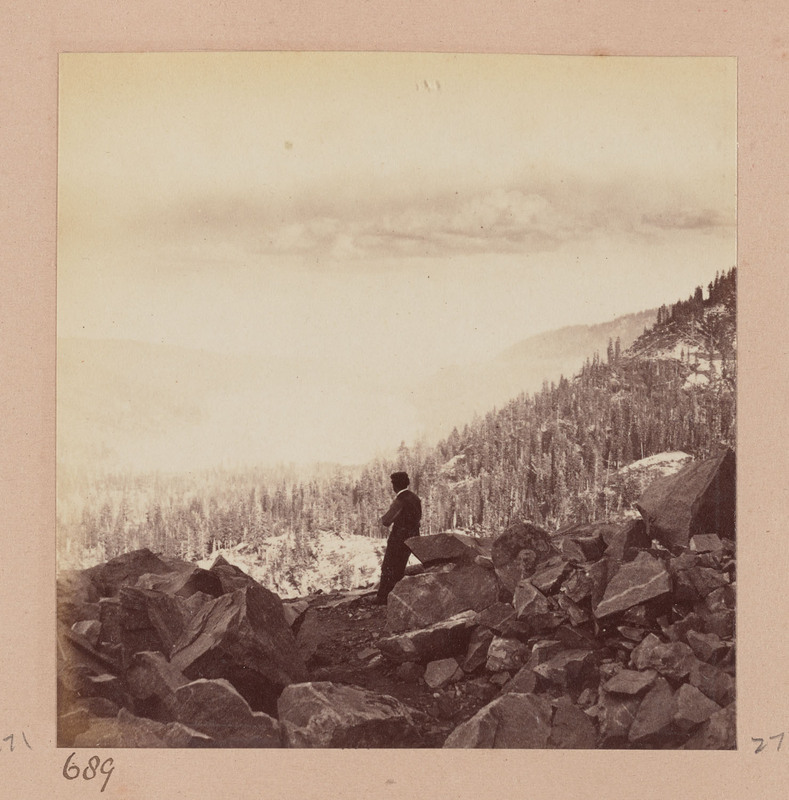 Bancroft Library lists title as: 719, 721 "Snow Sheds at Emigrant Gap, from the East." 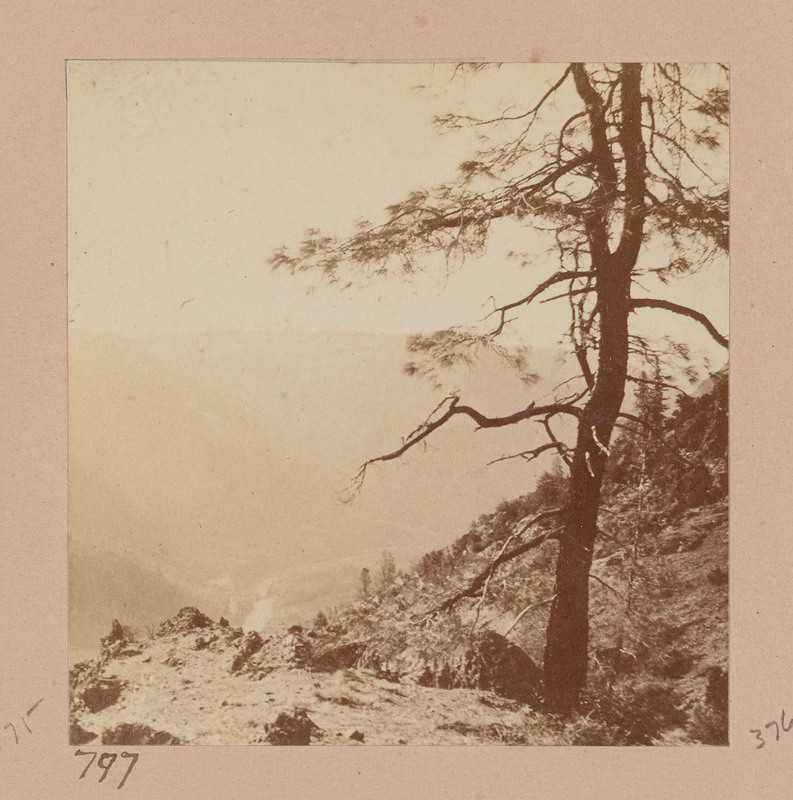 722 Muybridge: Emigrant Gap, looking West. 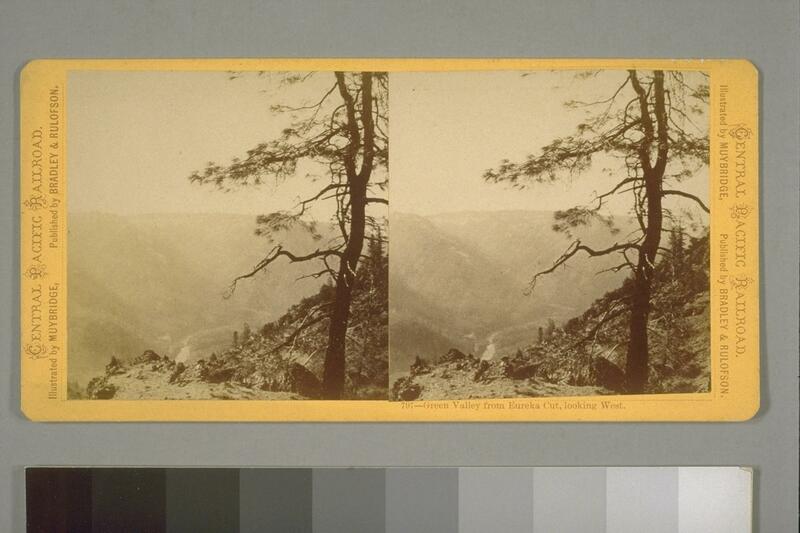 726 Muybridge: Bear Valley from Emigrant Gap. 727 Muybridge: Boca, looking West. 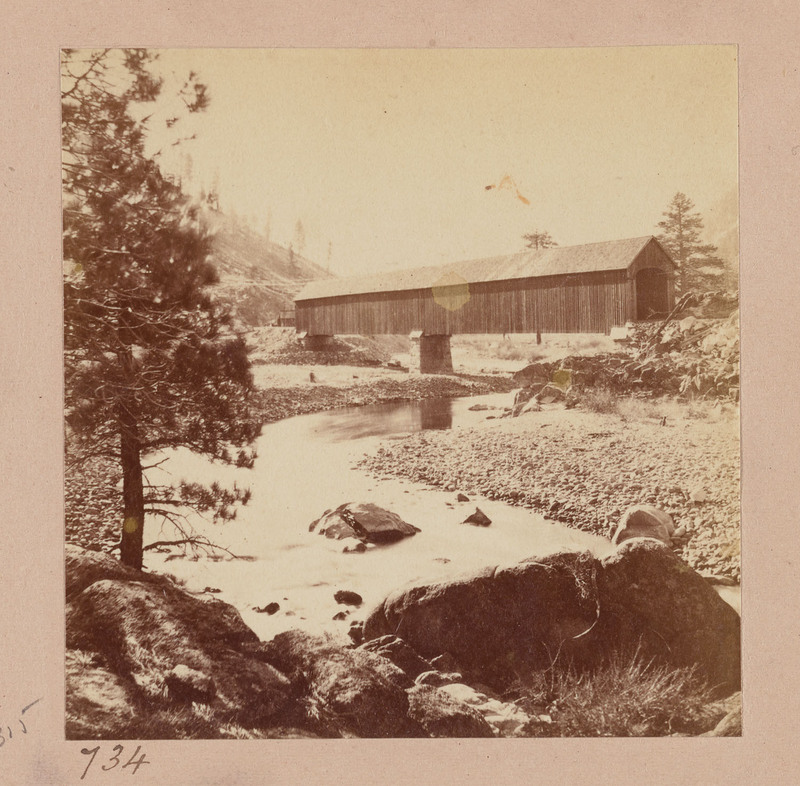 728 Muybridge: Boca and crossing of the little Truckee from the West. Mount Davidson in the distance. 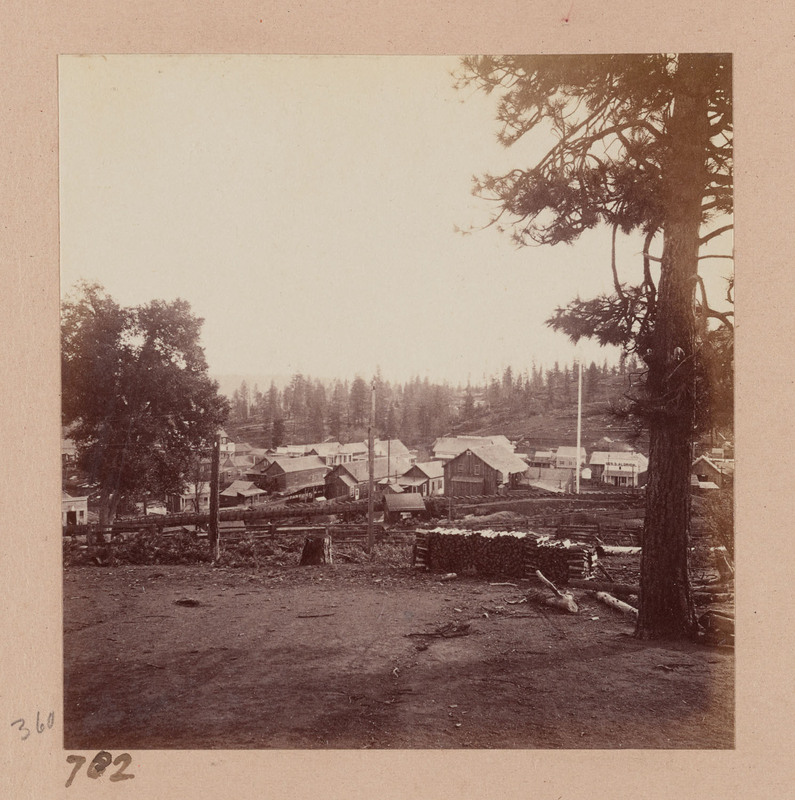 729 Muybridge: Lake Boca, Little Truckee River, looking North. 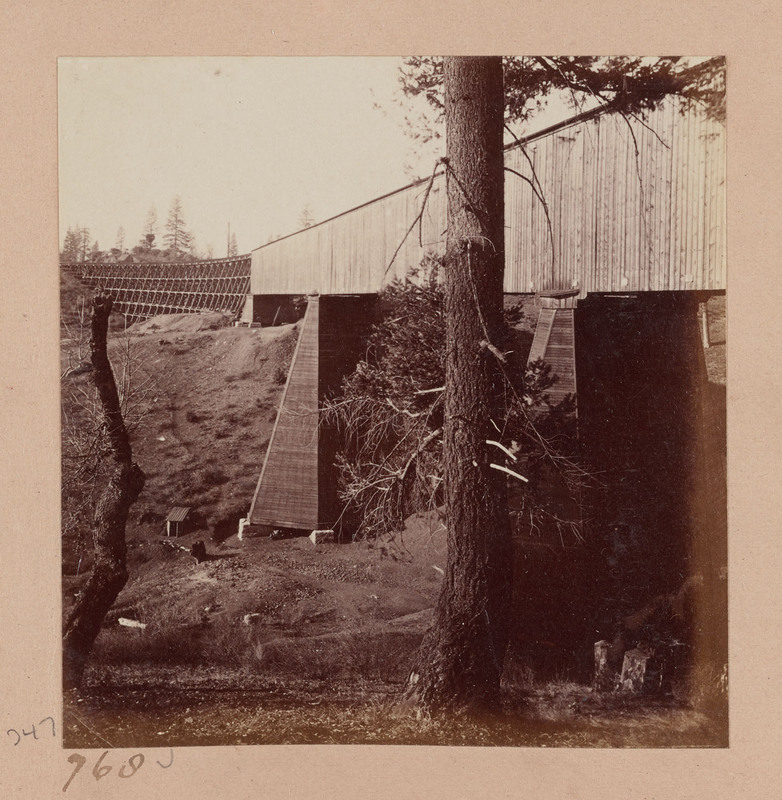 730 Muybridge: Bridge over the Truckee River, near Boca. 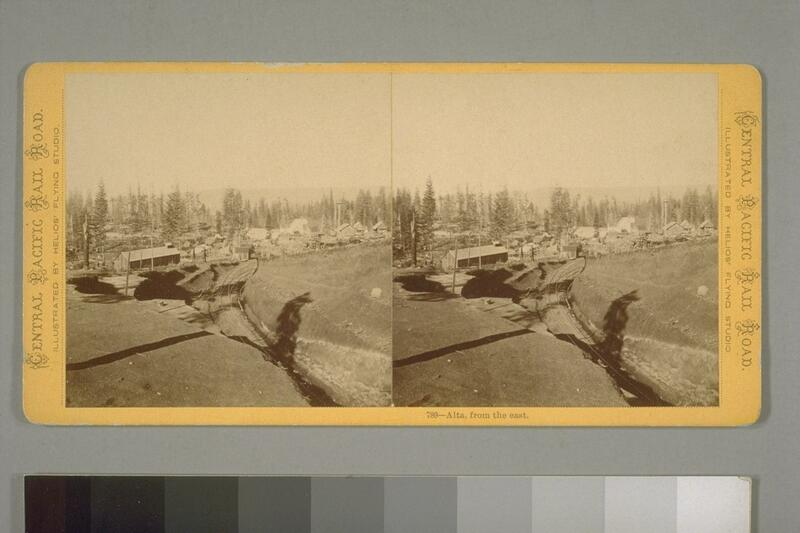 731 Muybridge: First crossing of the Truckee, looking West. 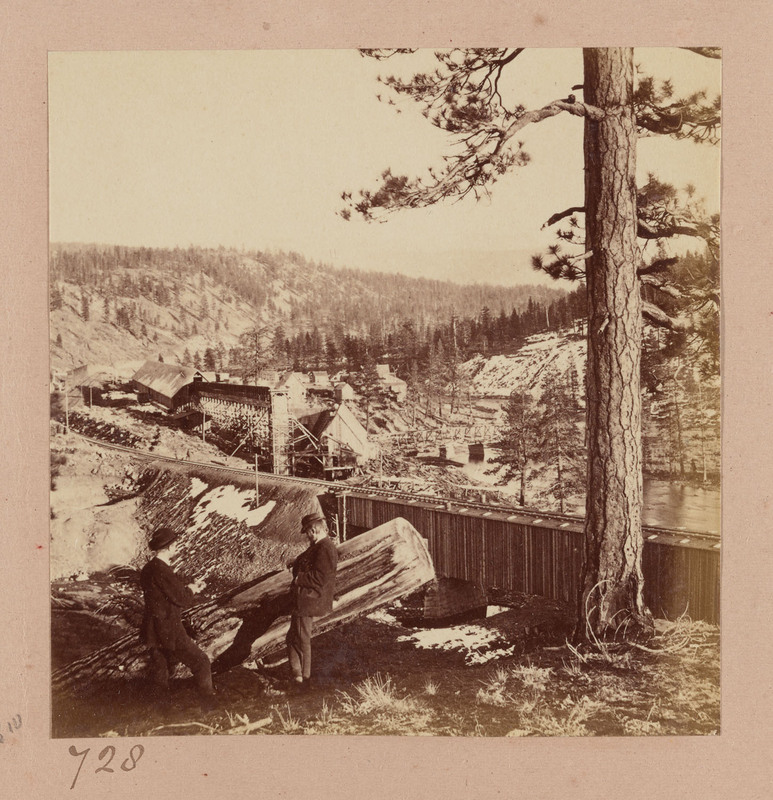 732 Muybridge: Lumber Mill at Rocky Glen, Truckee River. 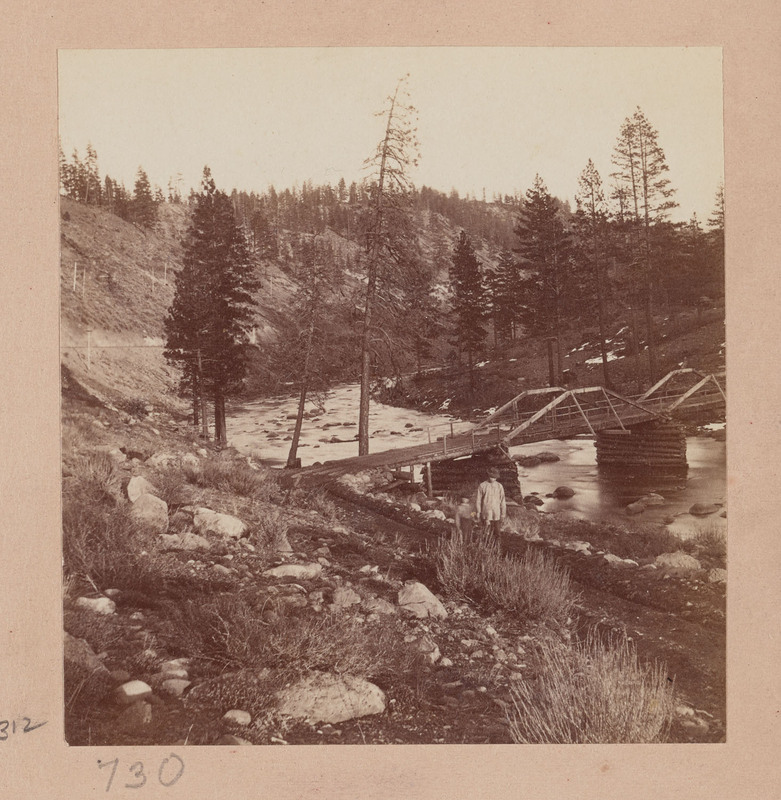 734 Muybridge: Second crossing of the Truckee, looking West. 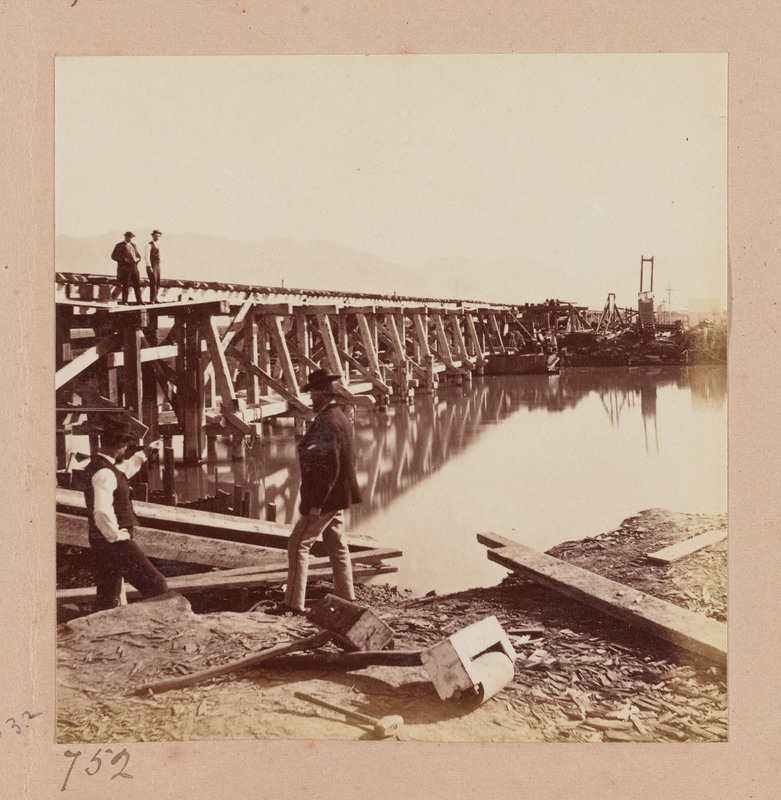 735 Muybridge: Third crossing of the Truckee, looking North. 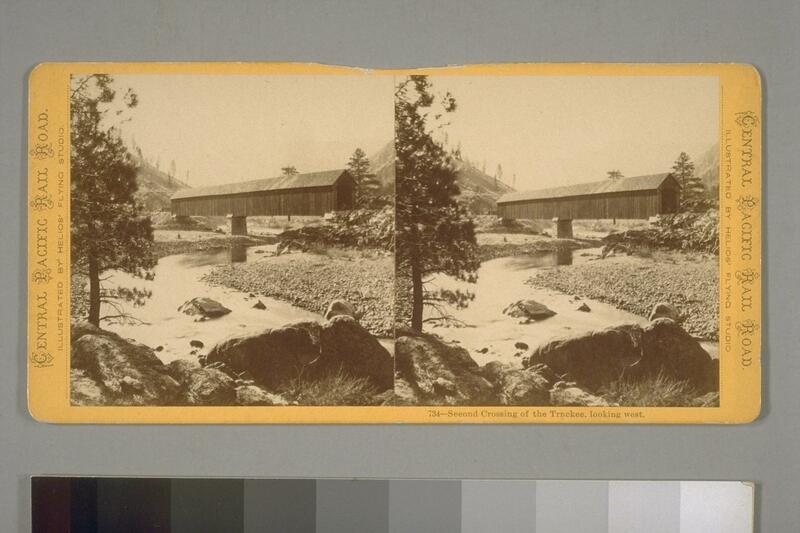 736 Muybridge: Truckee River near the Third crossing. 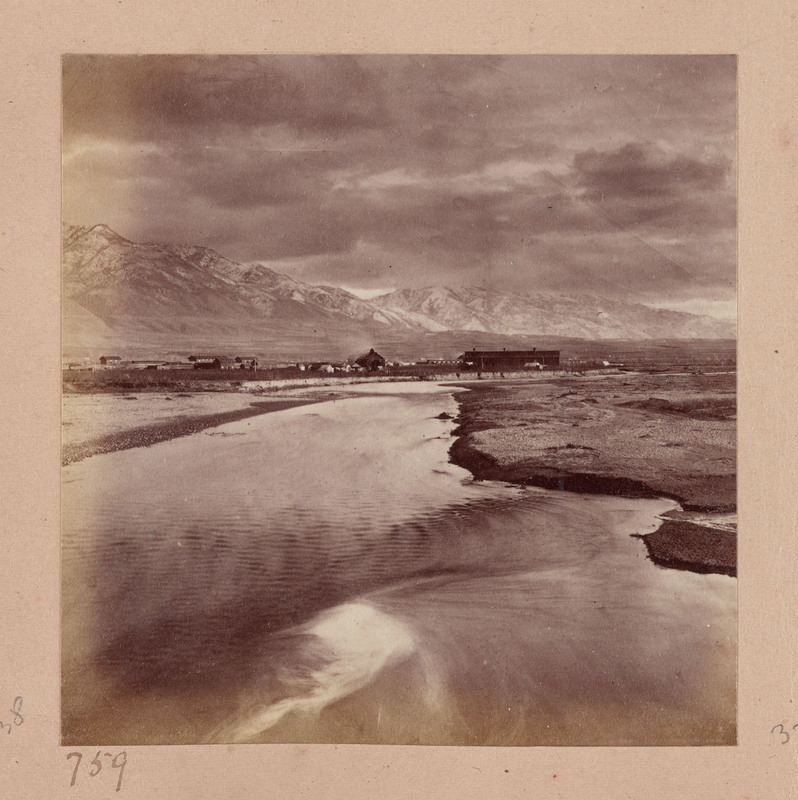 737 Muybridge: Moonlight effect on the Truckee River. 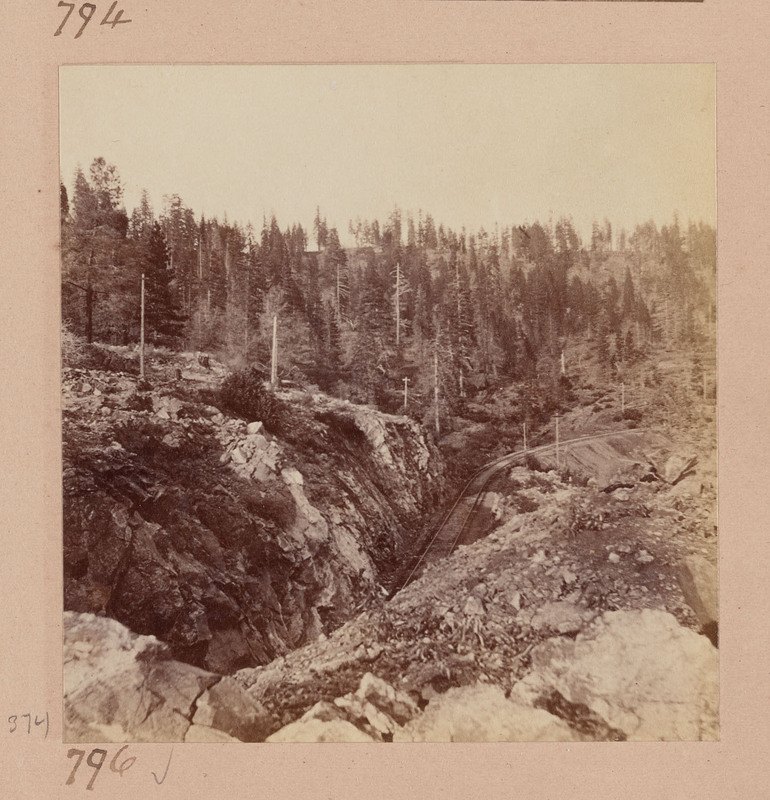 Bancroft Library lists title as: "Moonlight effect, Truckee River." 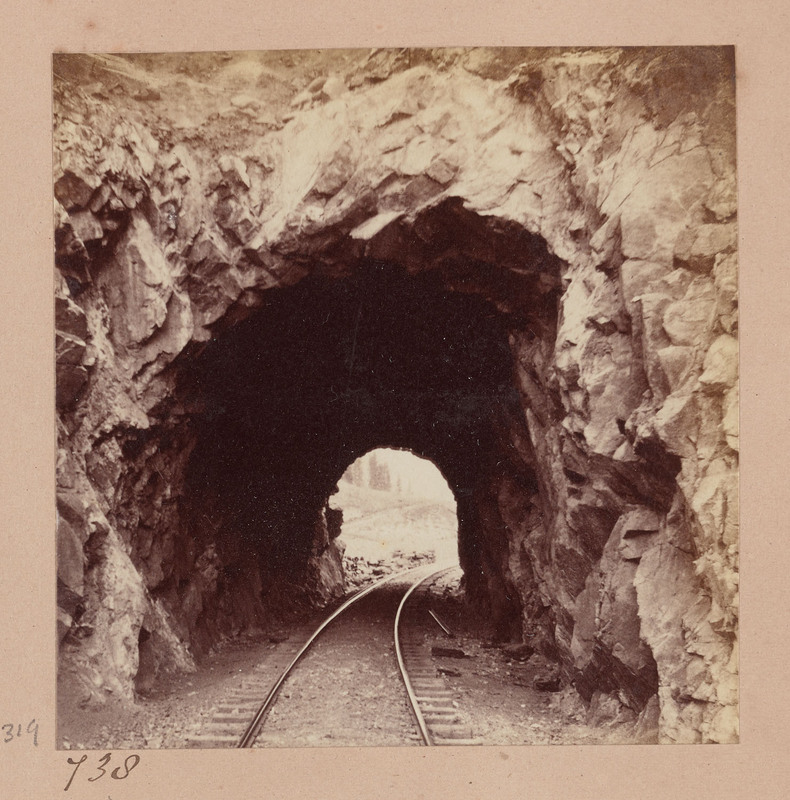 738 Muybridge: Tunnel No. 15, looking West. 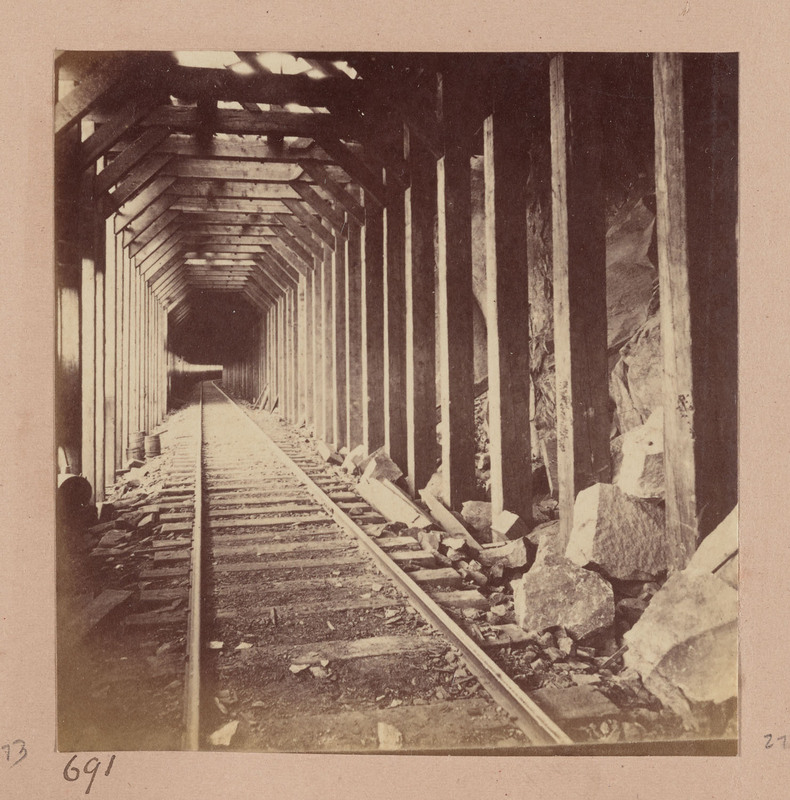 739 Muybridge: View from the top of Tunnel No. 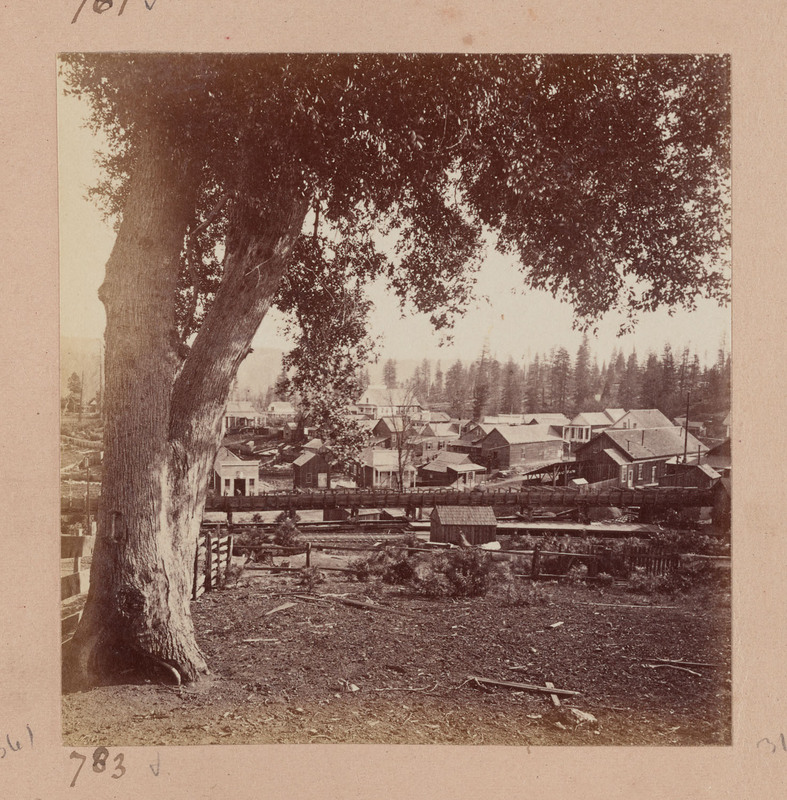 15, Truckee River, looking West. 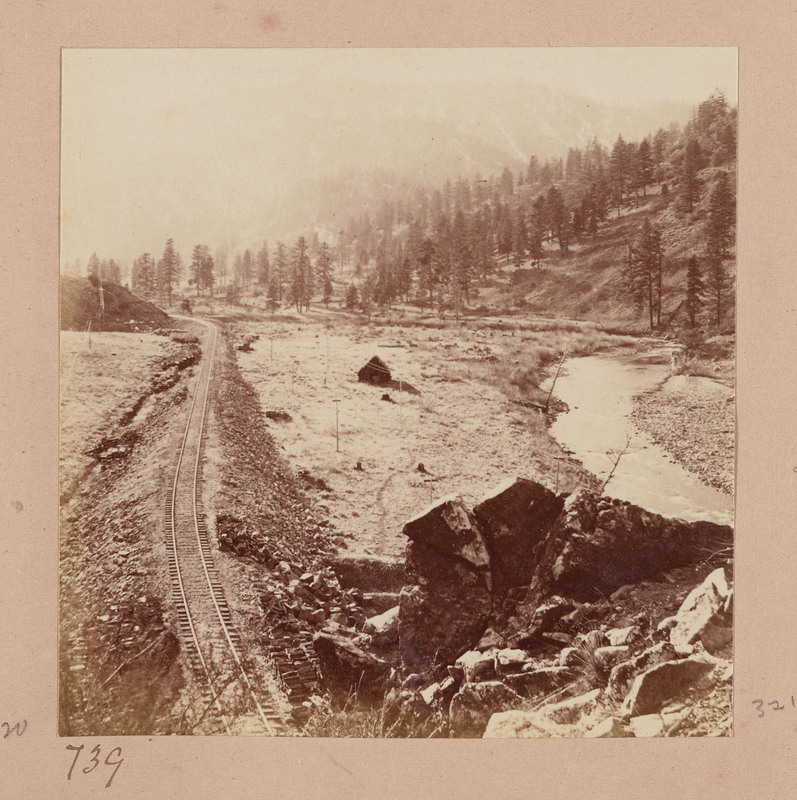 740 Muybridge: Fifth and last crossing of the Truckee, near Wadsworth, looking North. 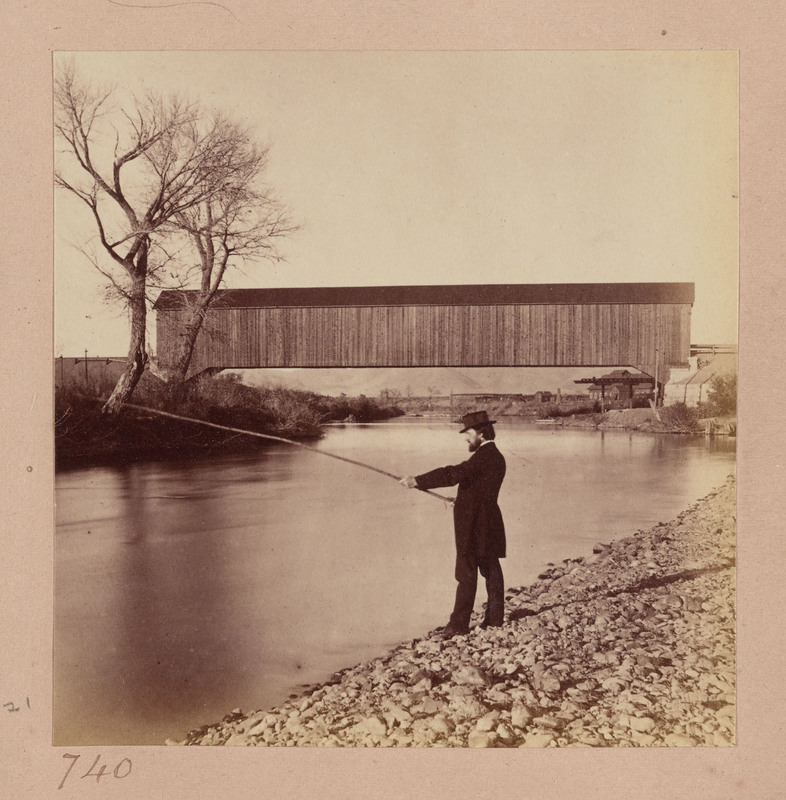 741 Muybridge: Wadsworth, on the Truckee River. 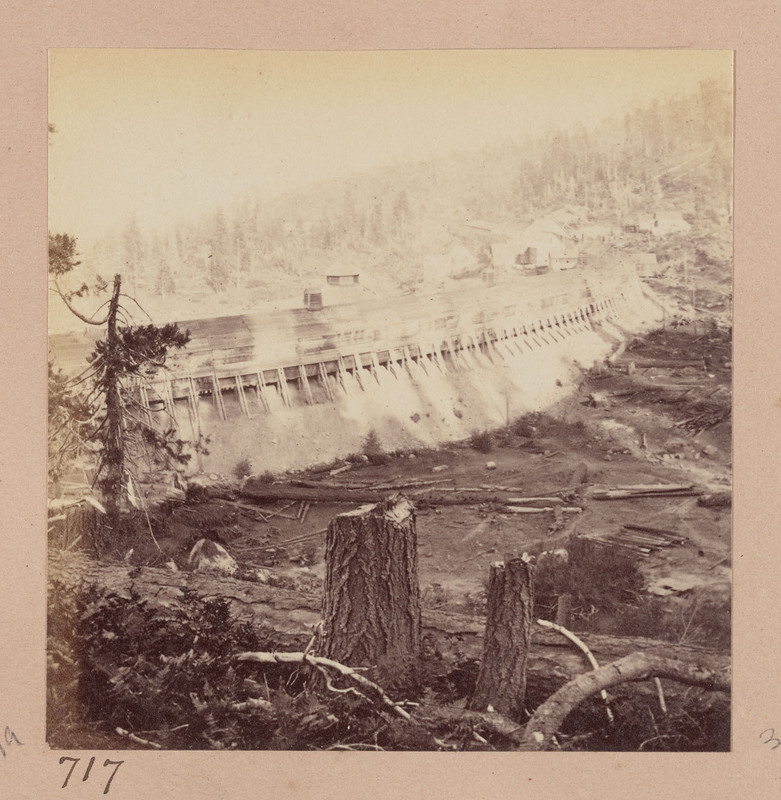 742 Muybridge: Palisade, on the Humboldt River, looking East. 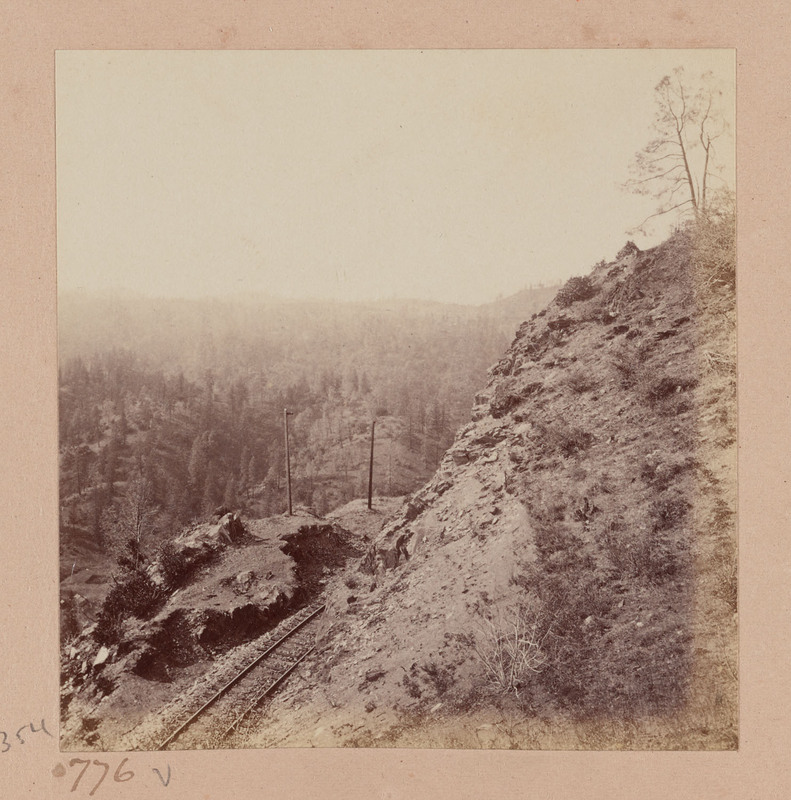 746 Muybridge: Humboldt Palisades, looking West. 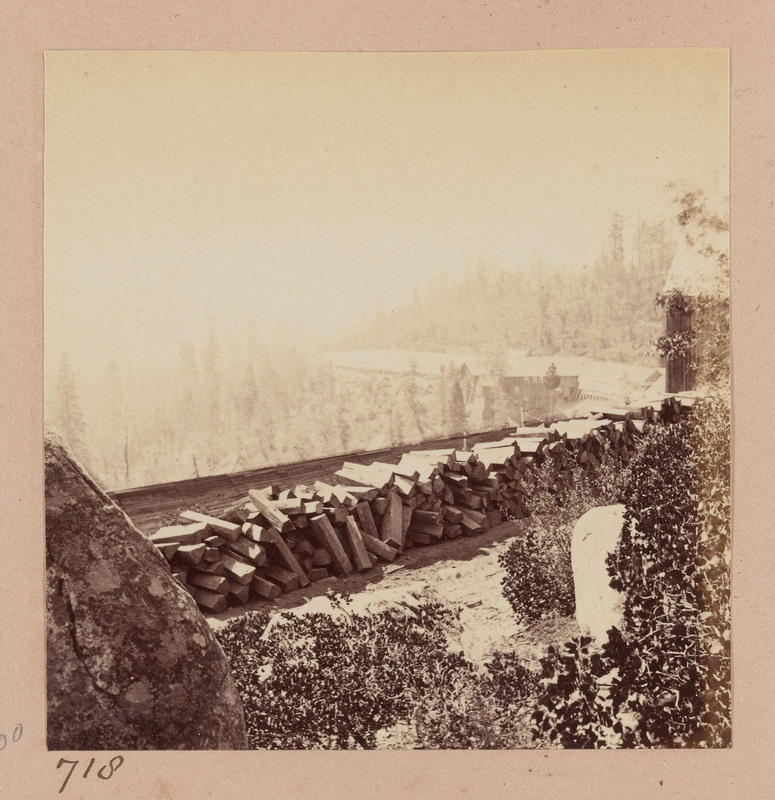 747 Muybridge: Humboldt Palisades, looking East. 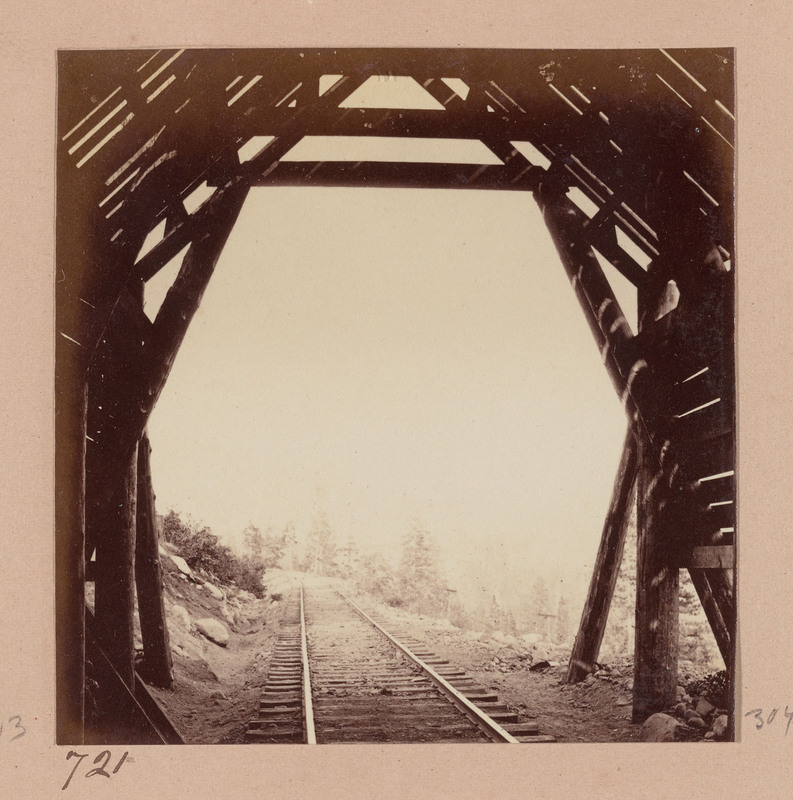 748 Muybridge: Trestle constructed by the U. P. R. R. between Promontory and Blue Creek. 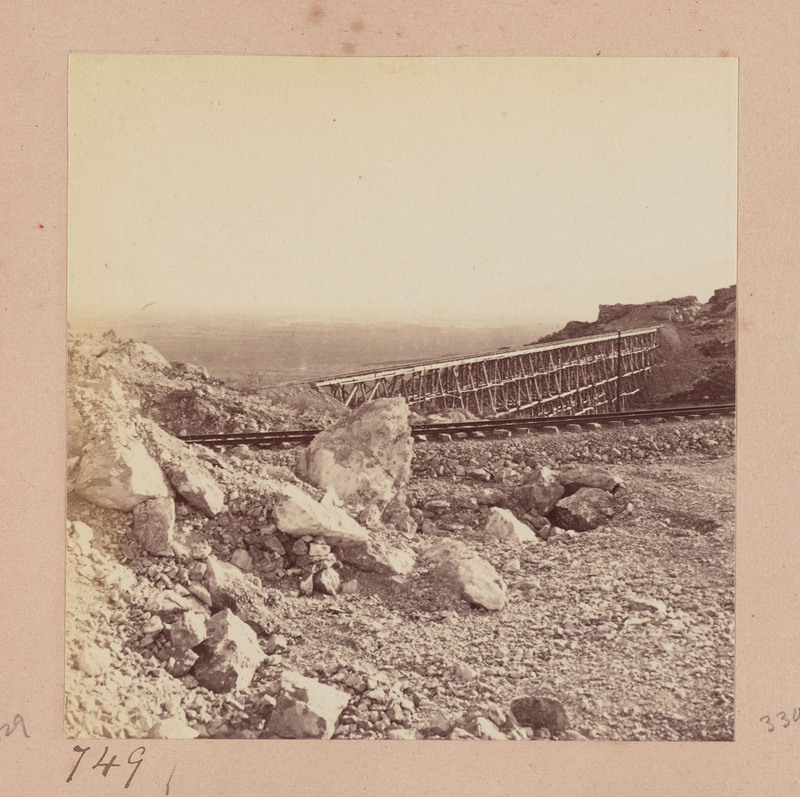 749 Muybridge: Trestle constructed by the U. P. R. R. between Promontory and Blue Creek, Great Salt Lake in the distance. 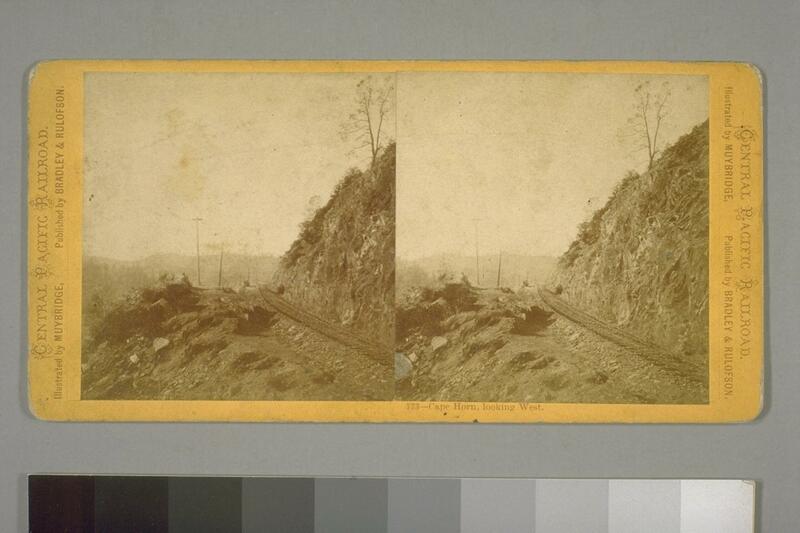 750 Muybridge: Rock Cut between Promontory and Blue Creek. 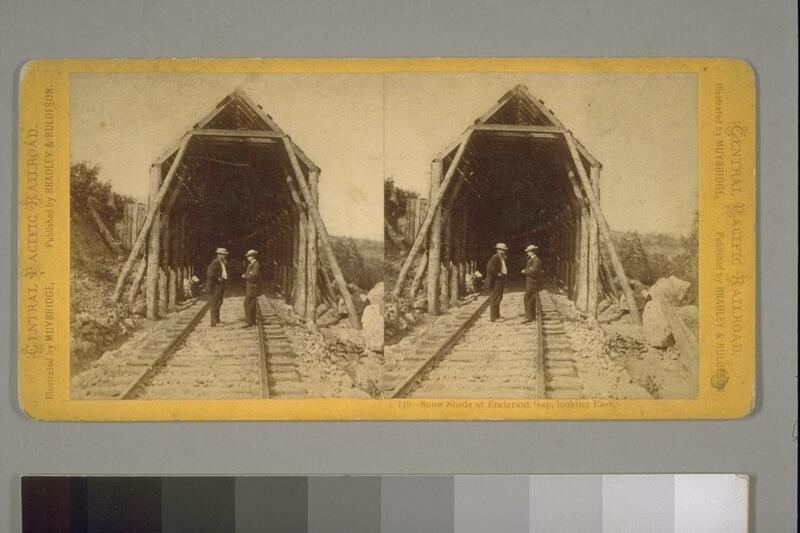 751 Muybridge: Corinne, from the Railroad Station. 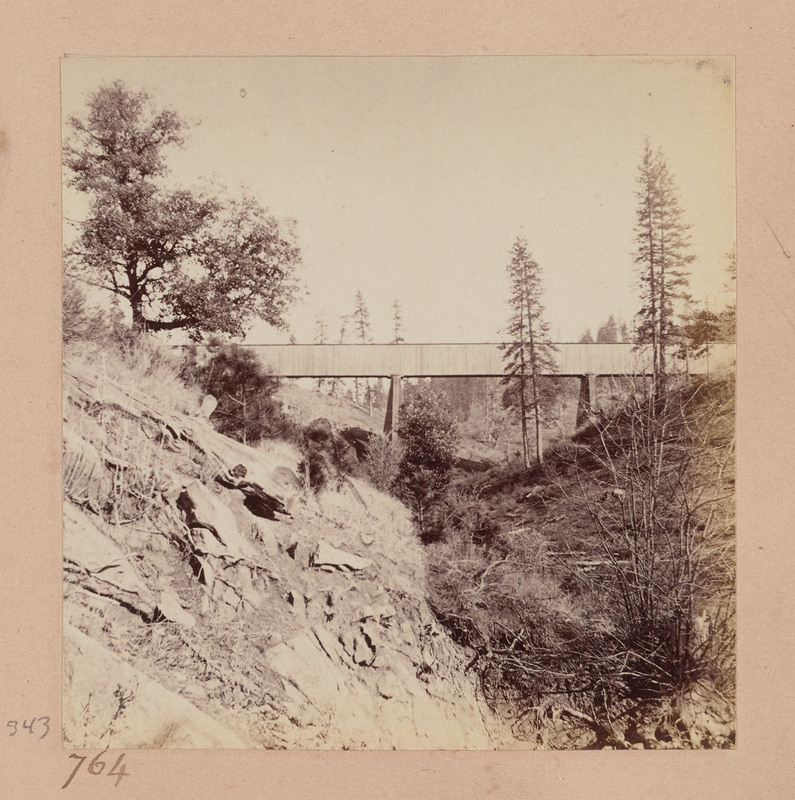 752 Muybridge: Bear River crossing, near Corinne, looking East. 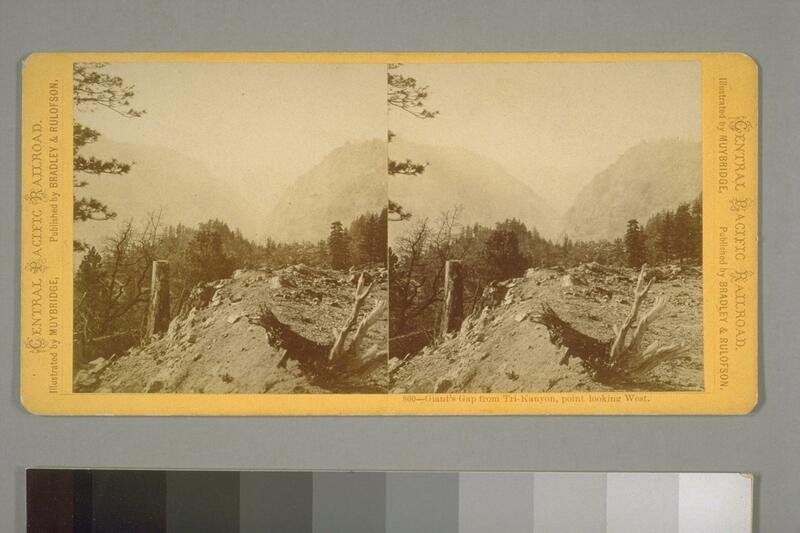 753 Muybridge: Bear River crossing, near Corinne, looking West. 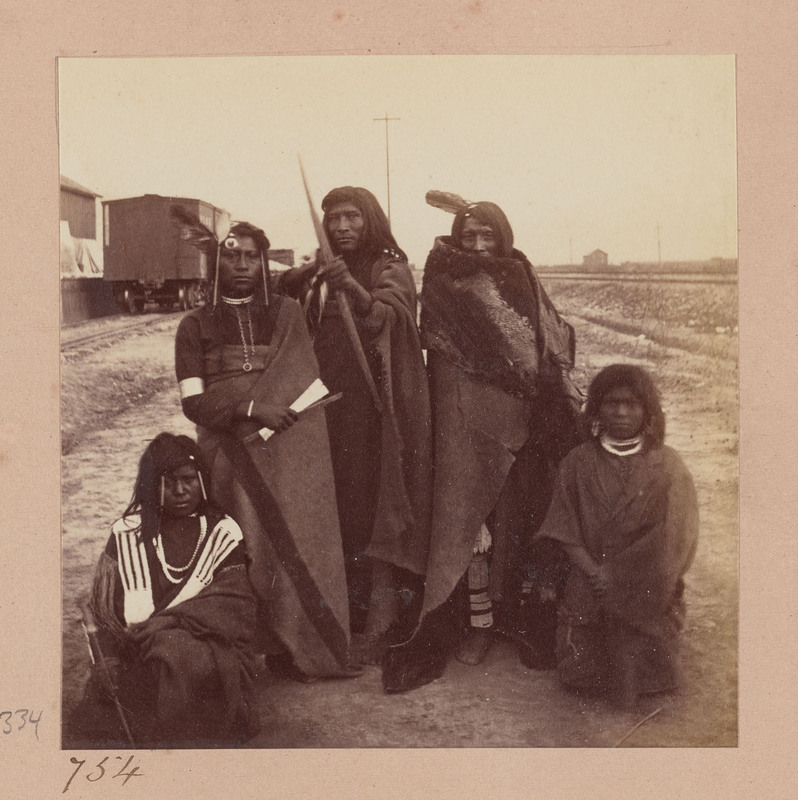 754 Muybridge: Shoshone Indians at Corinne. 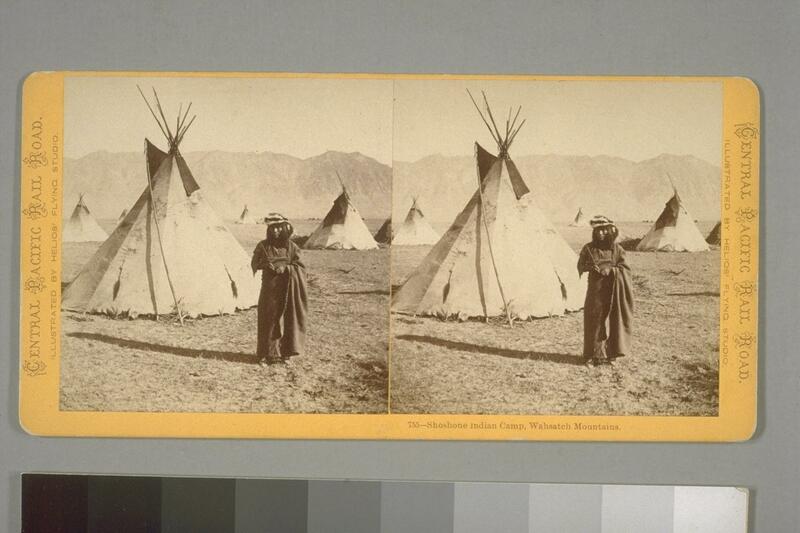 755 Muybridge: Shoshone Indian Camp, Wasatch Mountains. 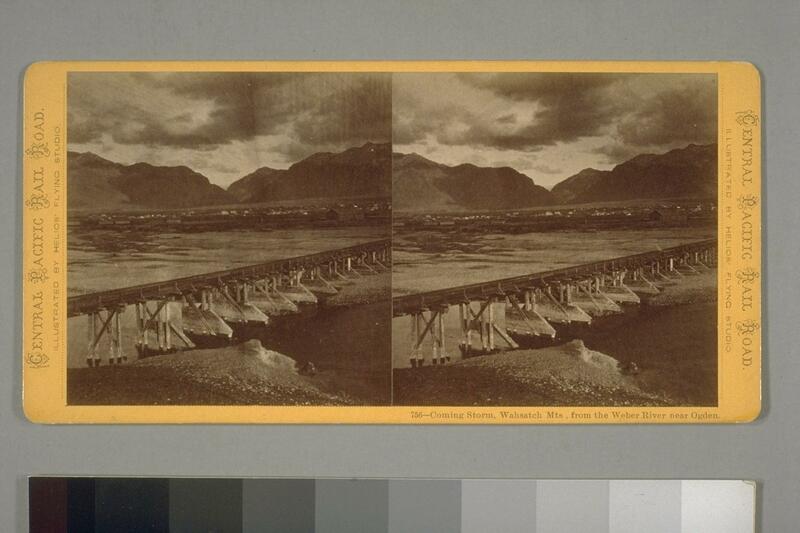 756 Muybridge: Approaching Storm, Wasatch Mountains from the Weber River, near Ogden. 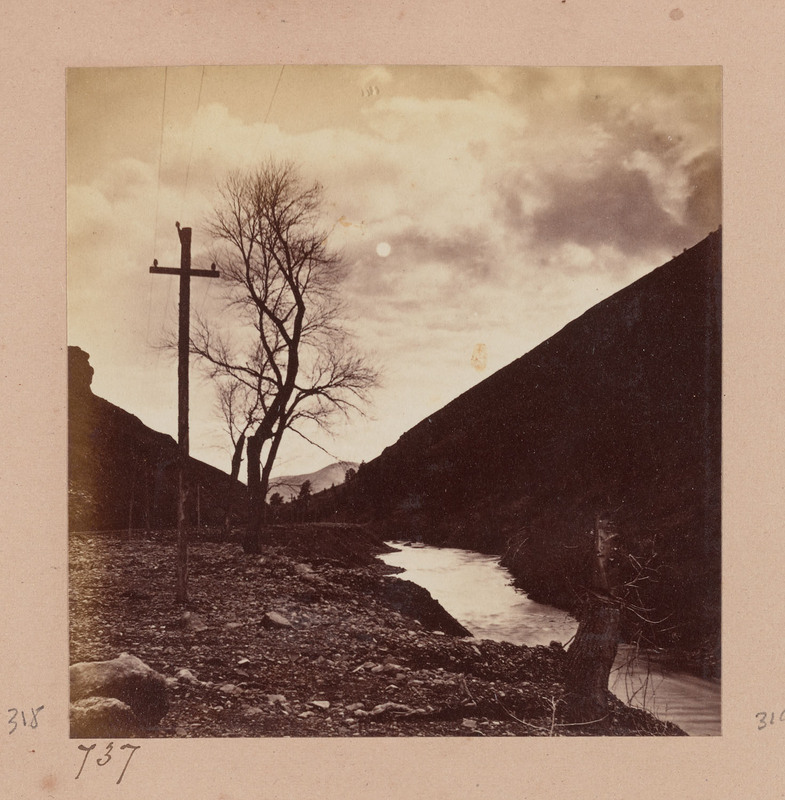 Bancroft Library lists title as: "Coming Storm, Wasatch Mountains, from the Weber River, near Ogden." 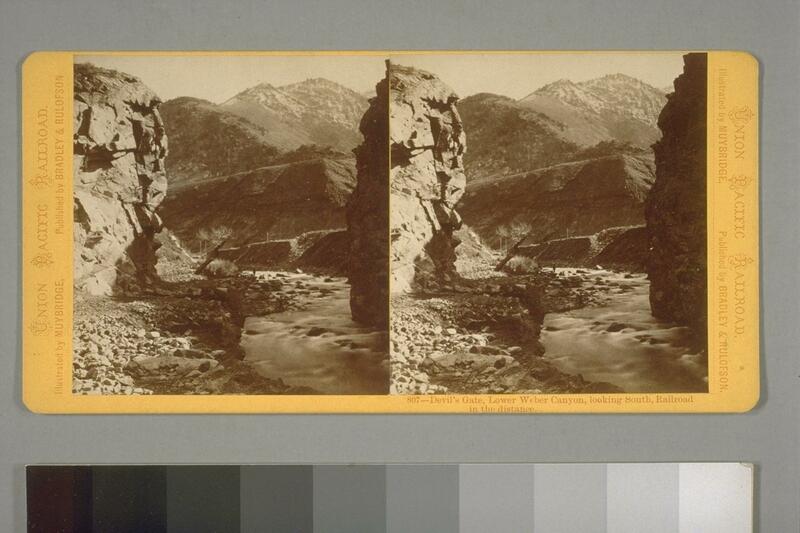 757 Muybridge: Early Morning, Wasatch mountains, from the Weber River, near Ogden. 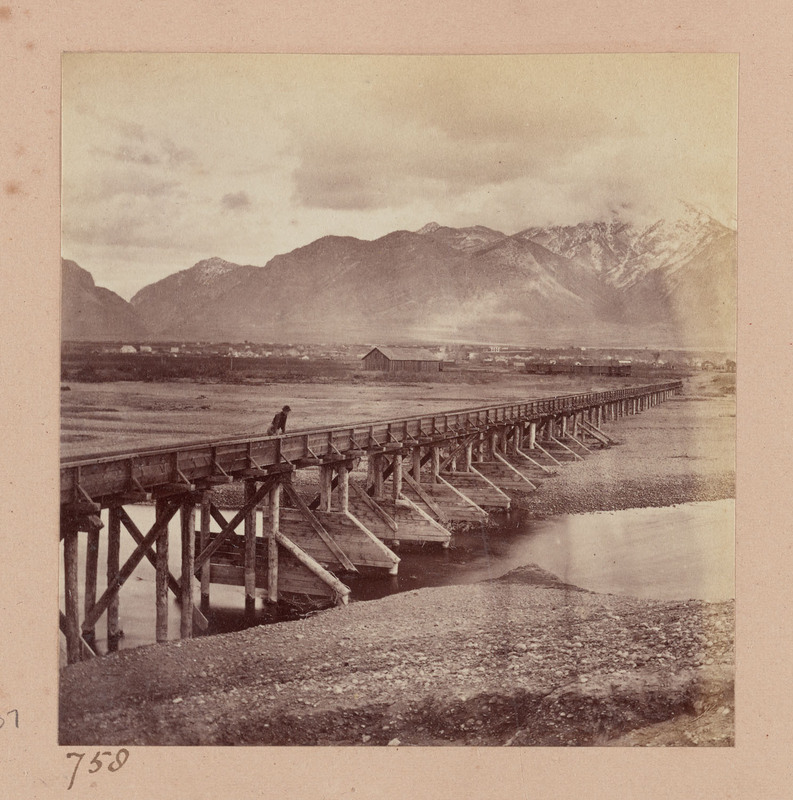 758 Muybridge: Utah Central Railroad, crossing of the Weber River, near Ogden. 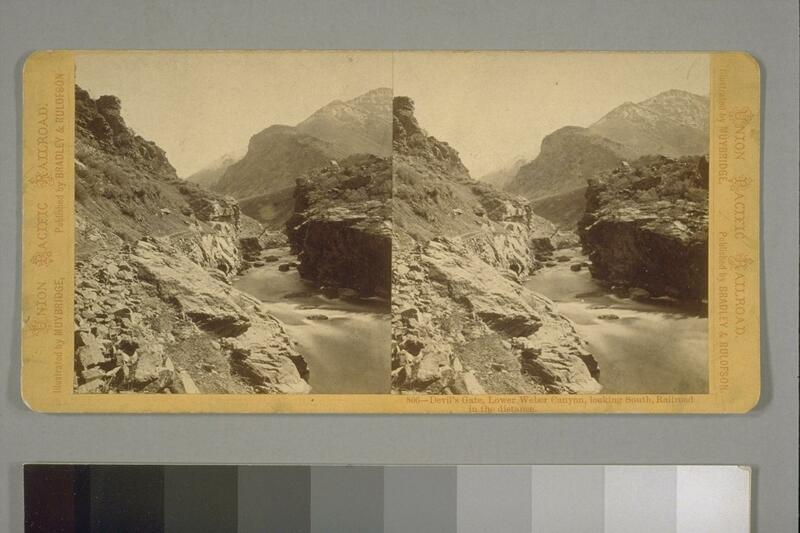 759 Muybridge: Weber River, near Ogden, Wasatch Mountains in the distance. 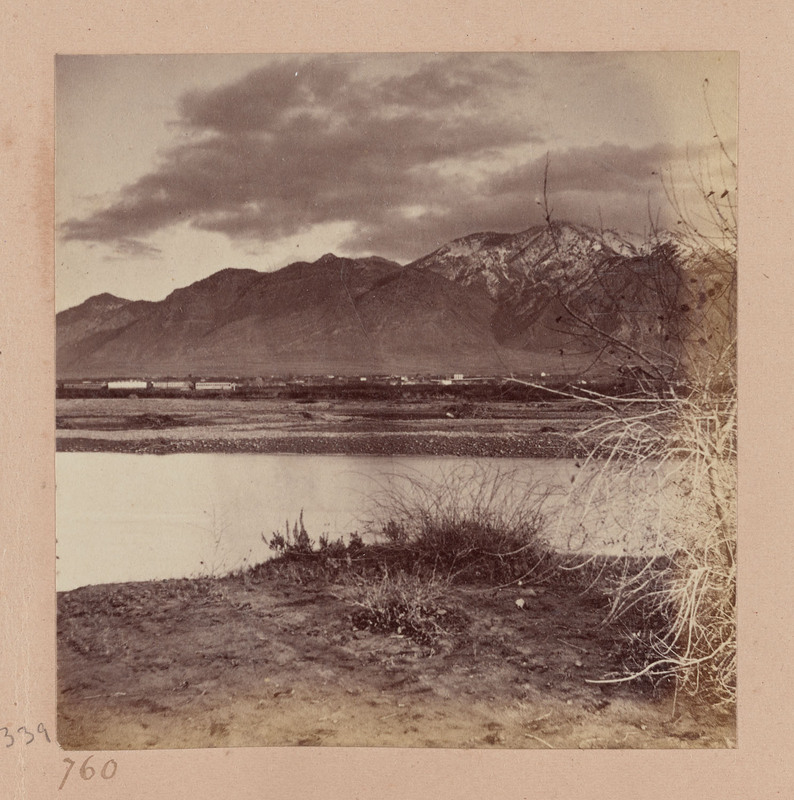 760 Muybridge: Wasatch Mountains, from the Weber River. 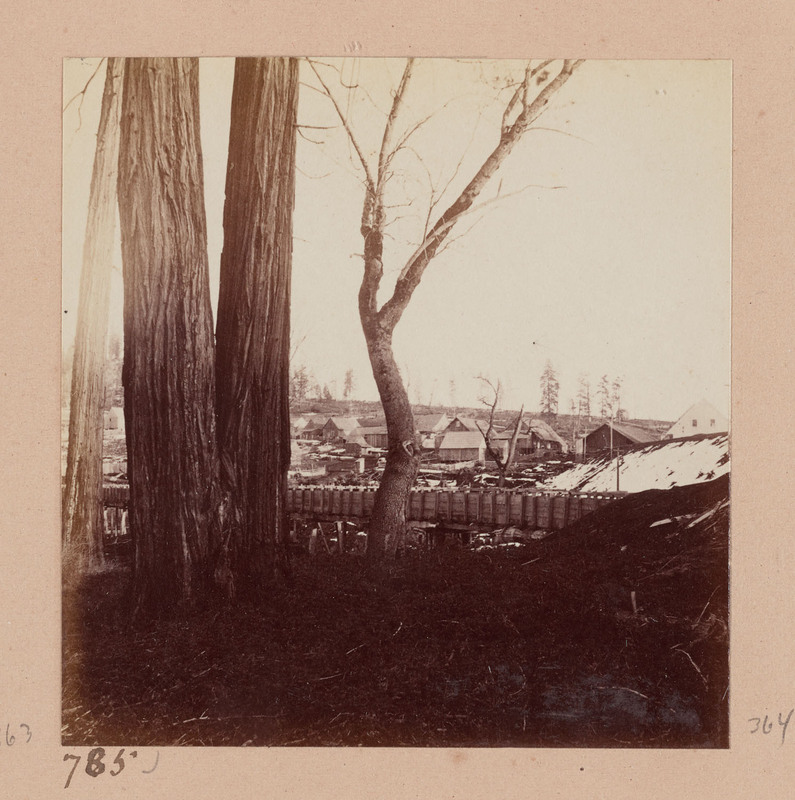 761 Muybridge: Colfax, from the Southeast. 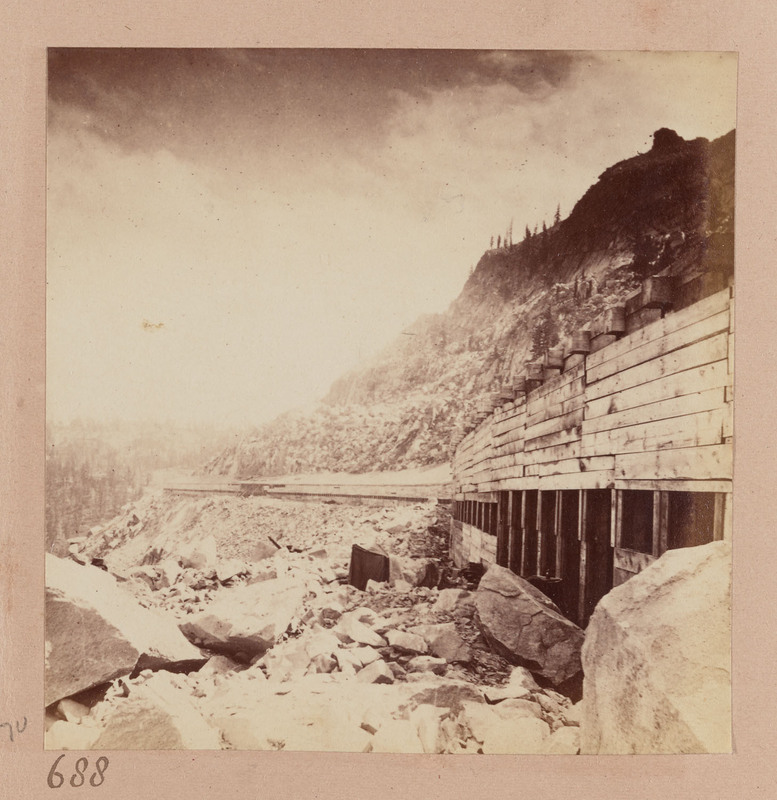 762 Muybridge: Bloomer Cut, near Auburn, 85 feet deep. 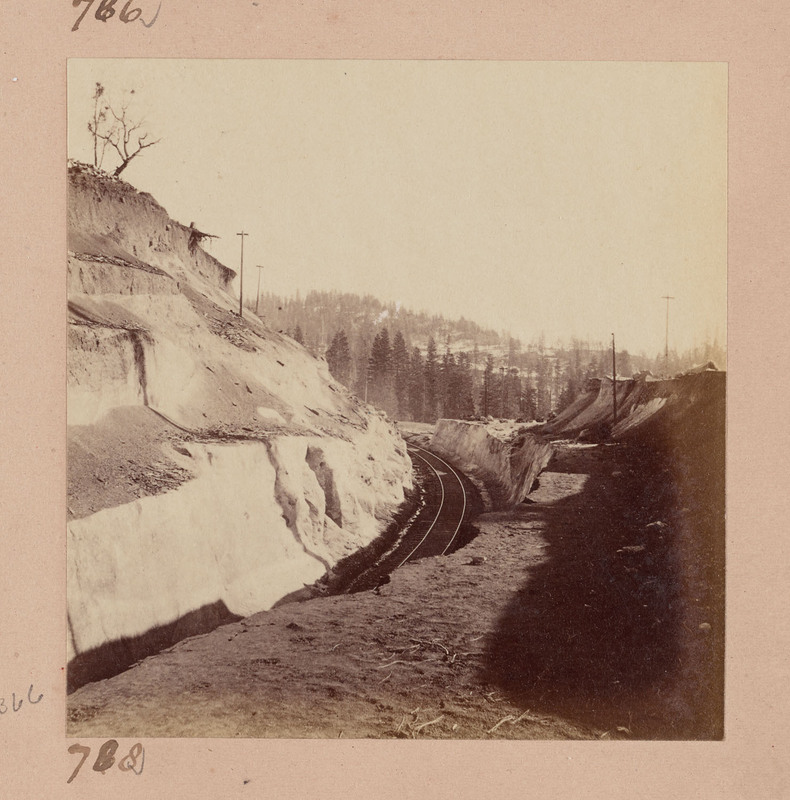 Bancroft Library lists title as: "Bloomer Cut--85 feet deep, 800 feet long--looking East." 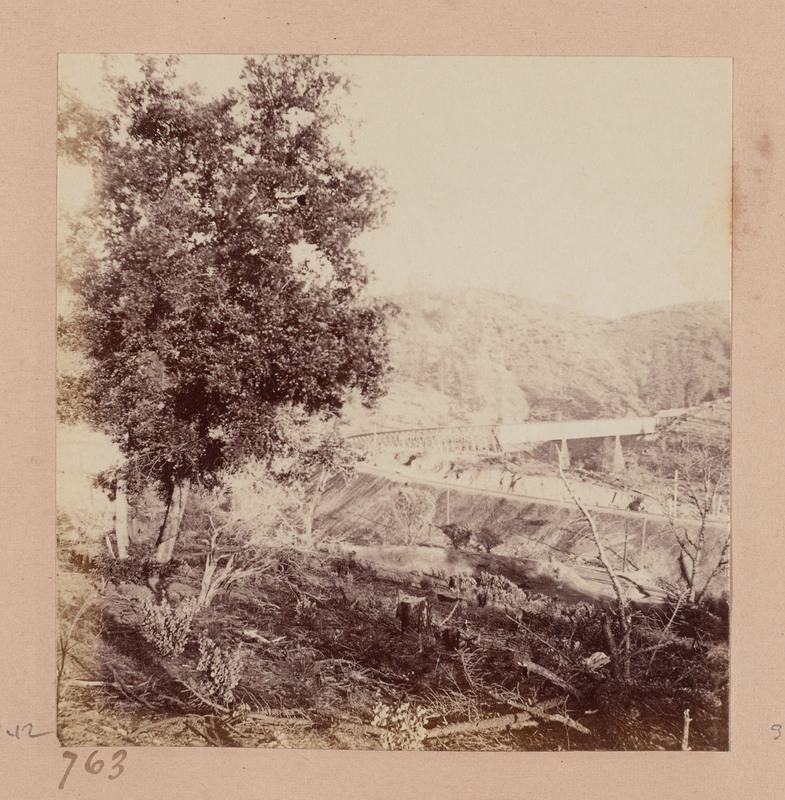 763 Muybridge: Long Ravine Bridge, 113 feet high, looking East. 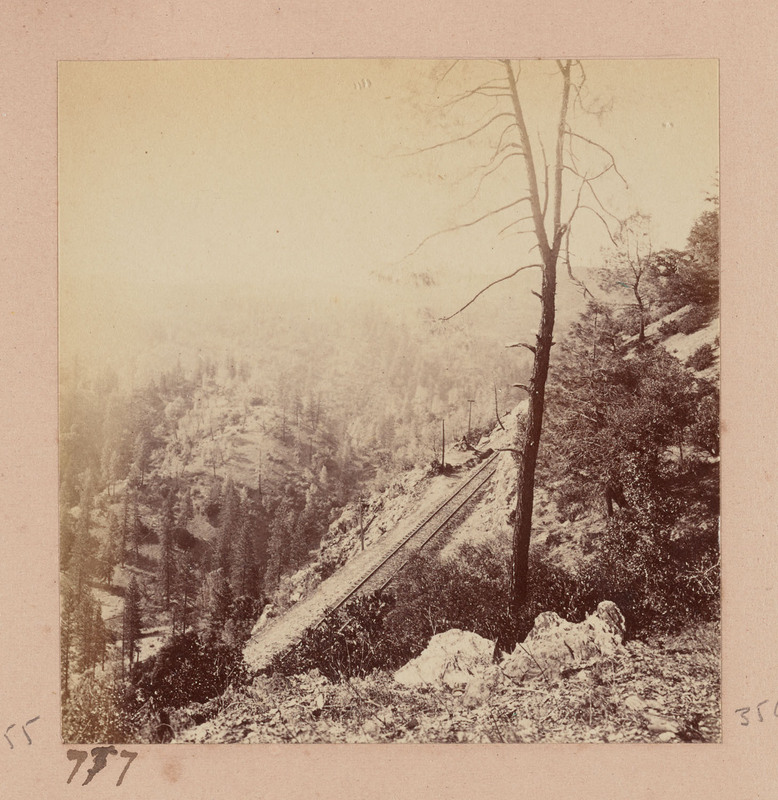 764 Muybridge: Long Ravine Bridge, 113 feet high, looking North. 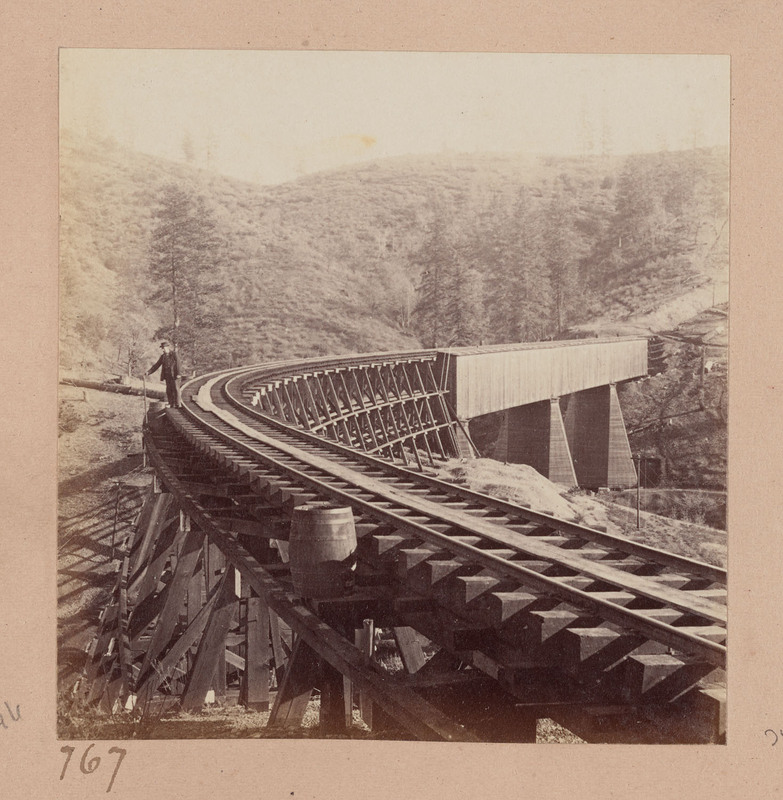 765 Muybridge: Long Ravine Trestle, 113 feet high, looking North. 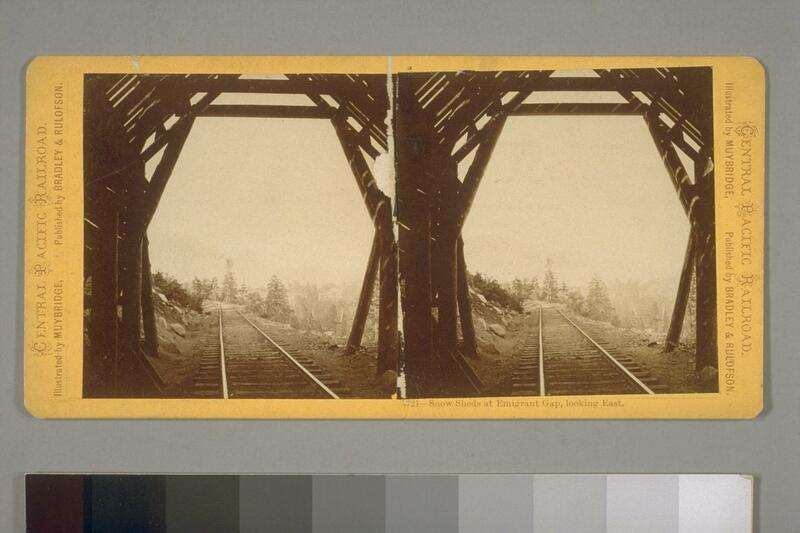 Bancroft Library lists title as: "Long Ravine Trestle--113 feet high--looking North." 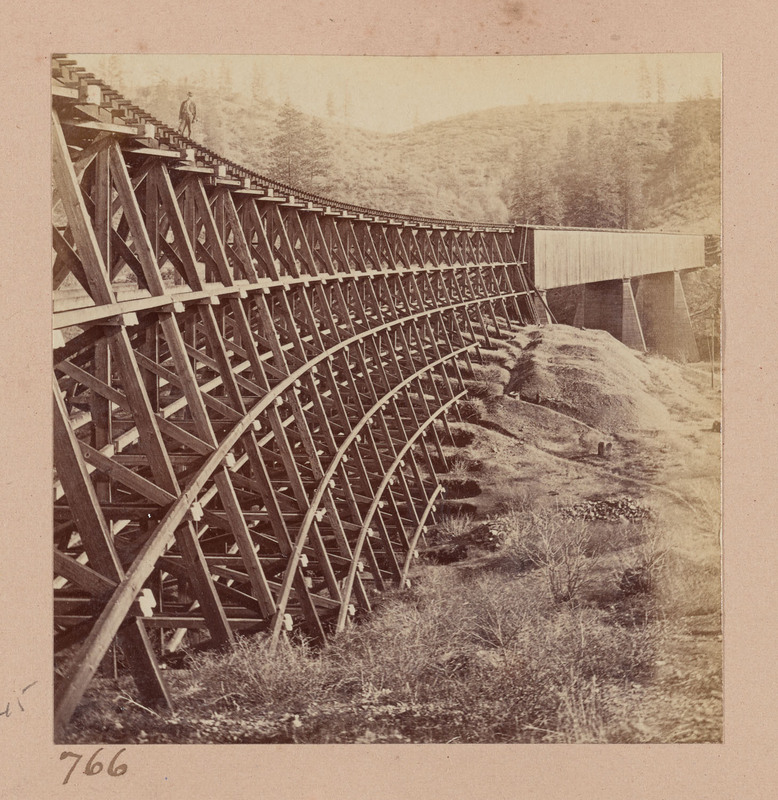 767 Muybridge: Long Ravine Trestle and Bridge, 113 feet high, 878 feet long, looking East. 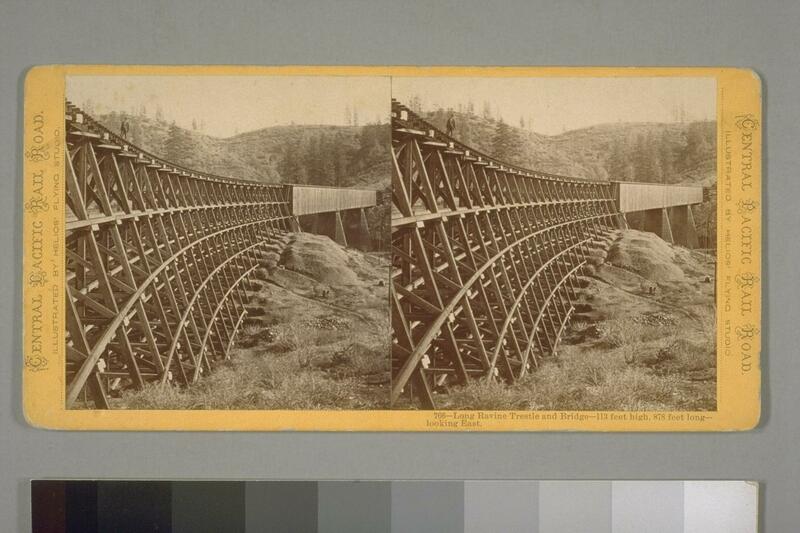 Bancroft Library lists title as: "Long Ravine Trestle and Bridge, 113 feet high--878 feet long--looking East." 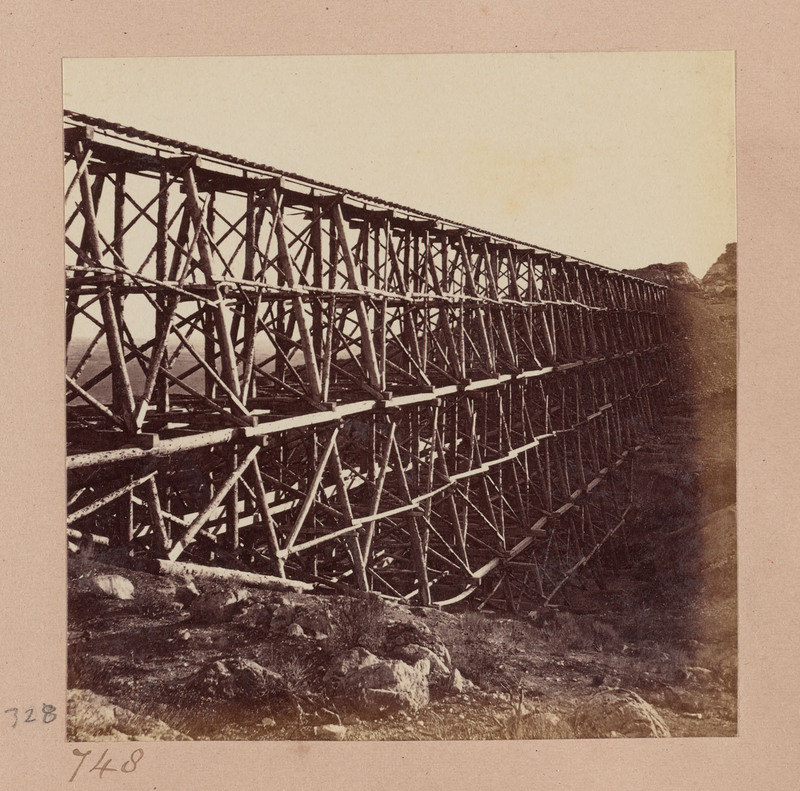 768 Muybridge: Long Ravine Trestle and Bridge, 113 feet high, 878 feet long, looking West. 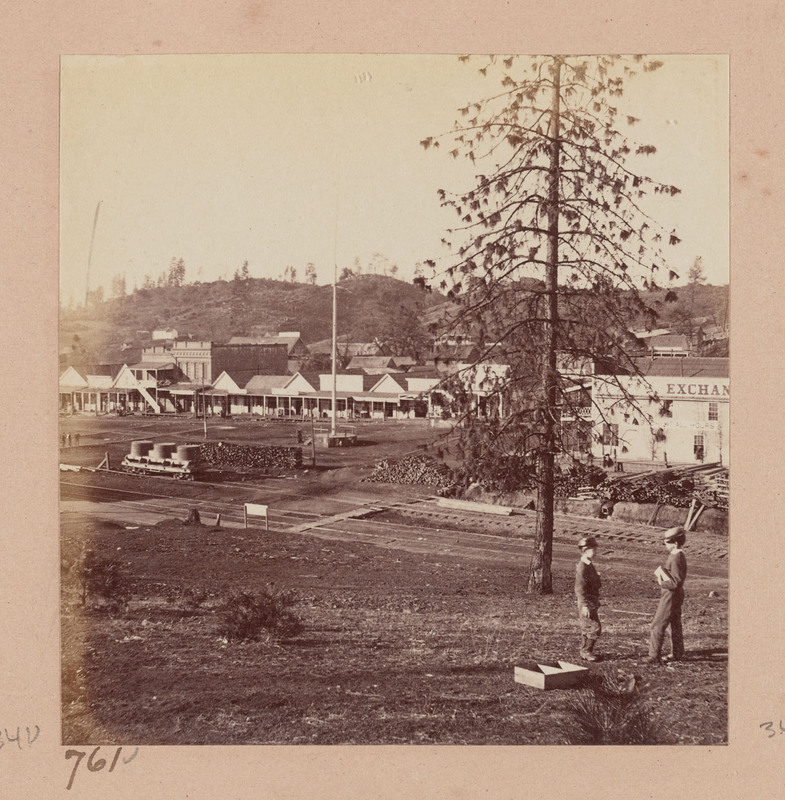 769 Muybridge: Distant View of Cape Horn, from near Colfax. 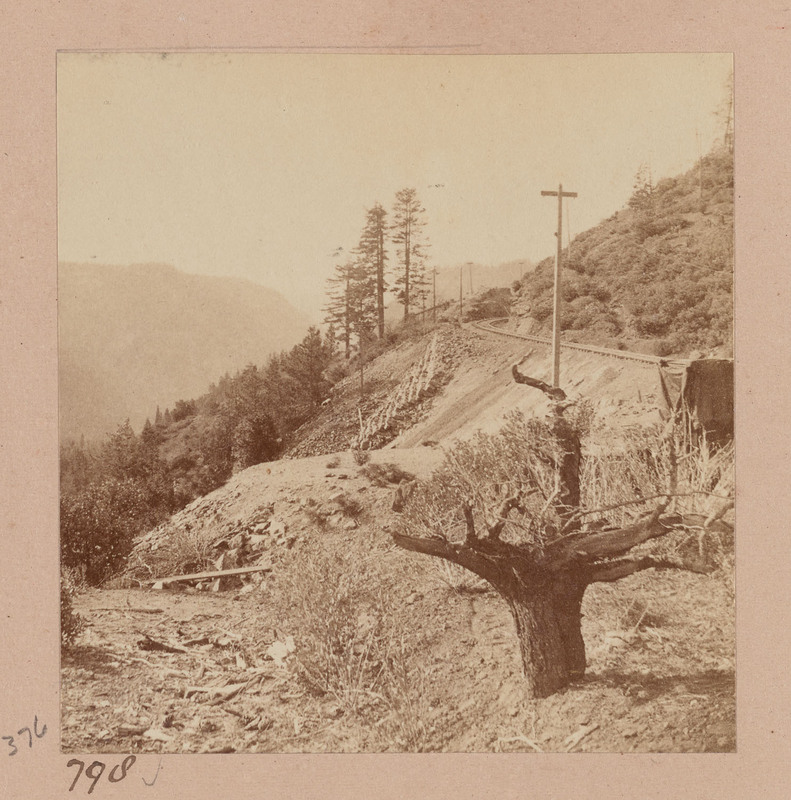 770 Muybridge: Cape Horn Valley from below, looking East. 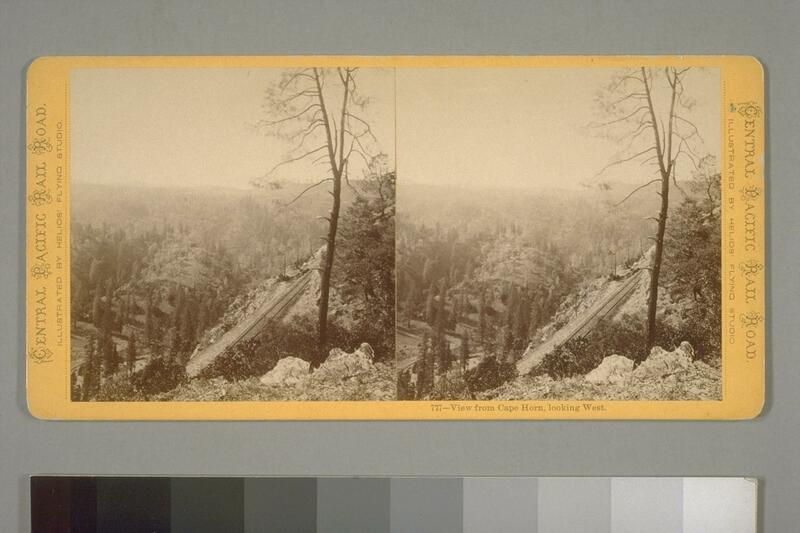 772 Muybridge: Cape Horn from Mineral Bar Bridge, 2,500 feet below. 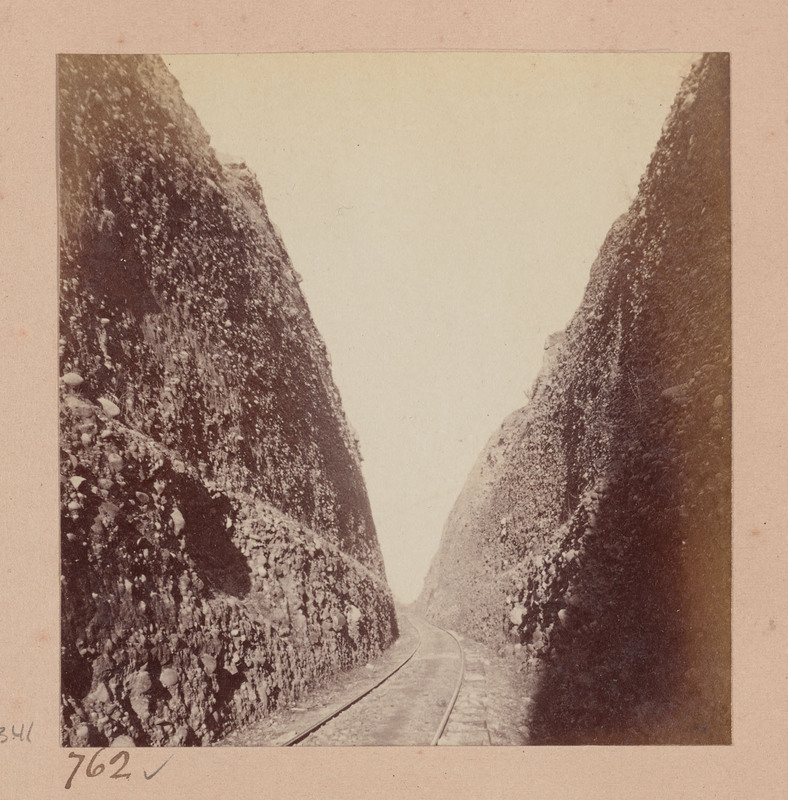 774 Muybridge: Cape Horn, looking West. 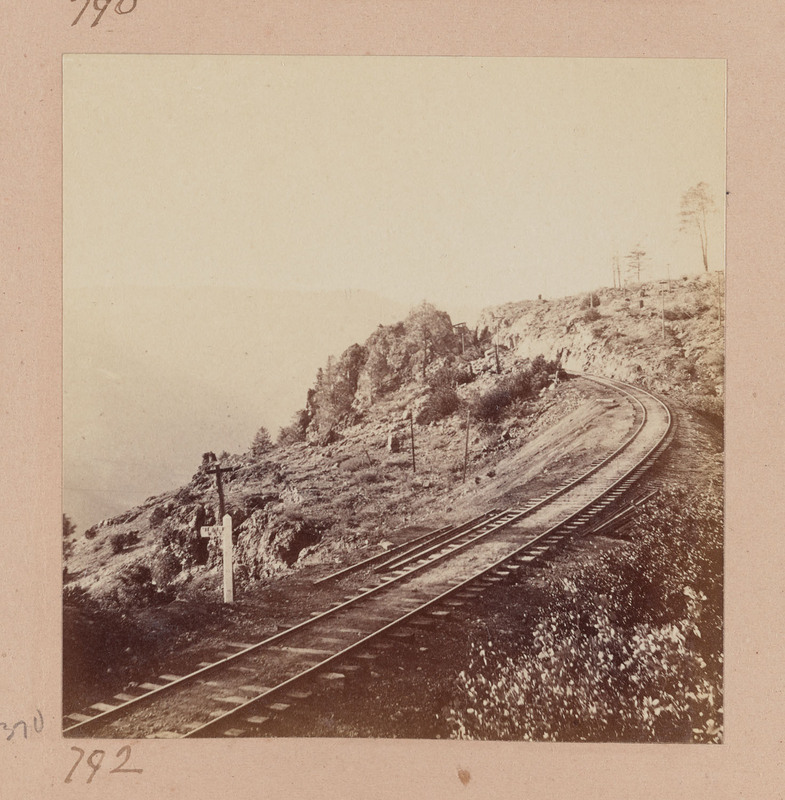 775 Muybridge: Cape Horn, looking East. 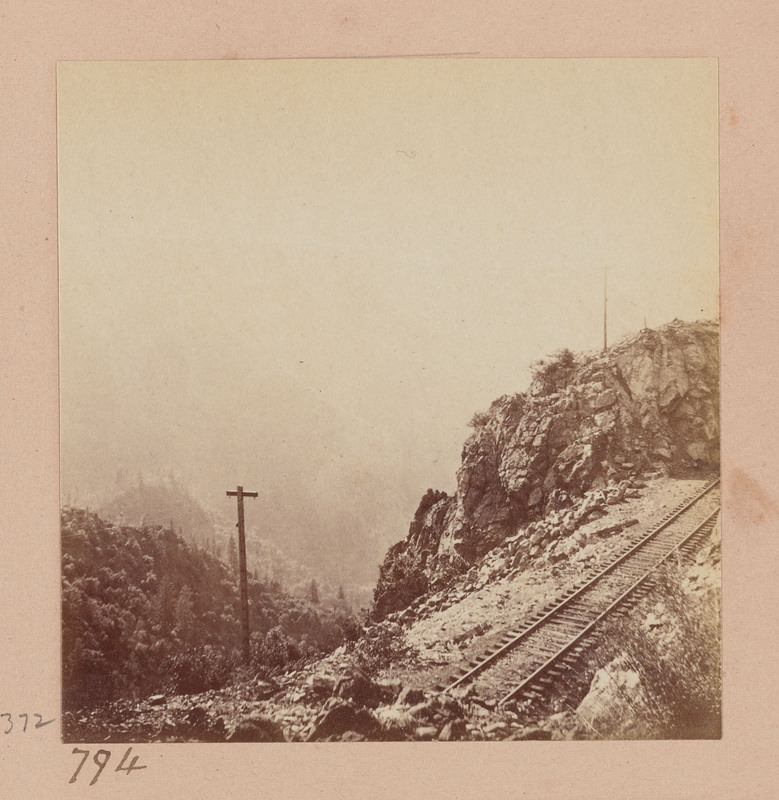 777 Muybridge: View from Cape Horn, looking West. 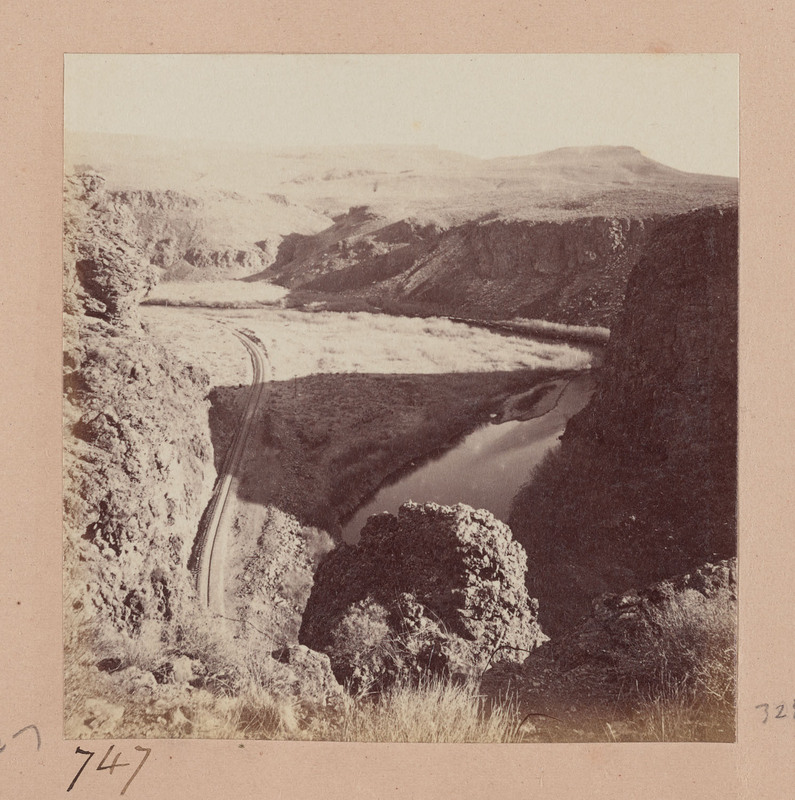 780 Muybridge: View from Cape Horn, looking South. Mineral Bar Bridge 2,500 feet below. 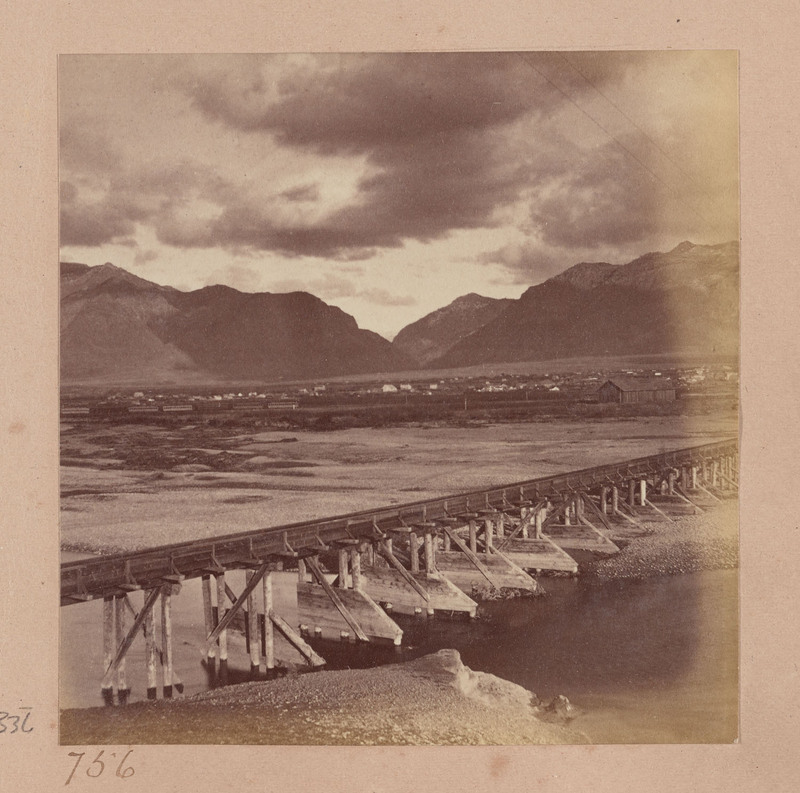 Bancroft Library lists title as: "View from Cape Horn, looking South--Mineral Bar Bridge 2,500 feet below." 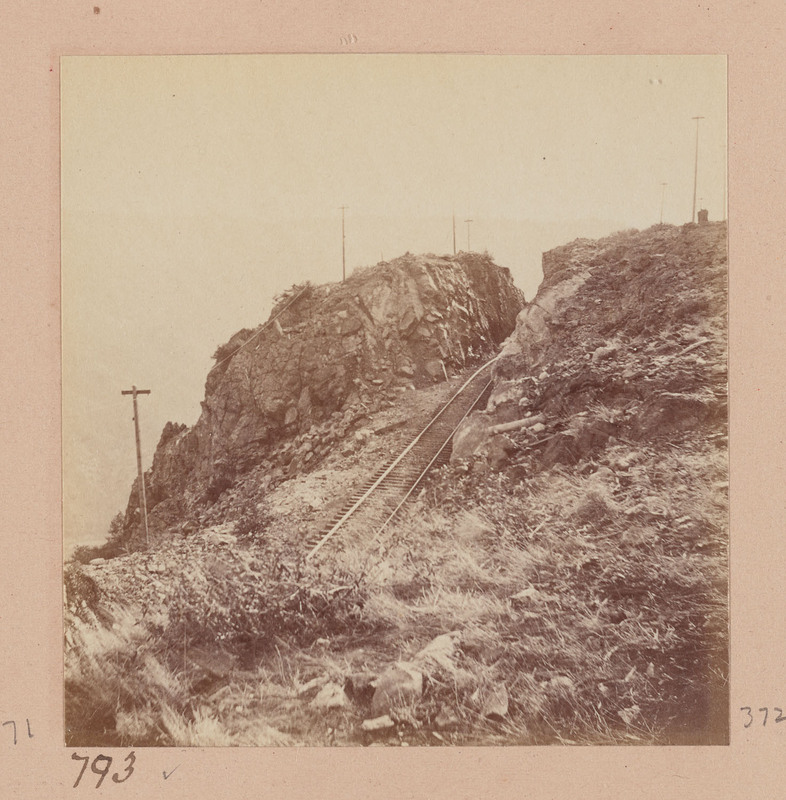 781 Muybridge: View from base of Cape Horn. 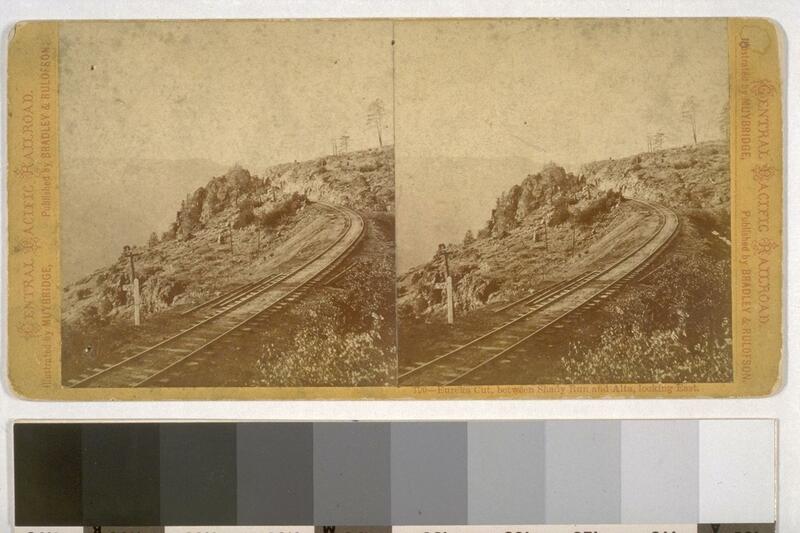 783 Muybridge: Gold Run, looking North. 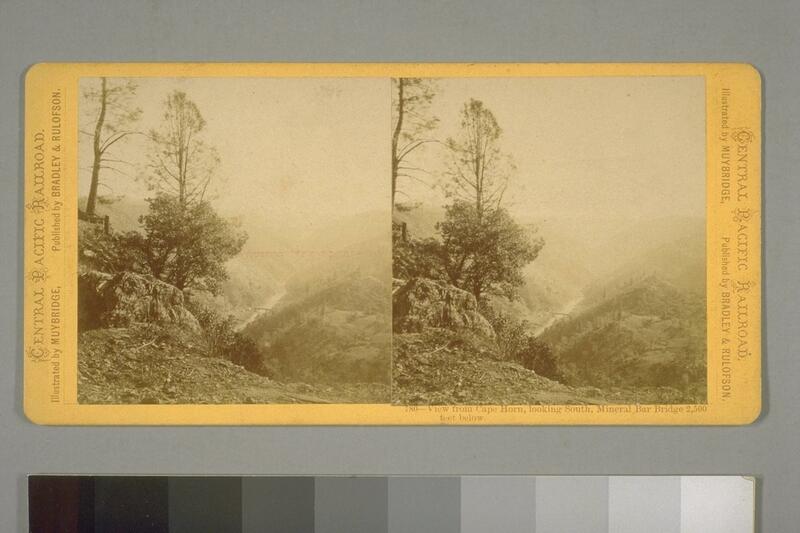 Bancroft Library lists title as: "Gold Run, looking South." 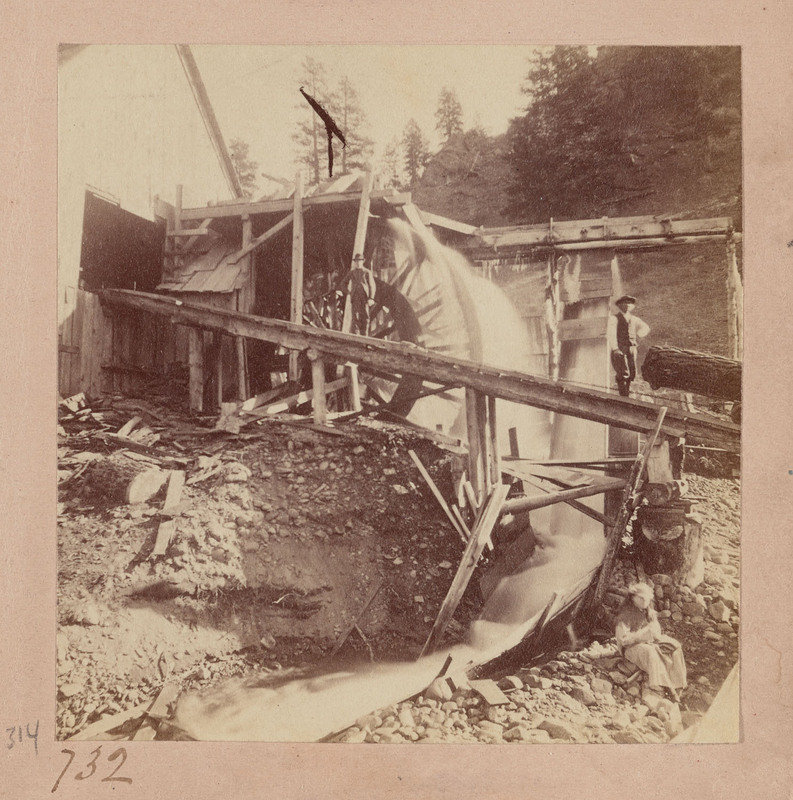 784 Muybridge: Flumes for Hydraulic Mining at Gold Run. 785 Muybridge: Alta, from the West. 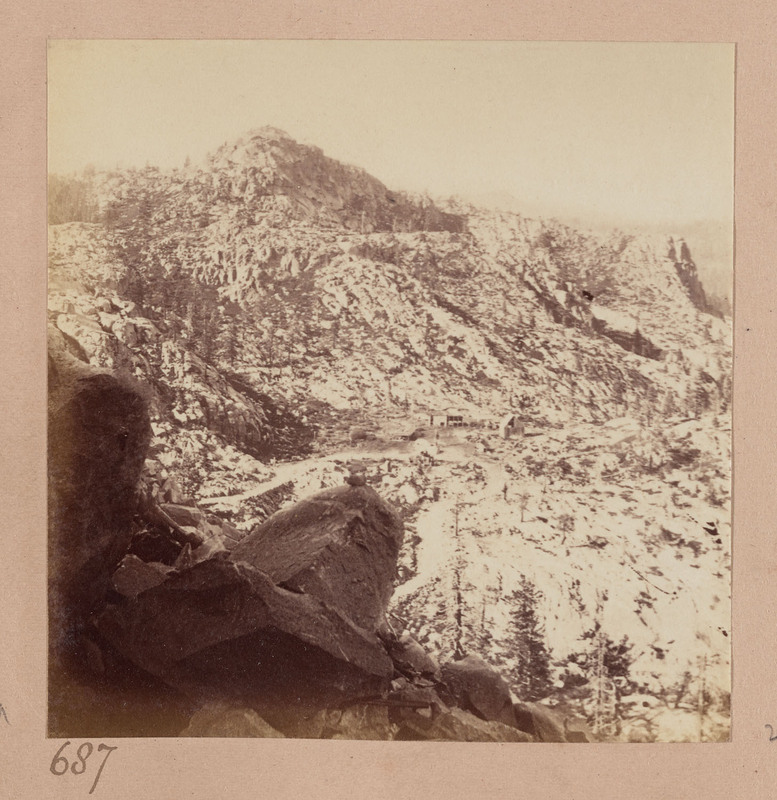 786 Muybridge: Winter View of Alta. 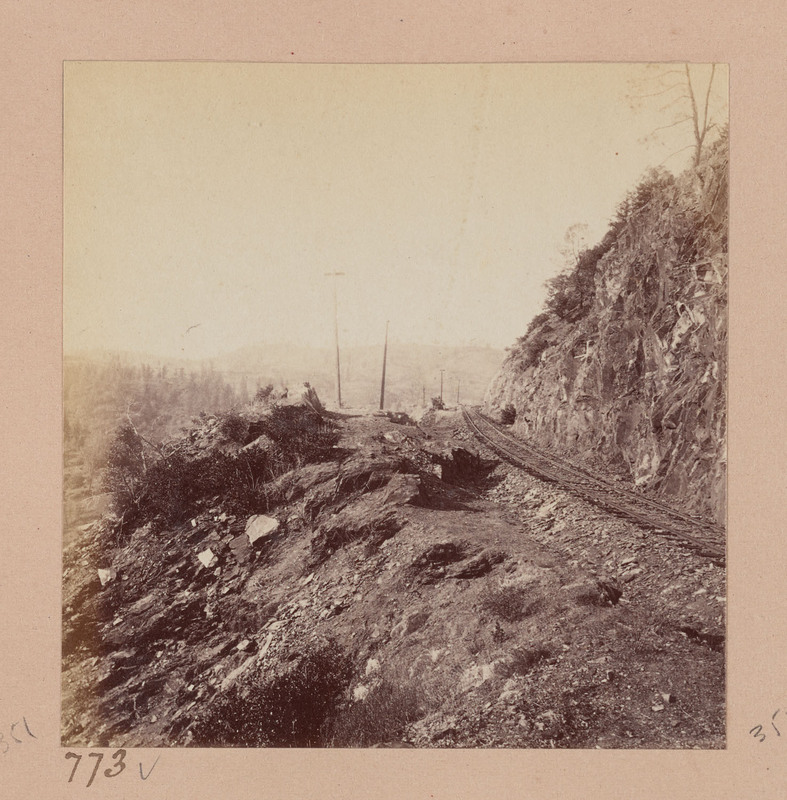 787 Muybridge: Cut at Alta, looking East. 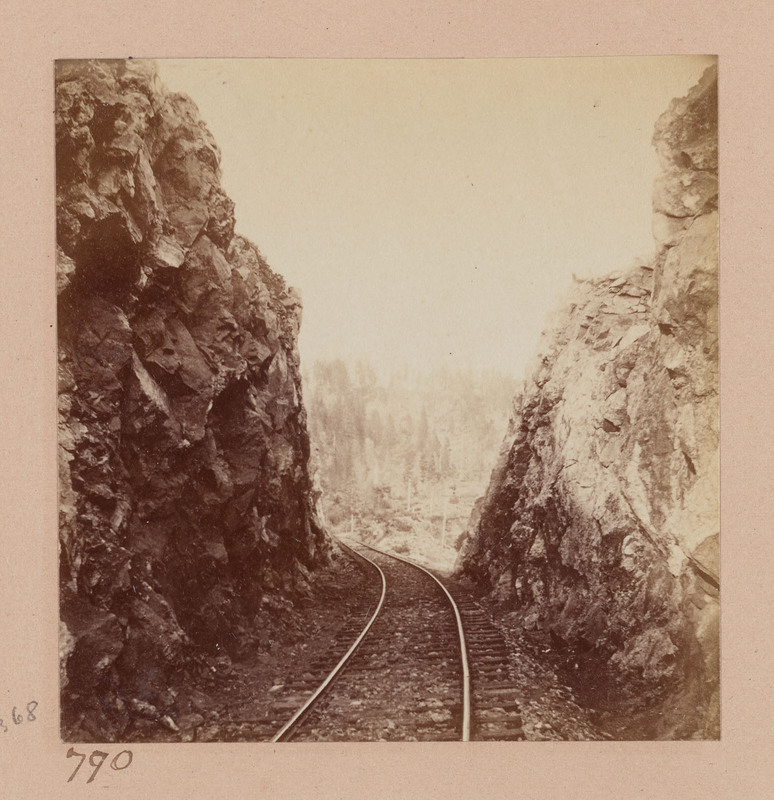 788 Muybridge: Cut at Alta, looking West. 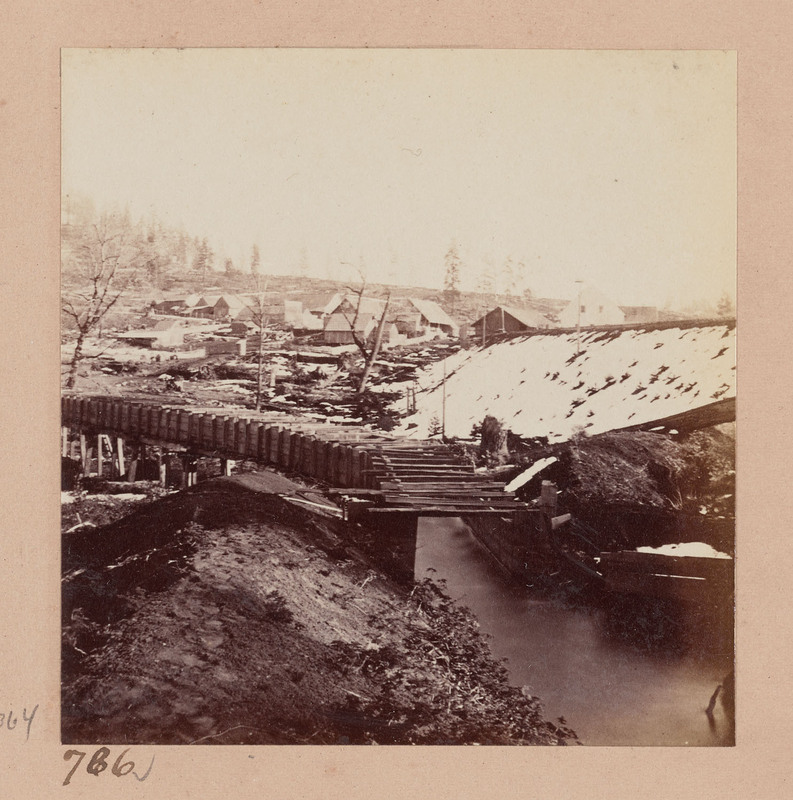 789 Muybridge: Cut at Alta, from the East. 790 Muybridge: Eureka Cut, between Shady Run and Alta, looking East. 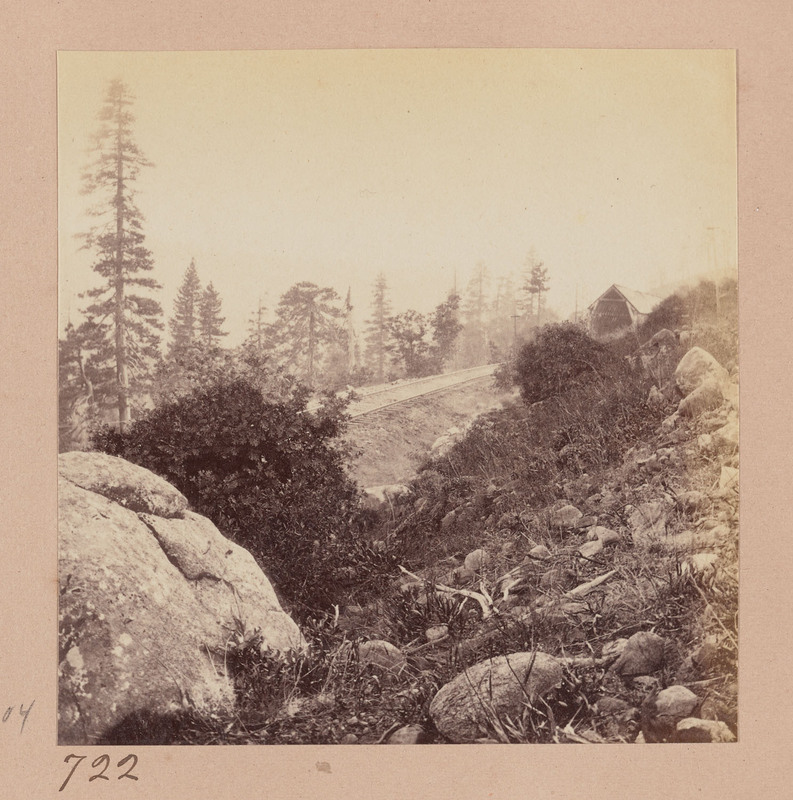 Bancroft Library lists title as: "Eureka Cut, between Shady Run and Alta, looking West." 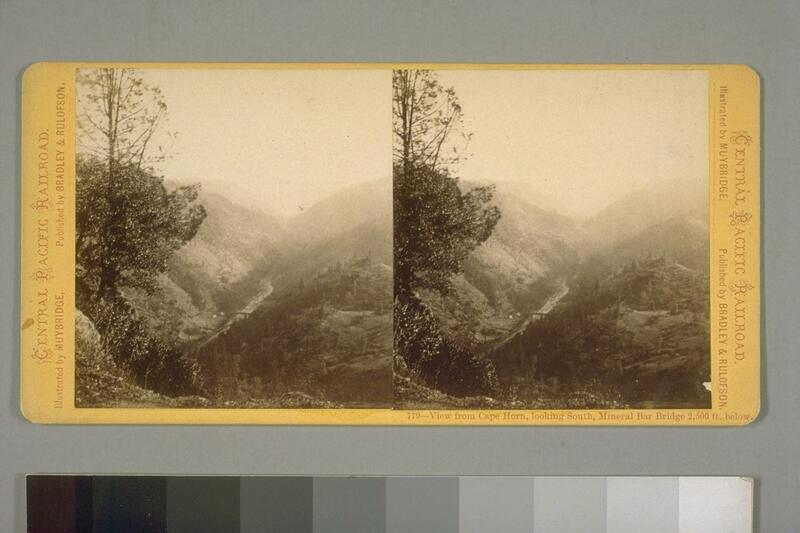 Bancroft Library lists variant view: "Eureka Cut, between Shady Run and Alta, looking east." 793 Muybridge: Eureka Cut, between Shady Run and Alta, looking West. 794 Muybridge: Green Valley from Eureka Cut, looking West. 795 Muybridge: Eureka Cut, looking West. 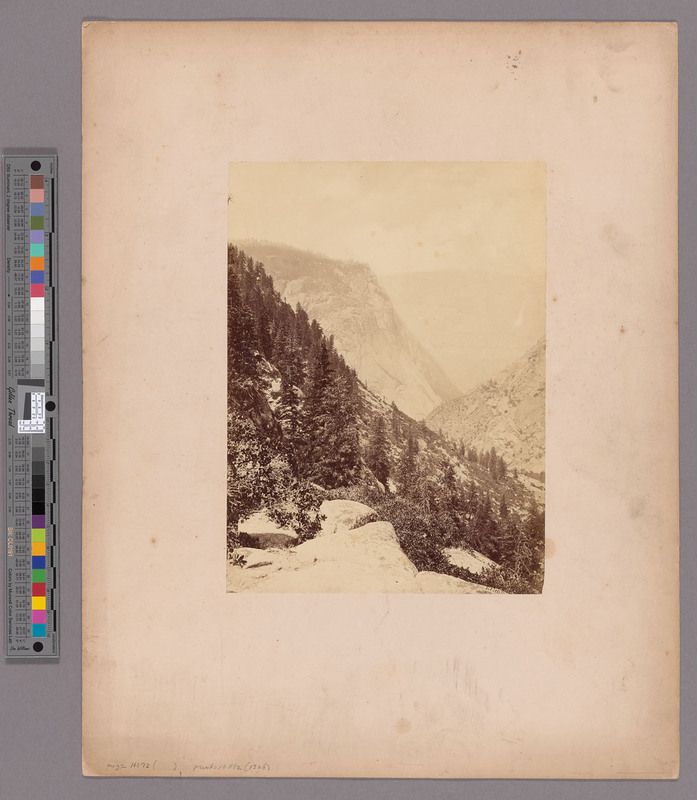 Bancroft Library lists title as: "Eureka Cut, between Shady Run and Alta, looking west." 796 Muybridge: Eureka Cut, looking East. 797 Muybridge: Green Valley from Eureka Cut, looking West. 798 Muybridge: Tri-Kanyon, point between Shady Run and Alta, looking West. 799 Muybridge: Tri-Kanyon, point between Shady Run and Alta, looking East. 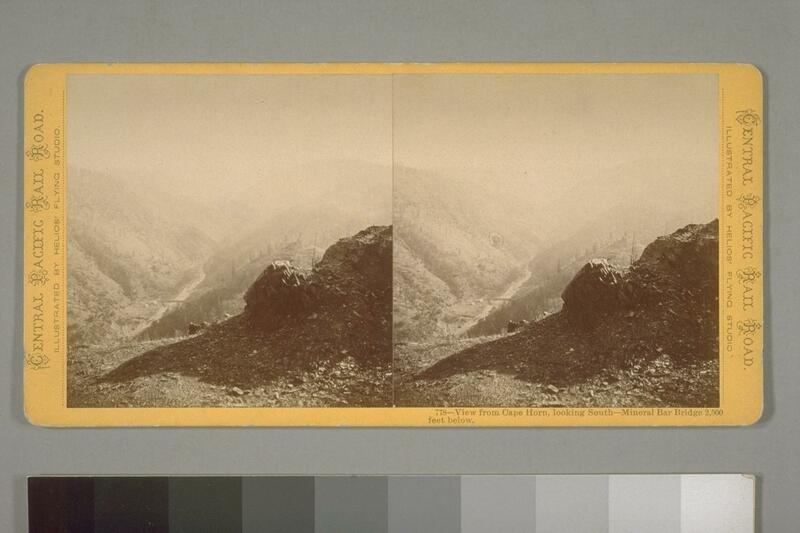 800 Muybridge: Giant's Gap from Tri-Kanyon, point looking West. This road extends from Omaha to Ogden, a distance of 1,032 miles, and crosses the Rocky Mountains at an elevation of 8,212 feet above sea level. 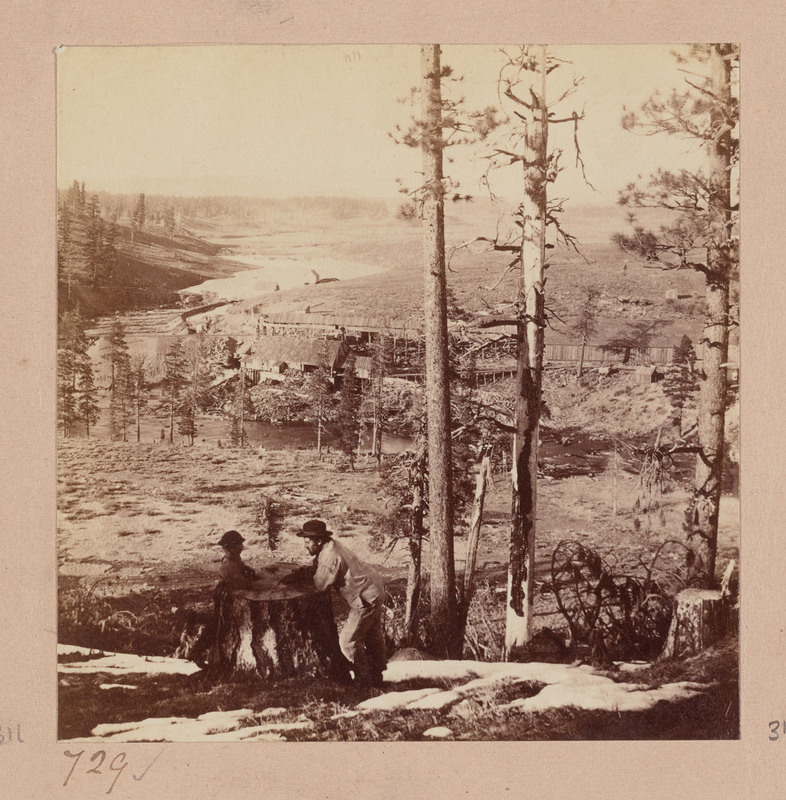 For a long distance this road extends over elevated plateaus, affording few points of scenic interest; but in the neighborhood of Sherman on the Black Hills, on the banks of the Weber, and in the Echo and Weber Canyons, many beautiful and interesting views may be obtained." 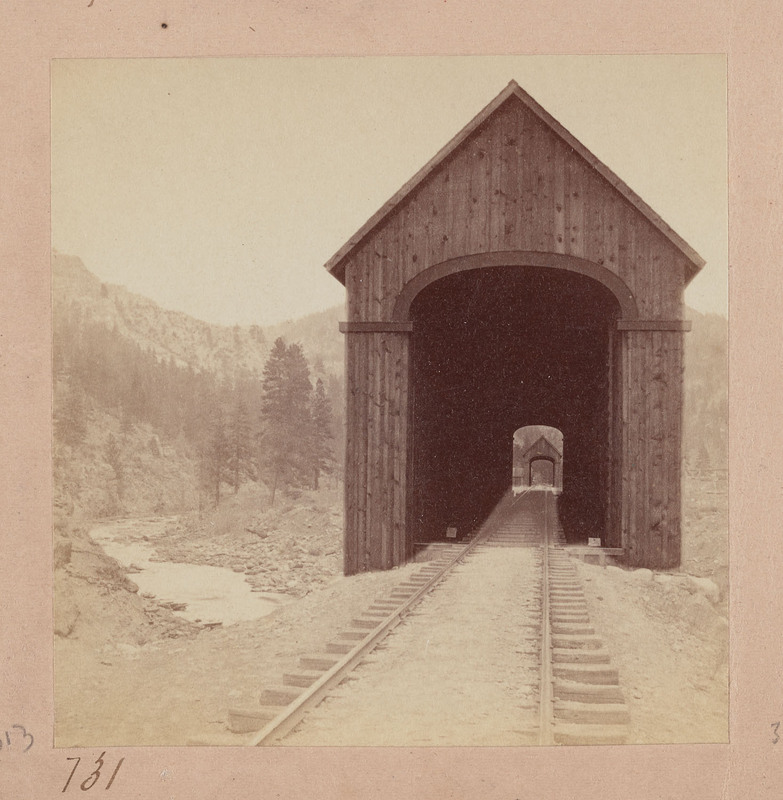 804 Muybridge: Devil's Gate Bridge, Lower Weber Canyon, looking West. 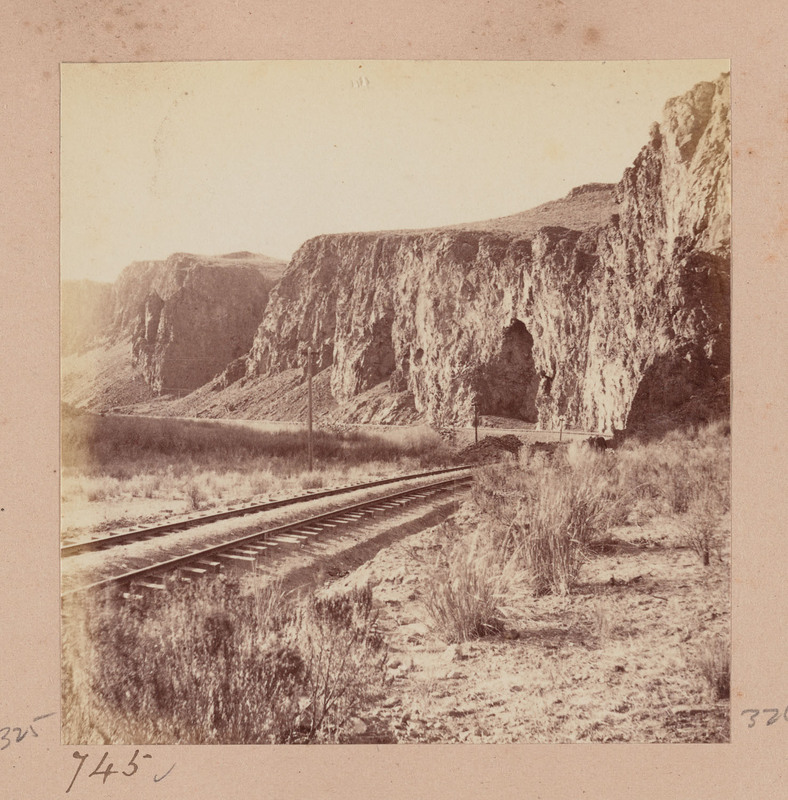 805 Muybridge: Devil's Gate, Lower Weber Canyon, from the railroad, looking West. 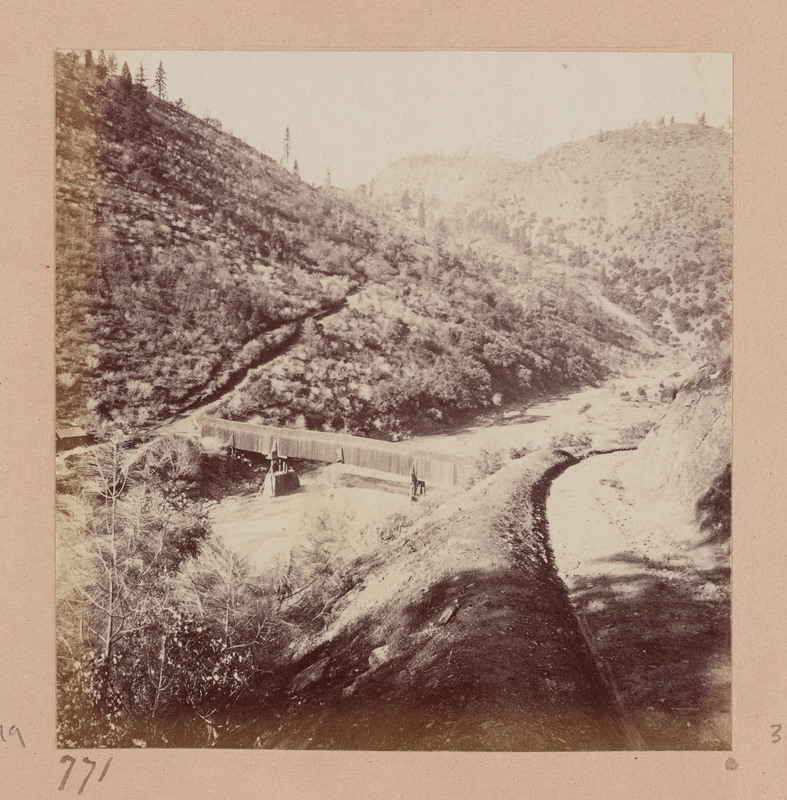 807 Muybridge: Devil's Gate, Lower Weber Canyon, looking South, railroad in the distance. 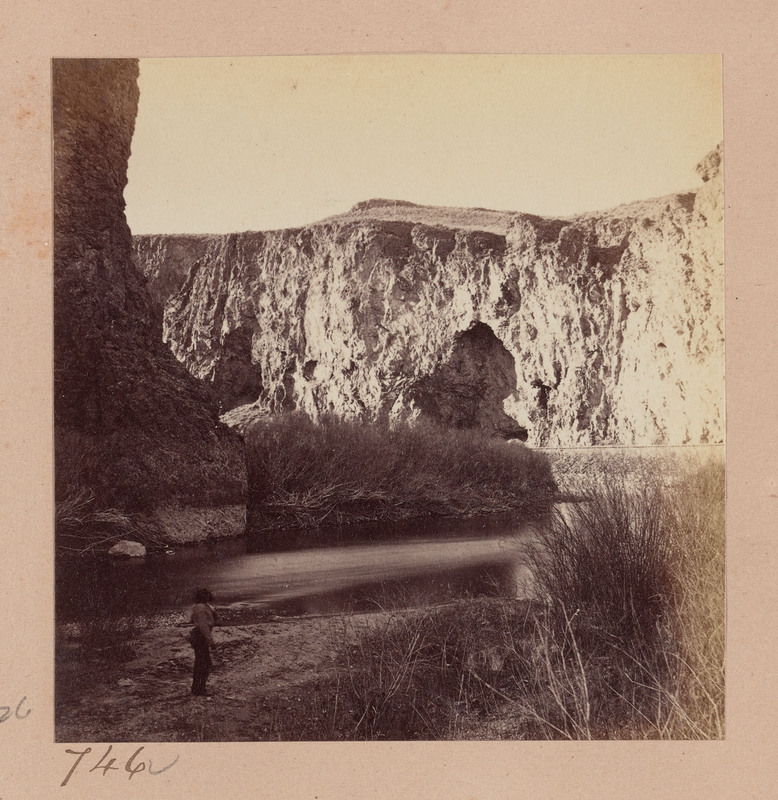 808 Muybridge: Devil's Gate, Lower Weber Canyon, looking West. 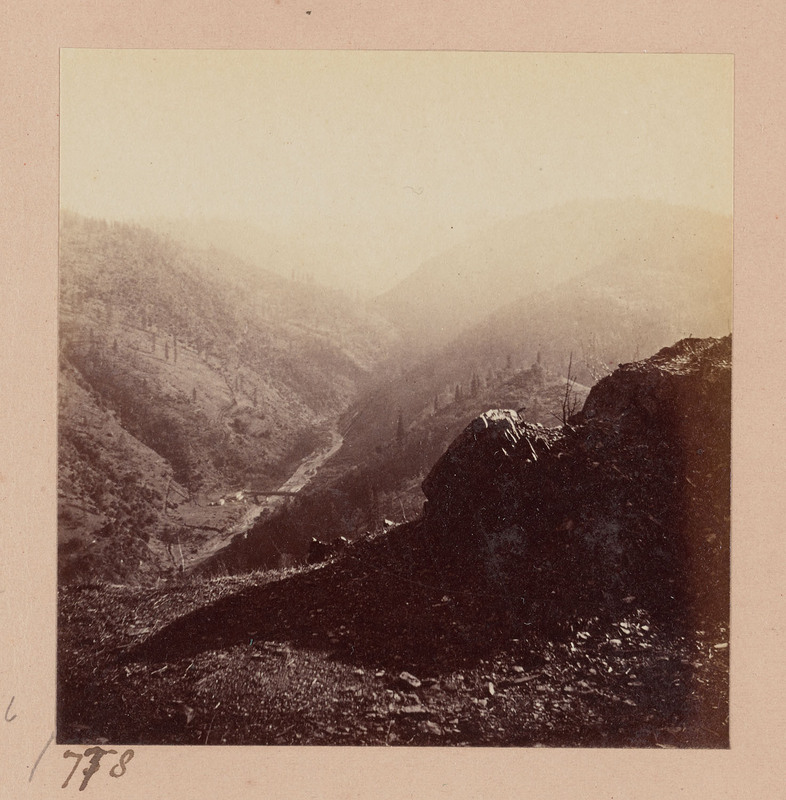 809 Muybridge: Lower Weber Canyon, from Devil's Gate, looking East. 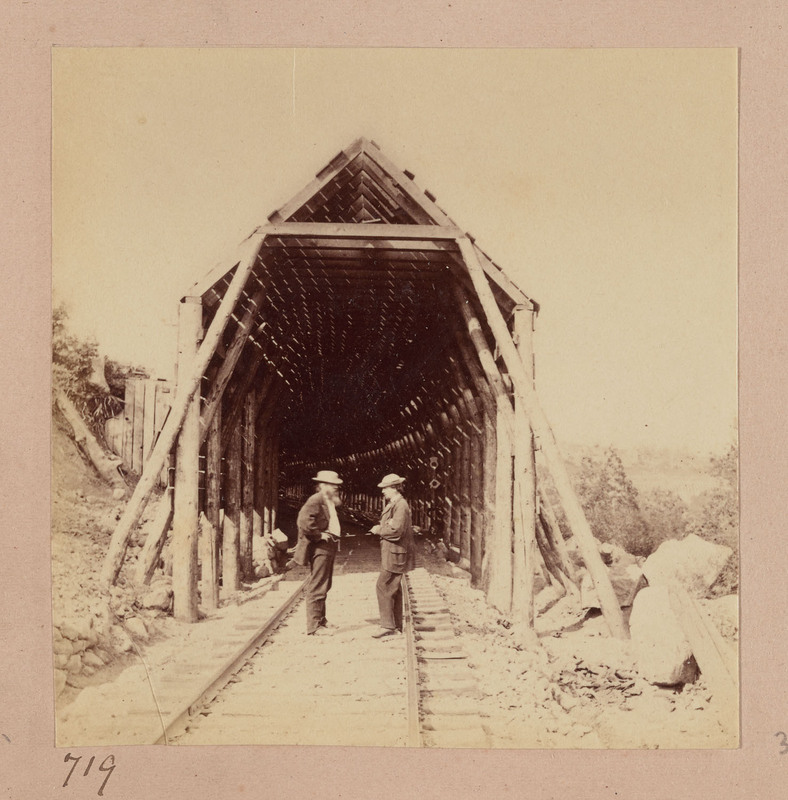 810 Muybridge: Tunnel No. 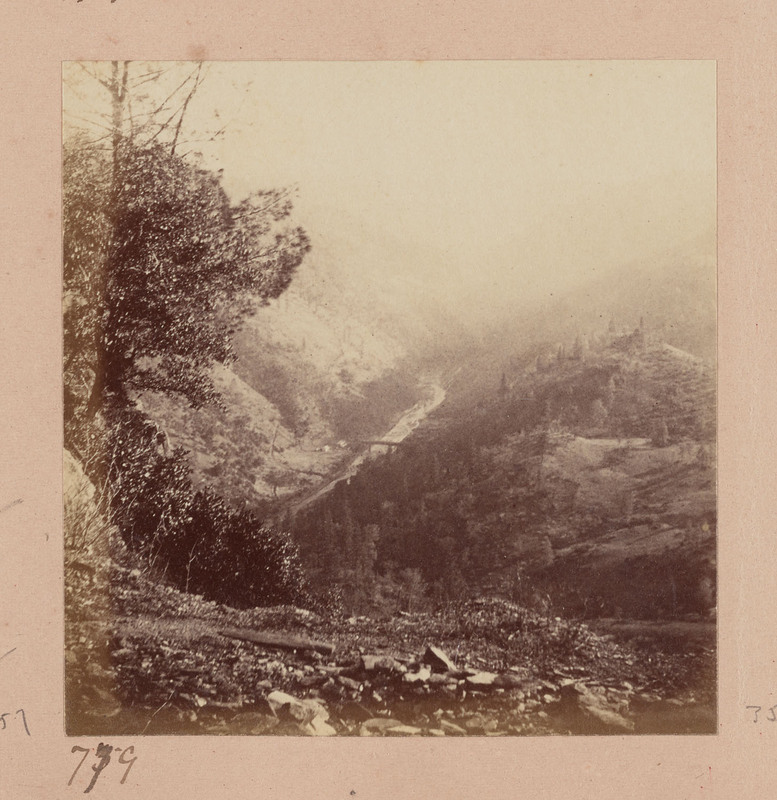 3, Upper Weber Canyon, looking West. 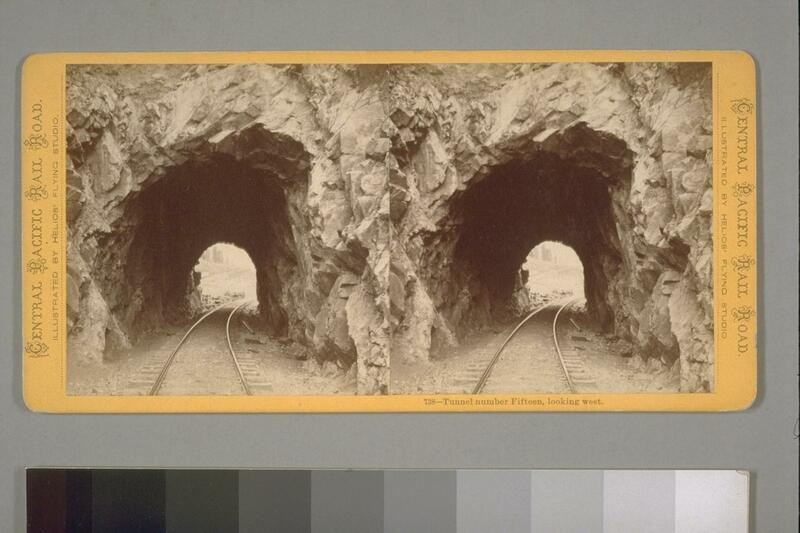 811 Muybridge: Upper Weber Canyon, from Tunnel No. 8, looking East. 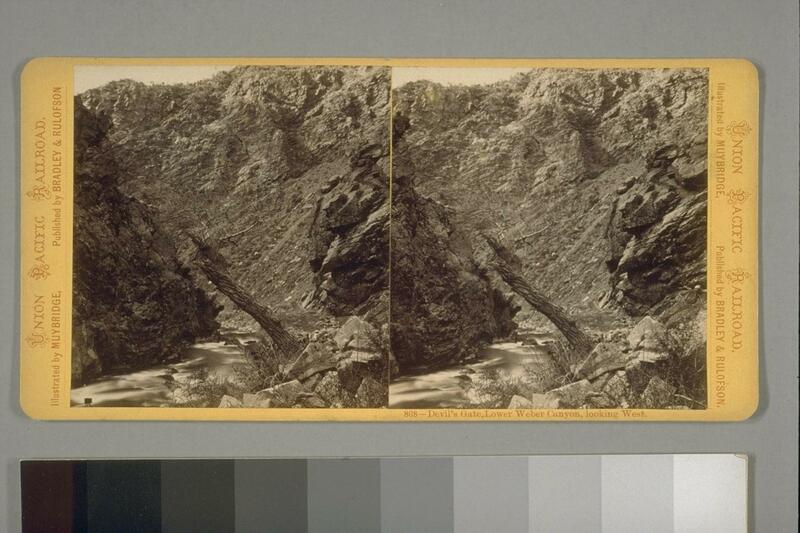 812 Muybridge: Bend of the Weber, Upper Weber Canyon, near Tunnel No. [?] looking West. 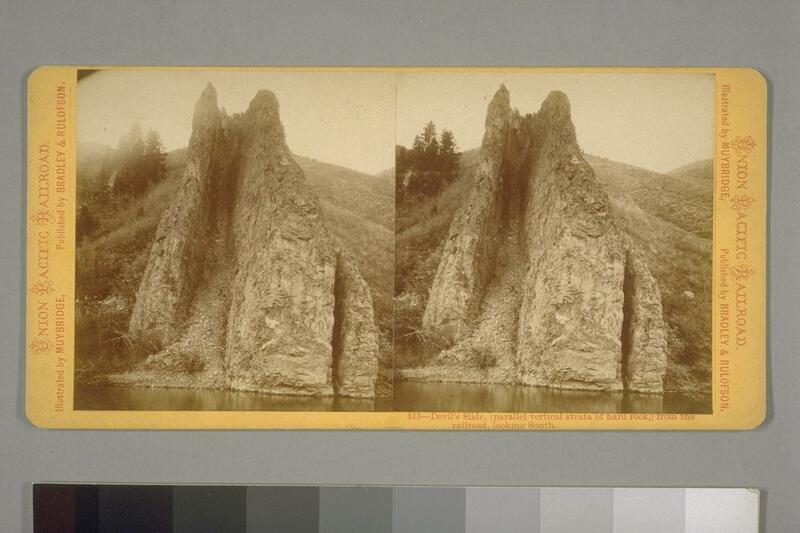 813 Muybridge: Index Rock, near Tunnel No. 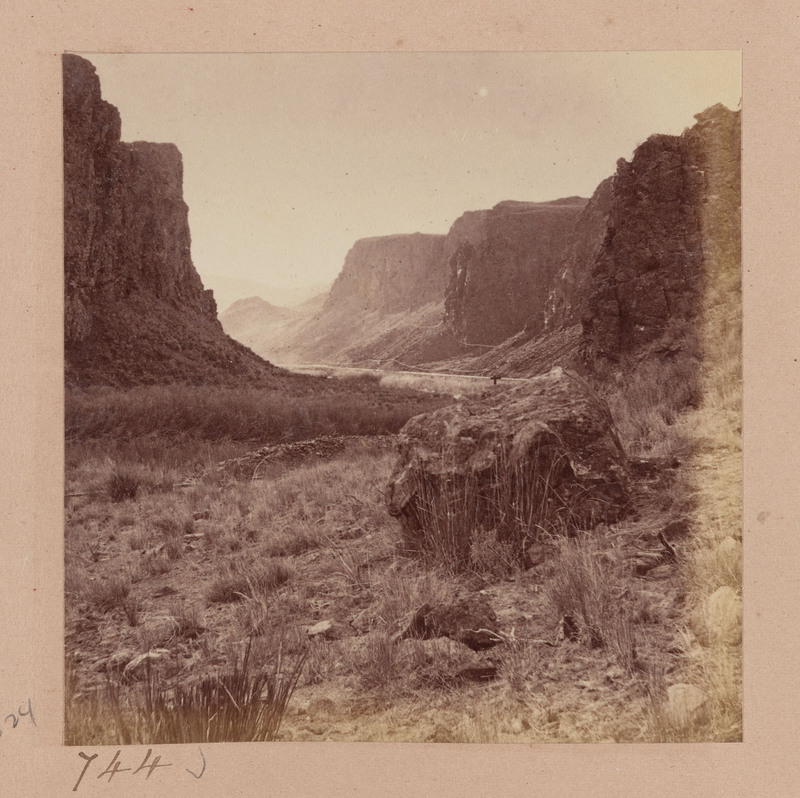 3, Upper Weber Canyon, looking East. 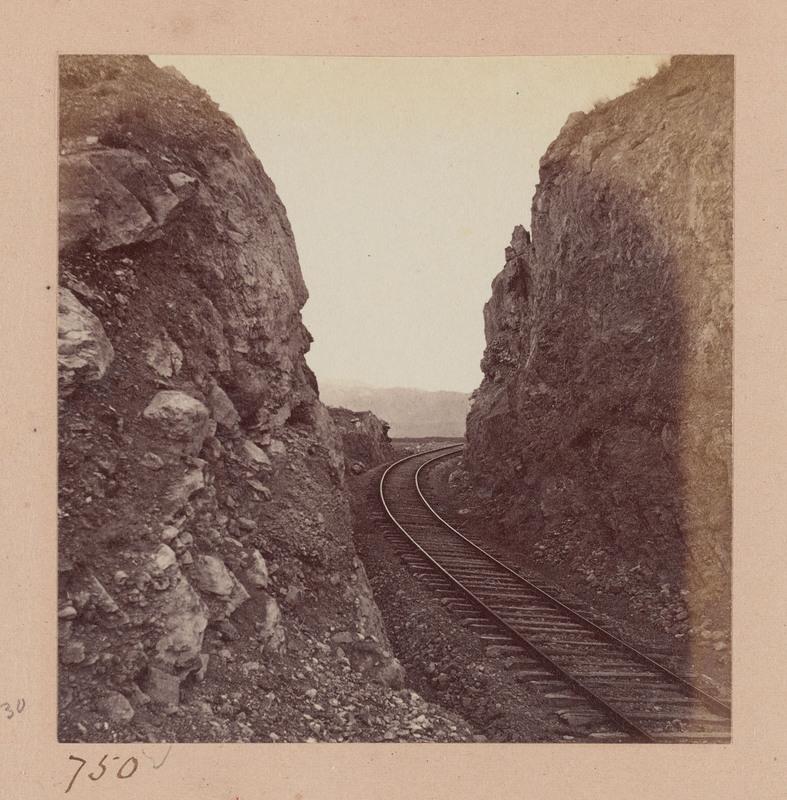 815 Muybridge: Devil's Slide (parallel vertical strata of hard rock) from the railroad, looking South. 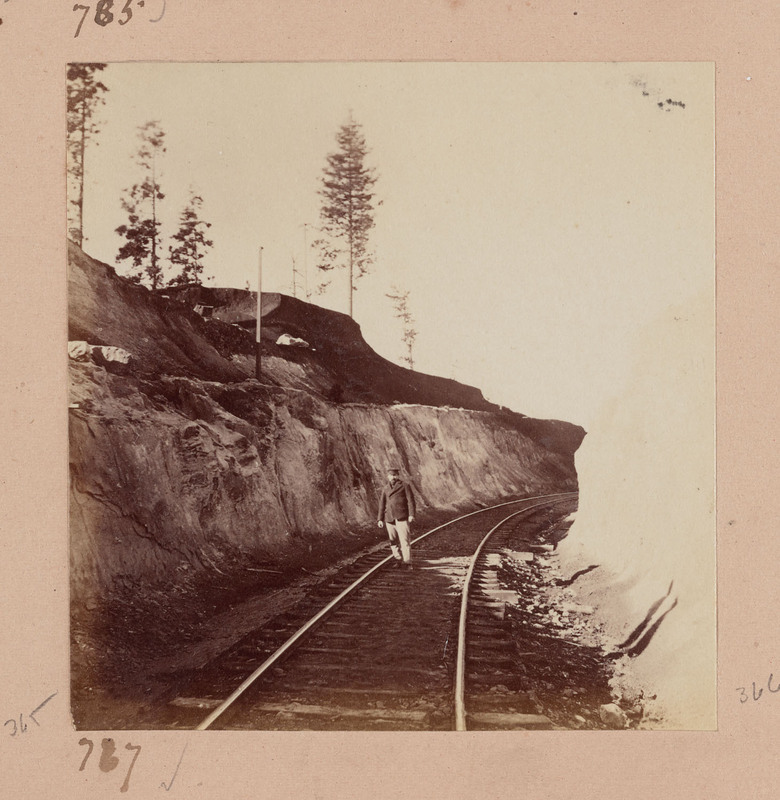 Bancroft Library lists title as: 814 "Devil's Slide, Upper Weber Kanyon, from the railroad, looking south." 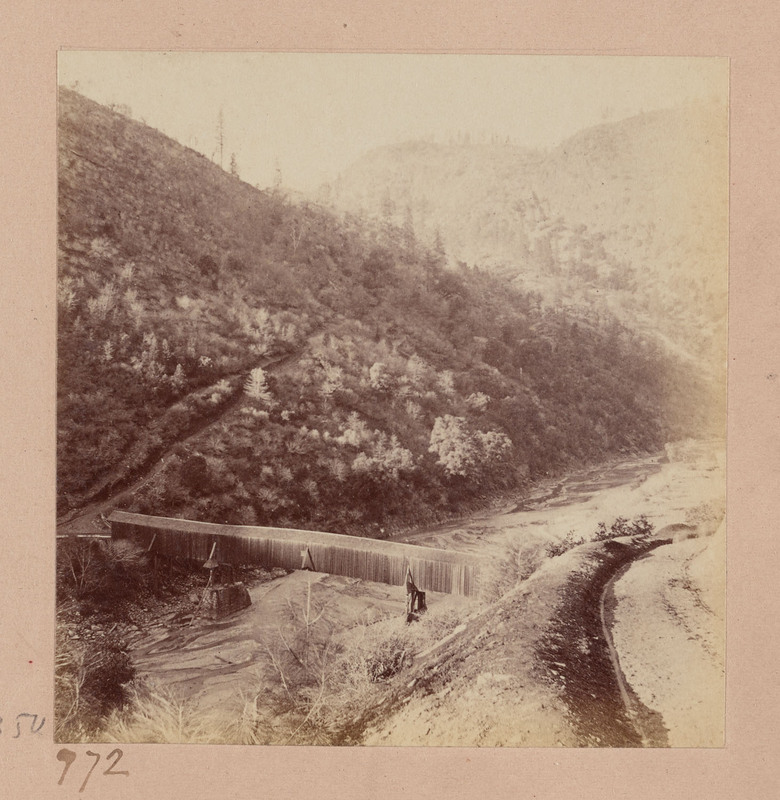 816 Muybridge: Bridge on the Weber, near Devil's Slide, looking West. 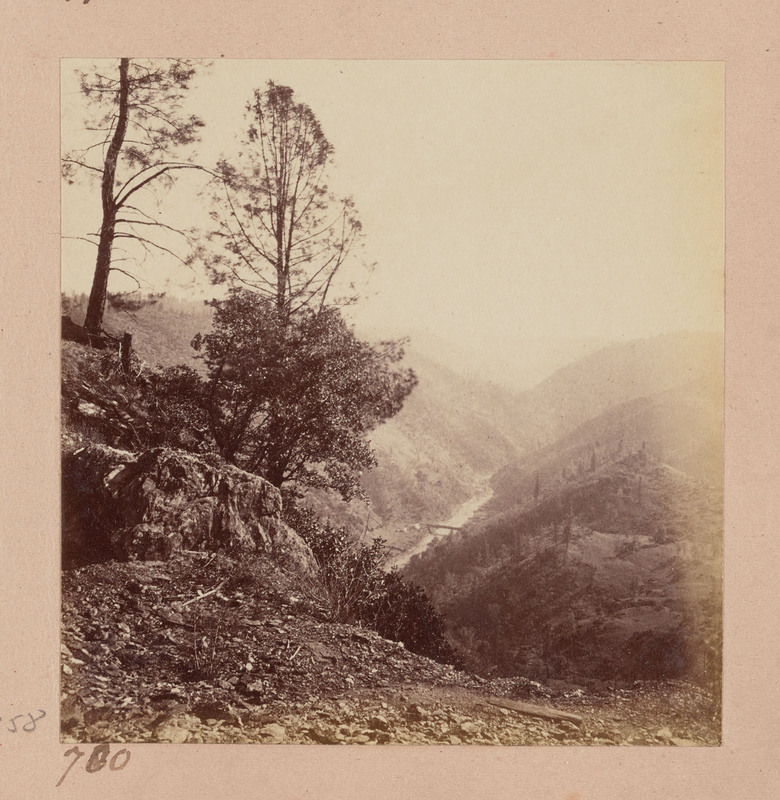 817 Muybridge: View on the Weber, near Devil's slide, looking East. 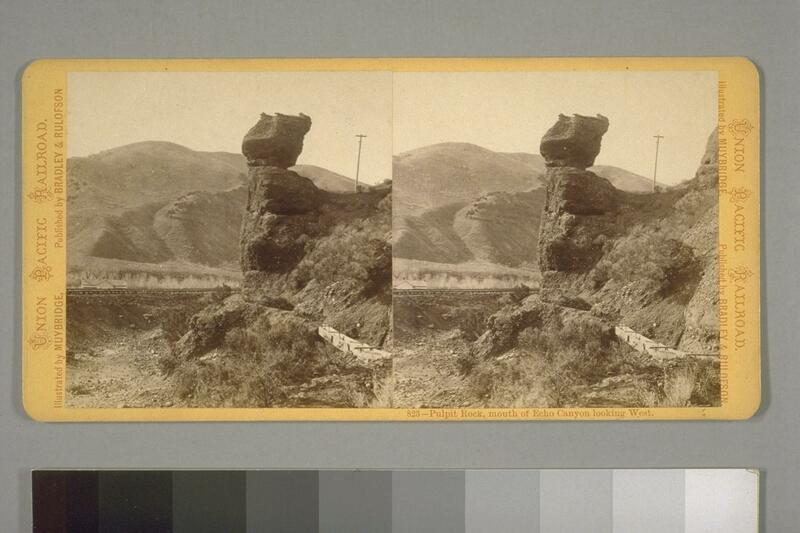 818 Muybridge: Sphynx Rock, and Crossing of the Weber, near Devil's Slide, looking East. 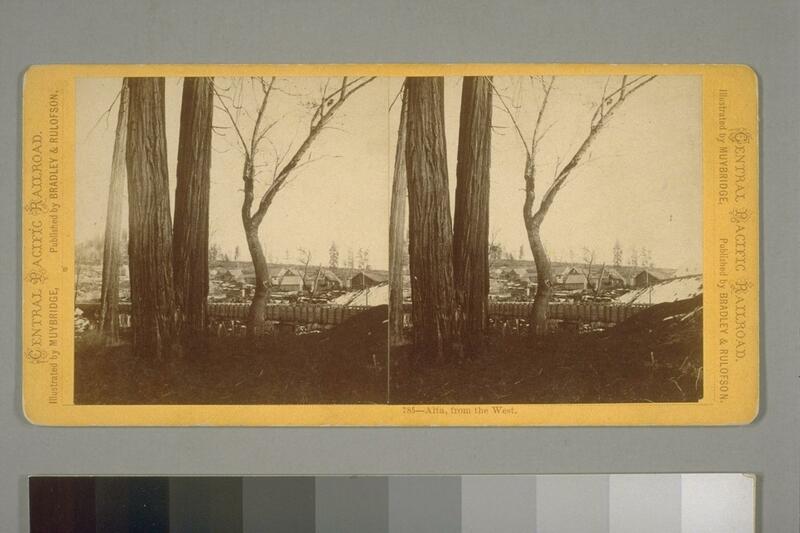 819 Muybridge: Thousand mile tree, 1000 miles West of Omaha. 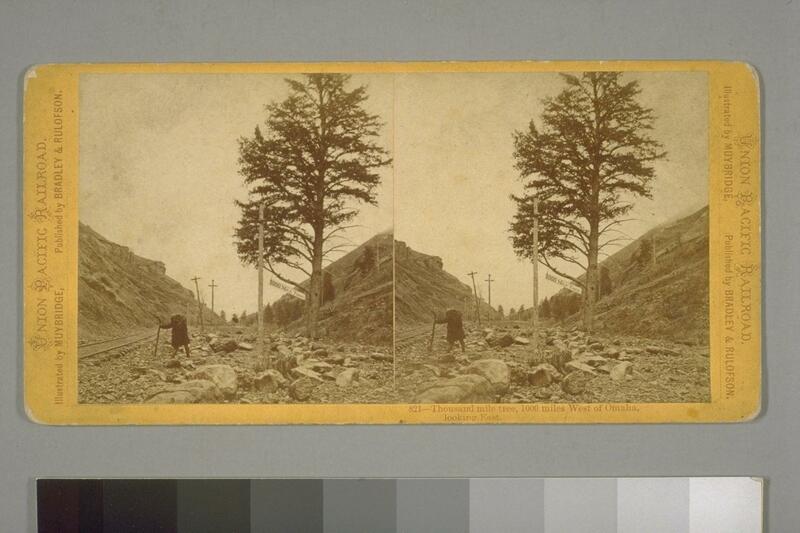 820 Muybridge: Thousand mile tree, 1000 miles West of Omaha, looking West. 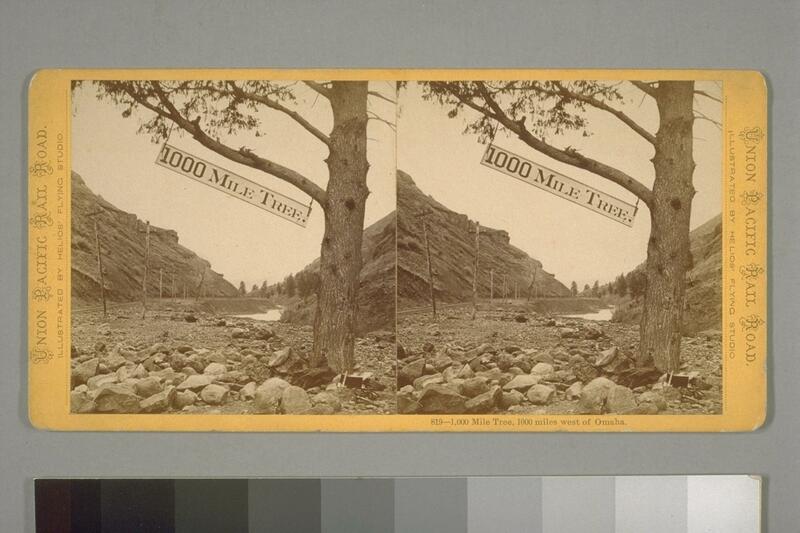 821 Muybridge: Thousand mile tree, 1000 miles West of Omaha, looking East. 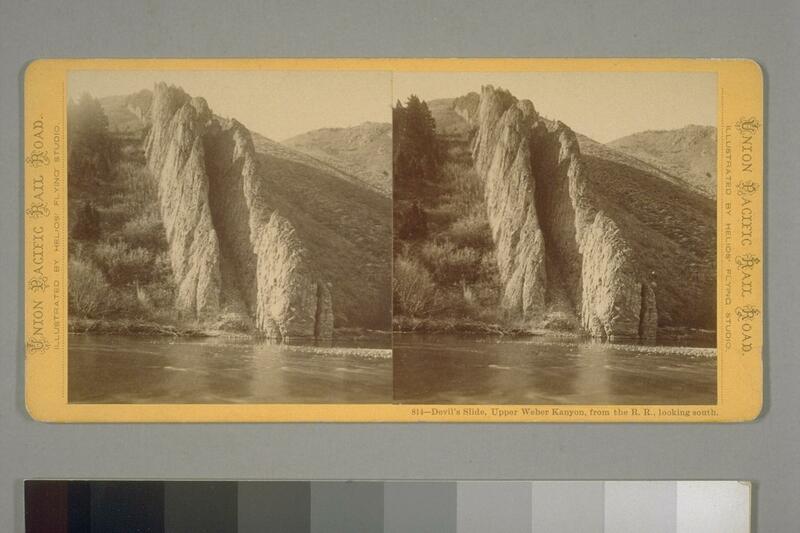 822 Muybridge: Mouth of Echo Canyon, Pulpit Rock and Weber River, looking West. 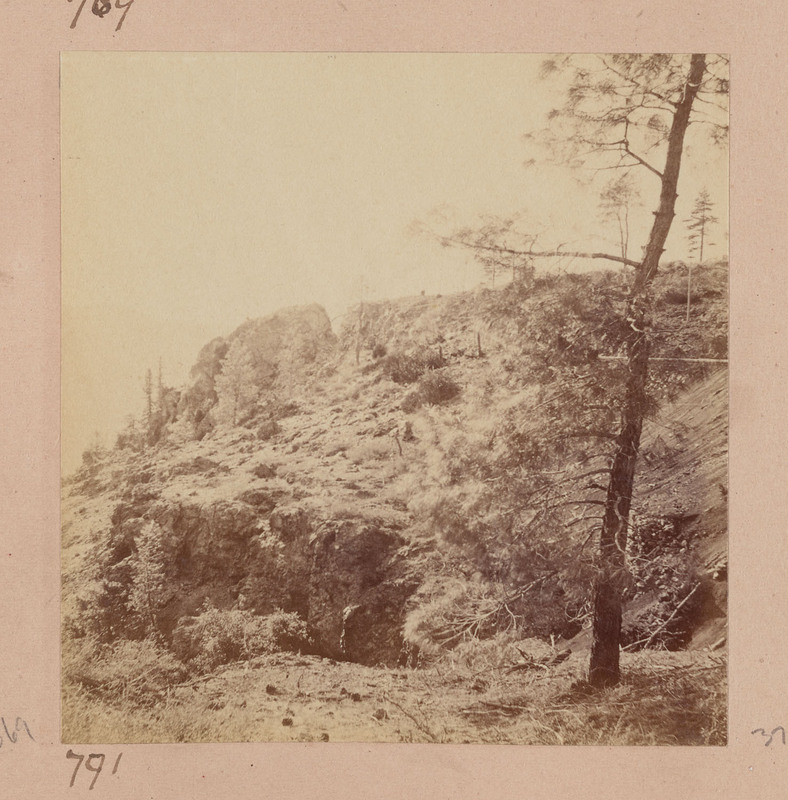 824 Muybridge: Pulpit Rock, mouth of Echo Canyon looking West. 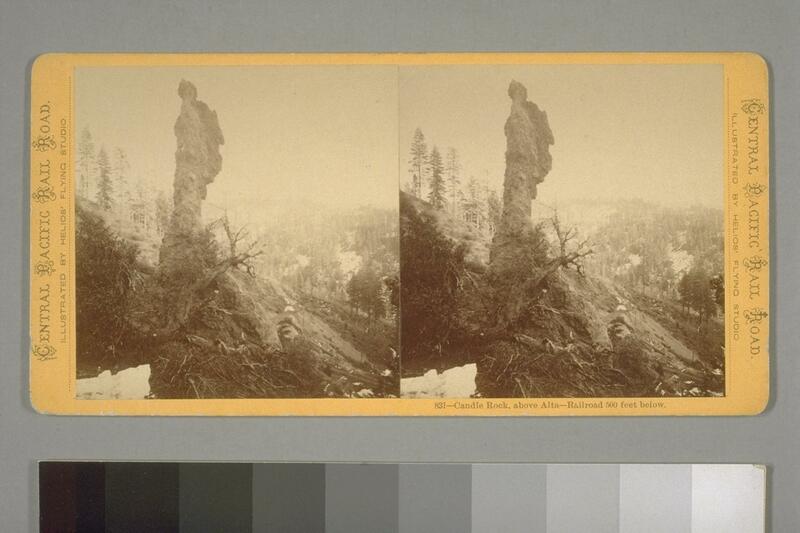 825 Muybridge: Beacon Rock, near Castle Rock Stations, Echo Canyon, after a Snow Storm. 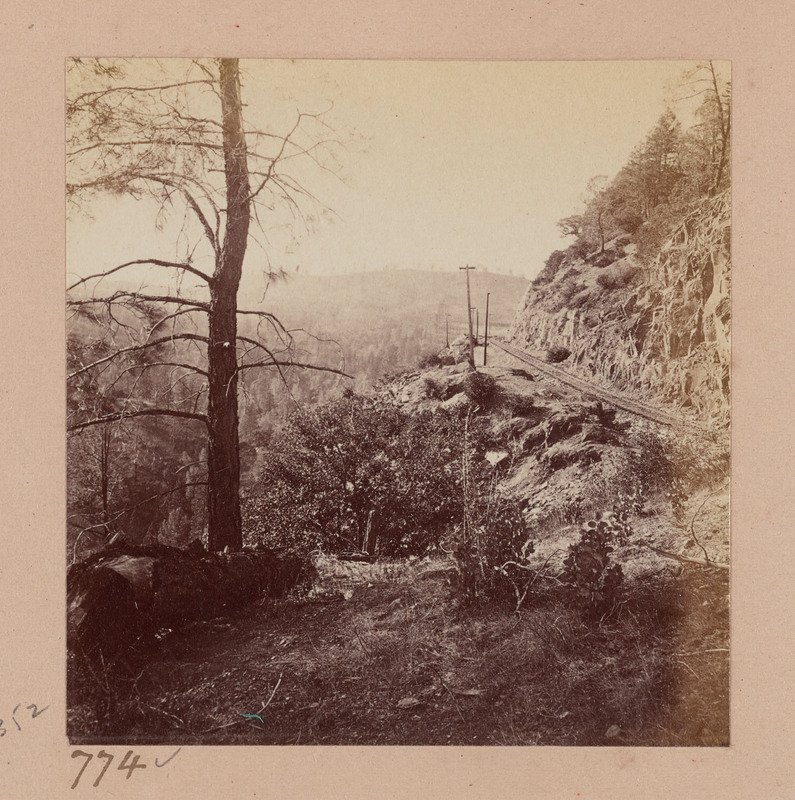 826 Muybridge: Watch Tower, near Castle Rock Station, Echo Canyon. 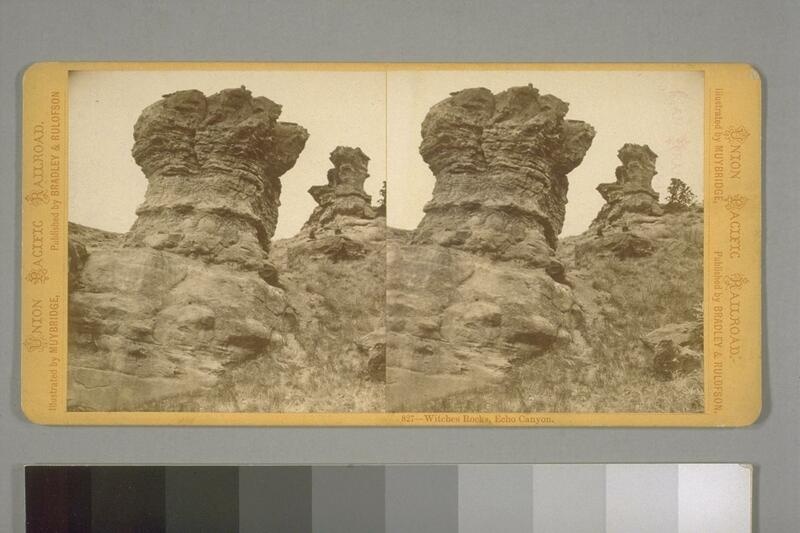 828 Muybridge: Witches Rocks, Echo Canyon. CATALOG ... [June] 1873. See pp. 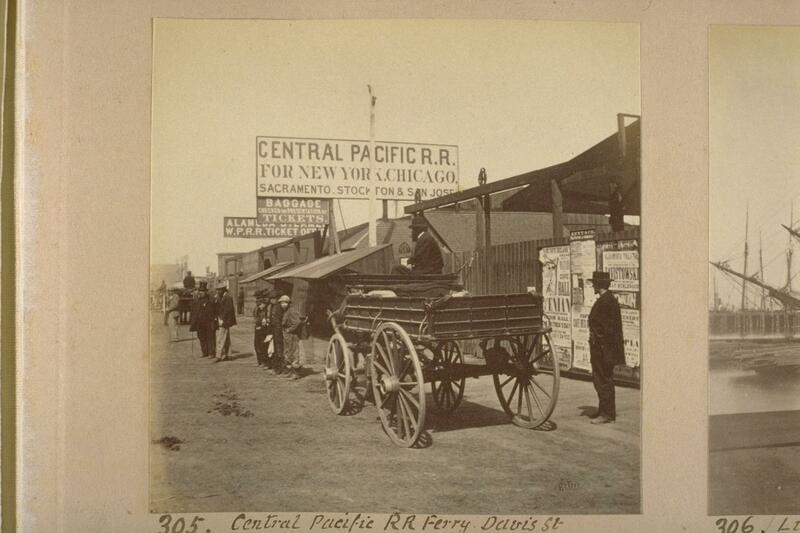 13-16: "CENTRAL PACIFIC RAILROAD. 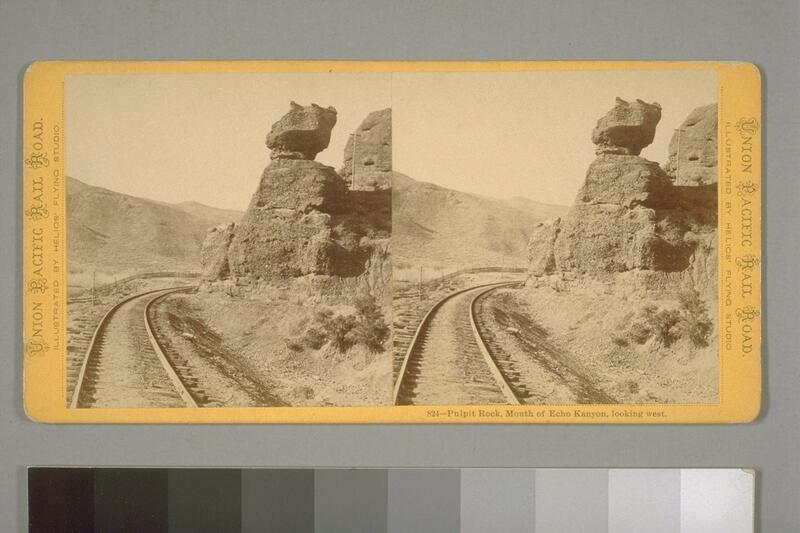 ... "
831 Muybridge: Candle Rock, near Alta, Railroad 500 feet below. 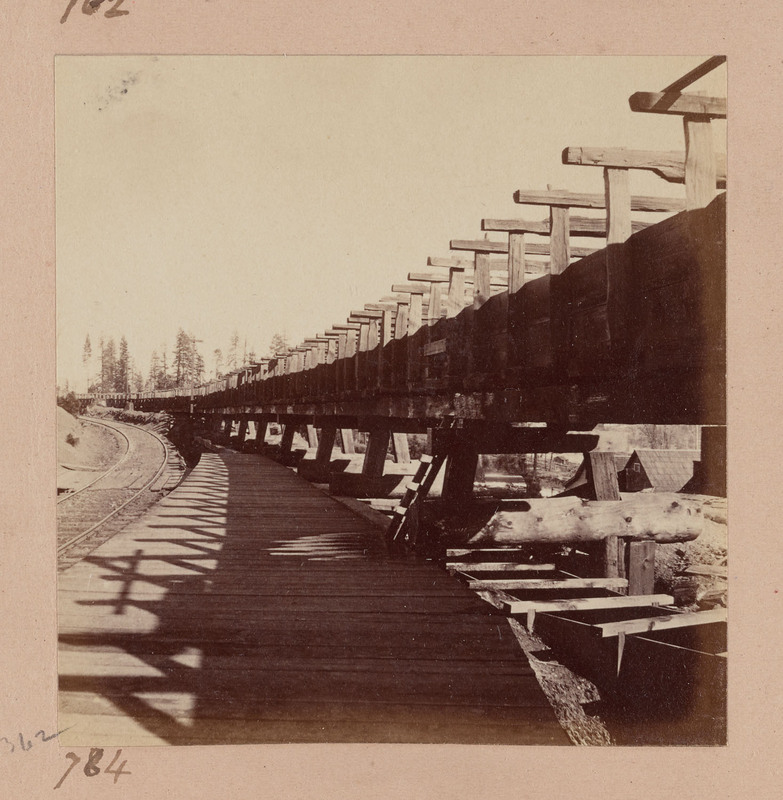 867 Muybridge: Trestle and crossing of the American River, near Sacramento, 5,145 feet long. 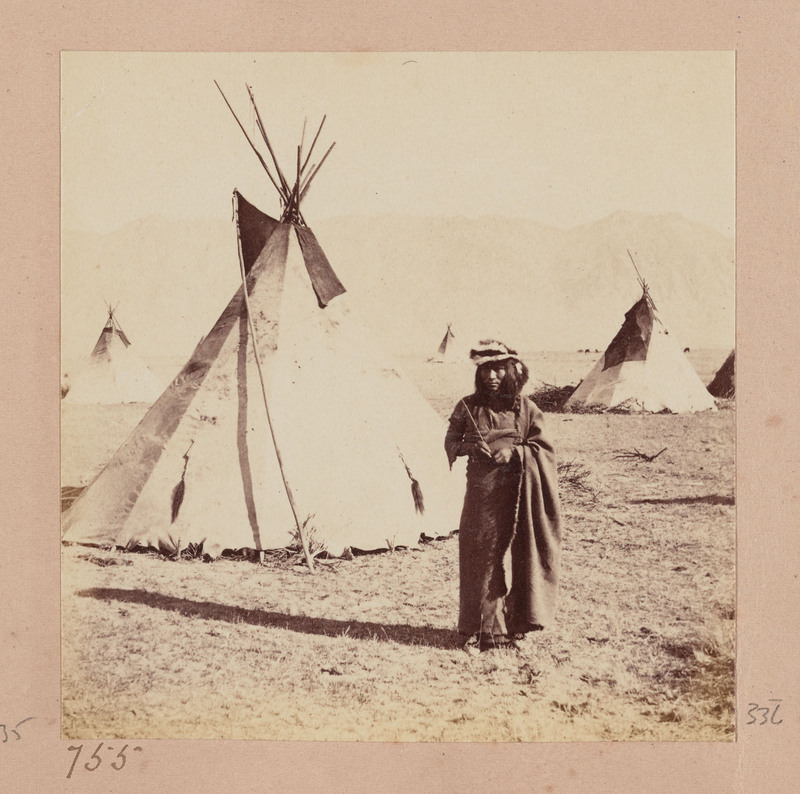 CATALOG ... [June] 1873. 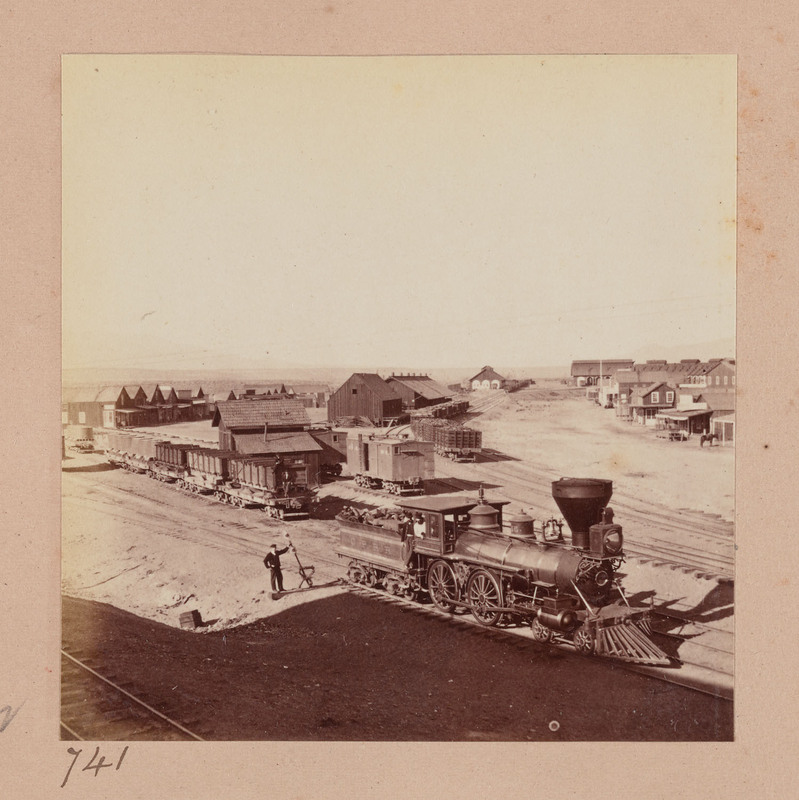 See p. 18: "CALIFORNIA PACIFIC RAILROAD. 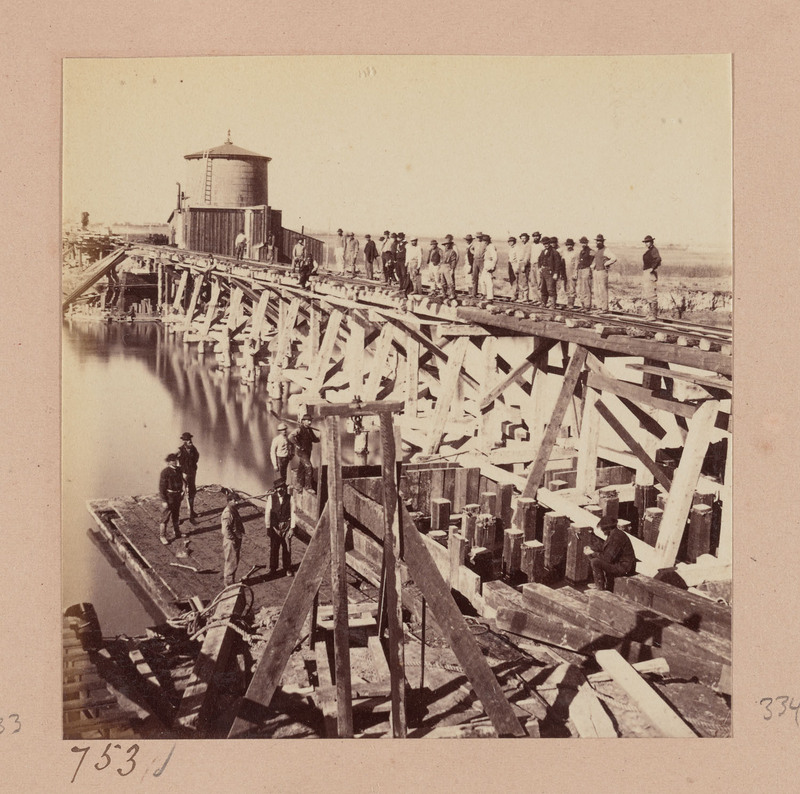 ..."
961 Muybridge: Crossing of the Sacramento River at Sacramento and Wharves of the C. P. R. R.
Links to images at the California Digital Library Website, Bancroft Library, U.C. Berkeley, "Muybridge (Eadweard), Lone Mountain College Collection of Stereographs"
from combined information from Willumson, Kibbey, Palmquist, Swackhamer, Ryan, National Stereographic Association - Holmes Stereographic Research Library, and others. Copyright © 1988-2008 CPRR.org. All rights reserved.